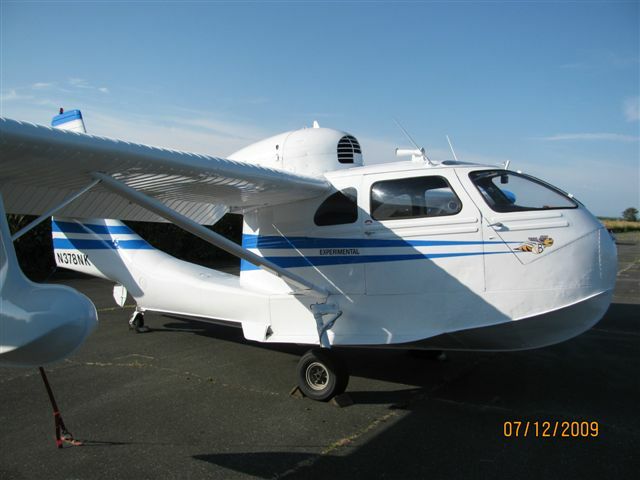 Below are the Seabee's that we know are for sale or trade. If you would like to list yours just drop us a line and we will list it here for you...FREE! One thing though, if you sell it LET US KNOW so we can take the ad off the website. To make a listing just send me the "N-number", serial number, photos and the contact information (e-mail, phone number, etc.) I will not list anything you tell me not to. E-mail me at smestler@pbtcomm.net. 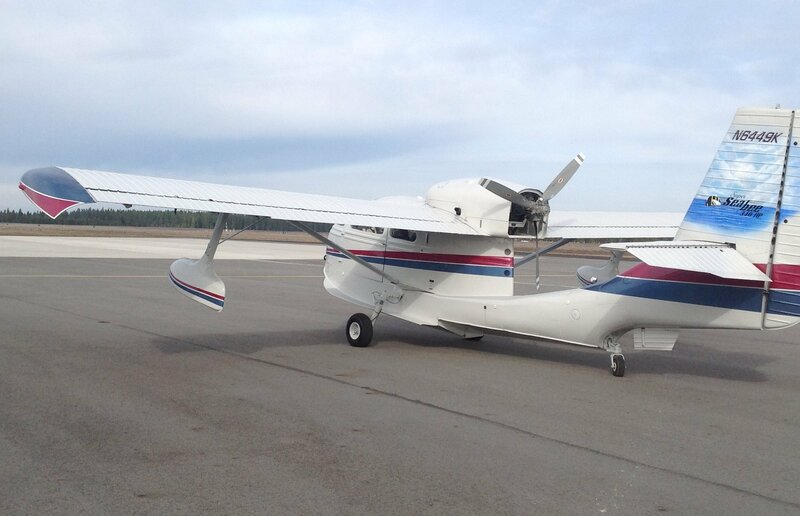 For a list of SOLD Seabees click here. These are left here for your information only to compare what is out there. WARNING!! Scammers are out there! "I would like to warn the other club members that a number of scammers monitor this newsletter. I have had two offers that were complete scams. It works like this. I get a call and an offer. The buyer then says he will send a deposit in the form of a cashiers check. When the deposit comes the check is for $3000 more than requested. 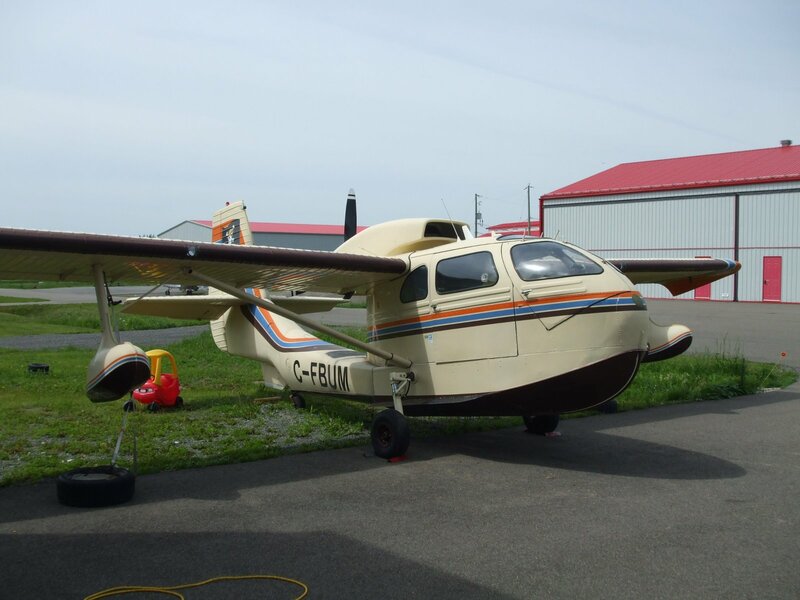 I then get a call that the buyer is leaving for a foreign country for a couple months and has found an inspector to come and check out the aircraft. The inspector will call me from Los Angeles and will need the $3000 for expenses. Please cash the check and send him the money when requested. I took the check to my local bank and they sent it to their fraud department. It was a great looking check and I was told that they would have deposited it in my account and that I would have been able to draw on it had I not requested a fraud check. They also said that if it bounced the money would be withdrawn from my account. It was, of course, a counterfit check." Get a pre-buy inspection done! Download a pre-buy checklist here. I'm sure this list needs "tweaking" so let me know what additions to make and I'll add them to the list. Also get a title search done before you buy. 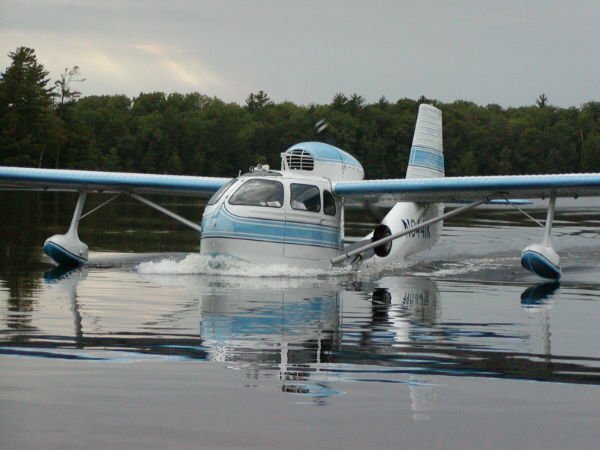 AOPA and the SPA (Seaplane Pilot's Association) can help you with that. 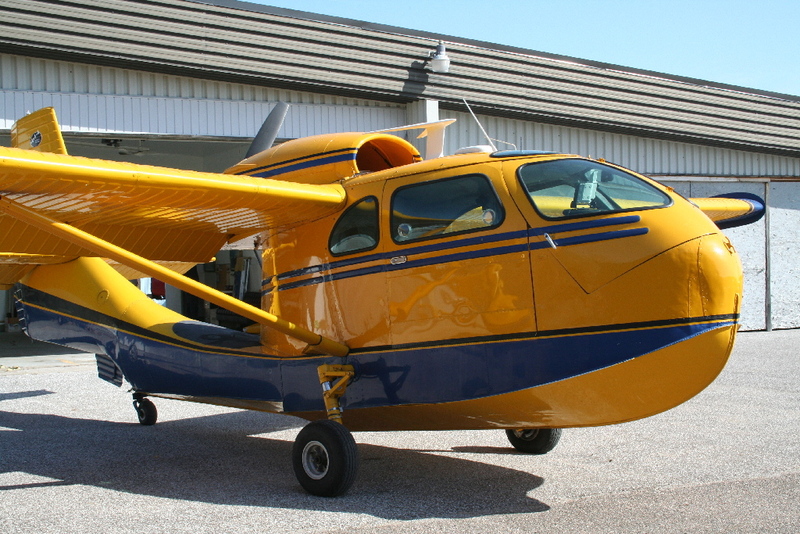 "Should I buy a Seabee?" 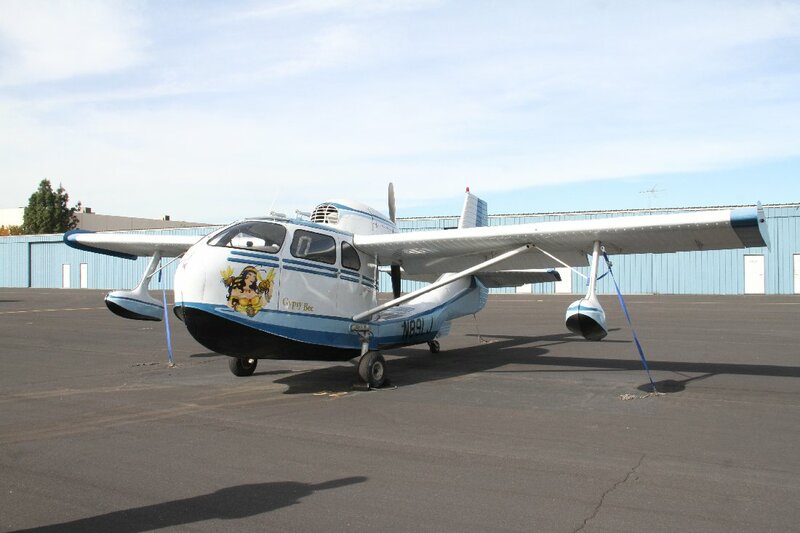 is a list of FAQ's by potential Seabee purchasers. I'm sure there are more questions so I will add to the list as they come in. 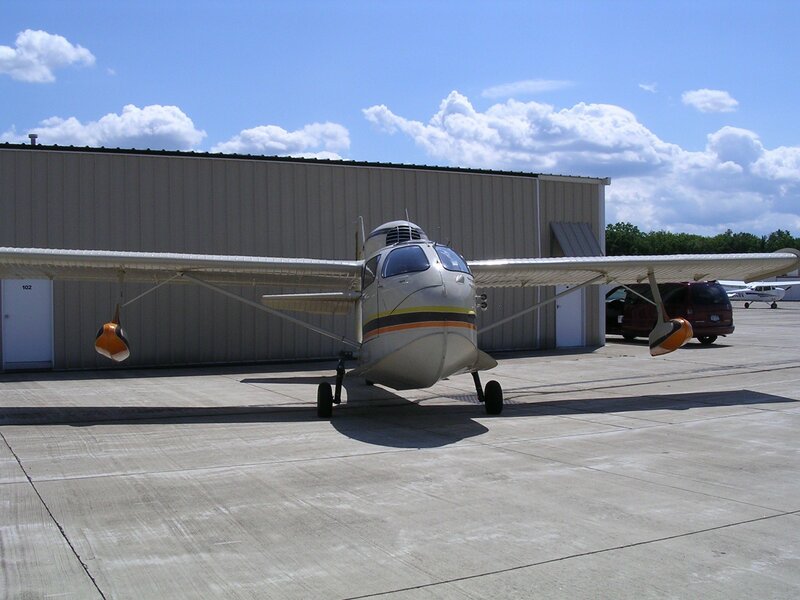 A "FREE" SERVICE OF THE "INTERNATIONAL REPUBLIC SEABEE OWNER'S CLUB"
We have had inquiries, from time to time, as to what a prospective Seabee buyer should look for, to insure they would get a sound airframe and engine. 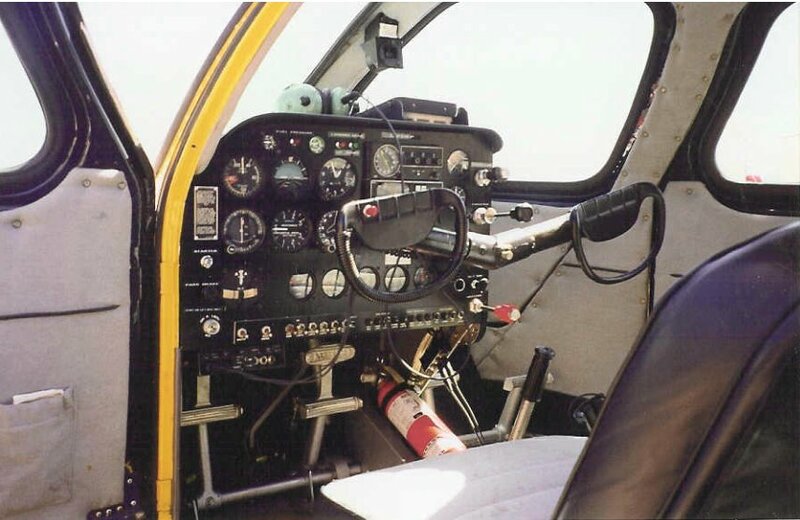 To be able to offer an answer to this question, I asked several members which included old time Seabee pilots and at least two A/P mechanics to advise me. After due consideration, it occurred to me that Donn Booth's observation that "a buyer must remember that Seabees are all around 50 years old. Some have been used in corrosive salt sea water that, over a period, tends to render them unseaworthy". Some have been left unhangared and ravaged by the elements. Others have been damaged and poorly repaired. 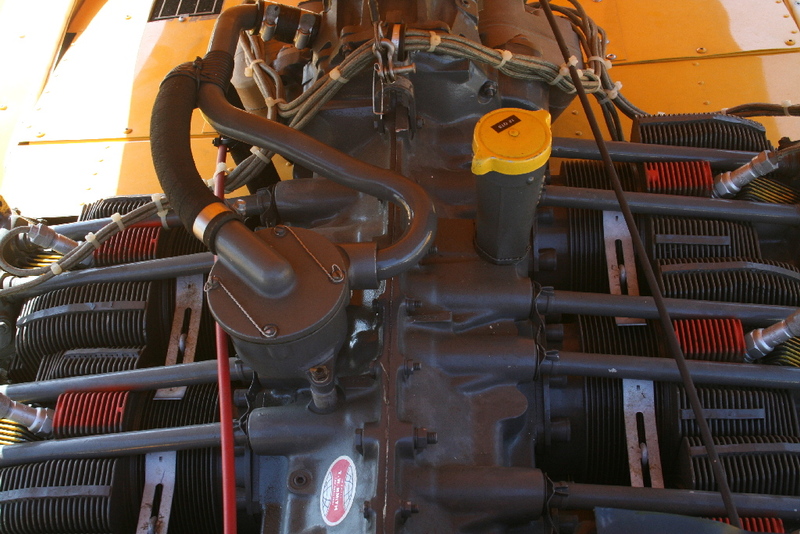 Engines may have been operated beyond normal limits for long periods of time. Donn's conclusion? 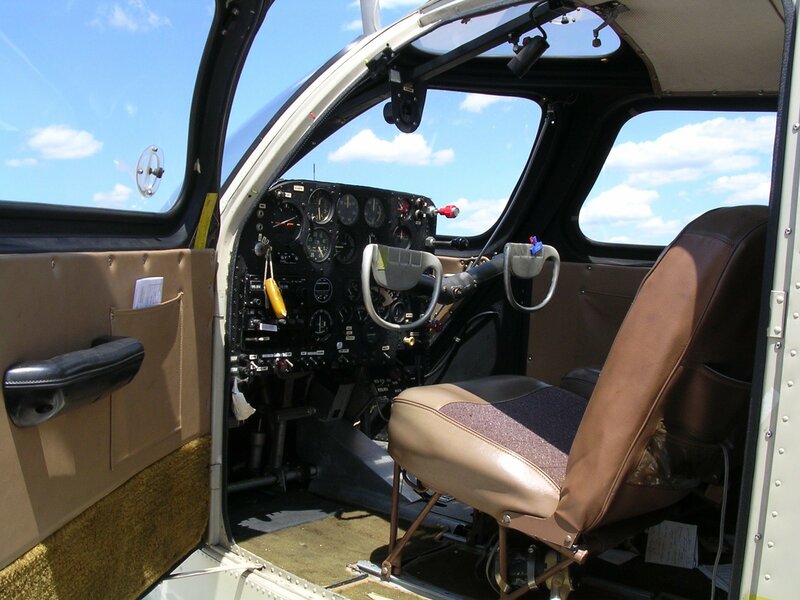 Avail yourself of the best airframe and powerplant (A/P) mechanic you can find and authorize him to inspect the aircraft and advise you in this most difficult decision. "You can also require the Seller to guarantee those items which come into question". I heartily recommend you accept Donn's advice. IF YOU BUY OR SELL, PLEASE NOTIFY US! We encourage you to contact and deal directly with the seller. Thank You! Steve for the IRSOC. Not responsible for ad accuracy. 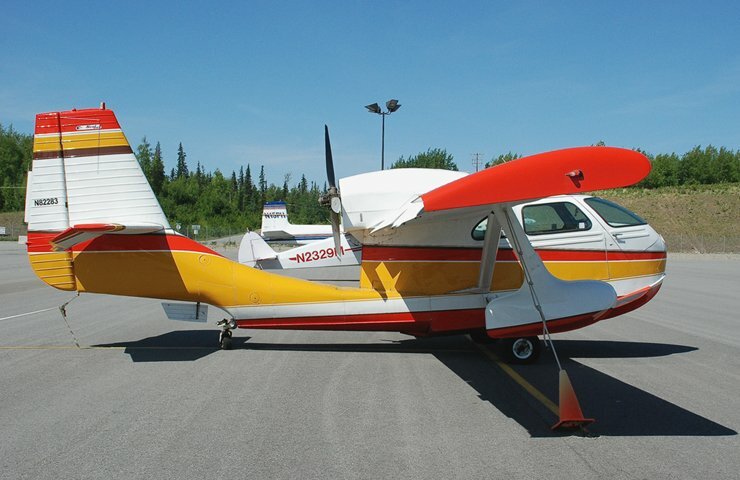 Ok, it ain't a Seabee but it is a good friend of mine listing this Aztec. He is my hangar neightbor and lost his medical. 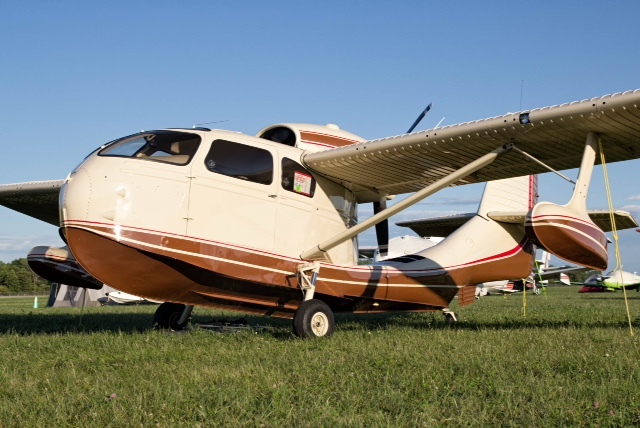 The Aztec has always been hangared and needs a good home. Read the specifications here. Located in Gilbert, SC. 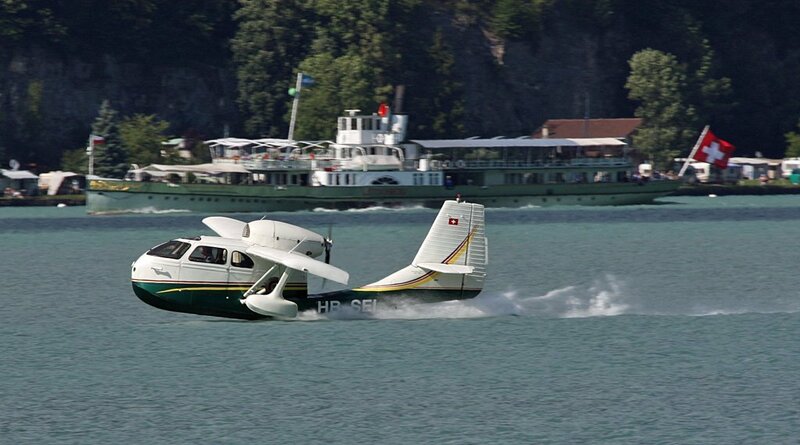 ONE OF A KIND, Lycoming TIO-540 350 HP. 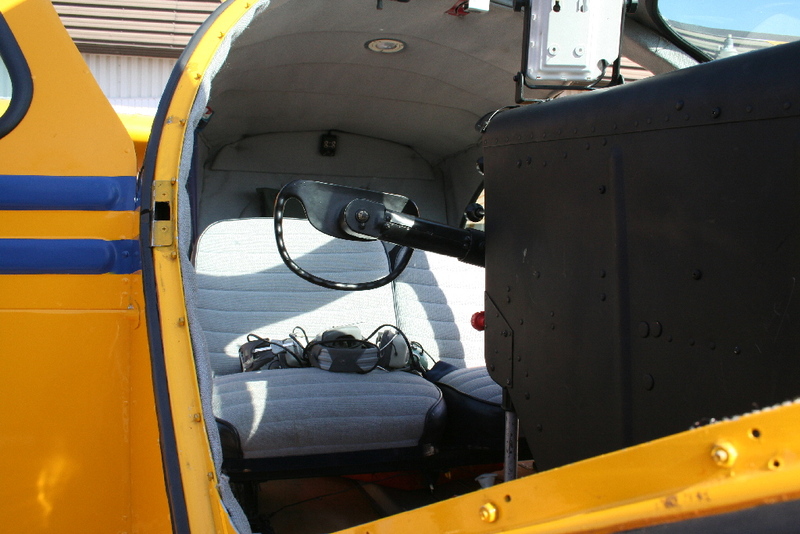 Hartzell reversing prop with spinner assembly, overhead controls, manual turbo control, intercooler, overhead switch panel (starter, fuel boost, left and right mags), overhead lighting, overhead cabin vents, overhead phone and mic jacks, pilot/copilot bucket seats, rear bench seat (removes in 15 seconds), Cessna style trim wheel between pilot and copilot, electric rudder trim, all new circuit breakers and switches, 24 volt system (dual Odyssey 12 volt batteries, gain of 32 lbs. 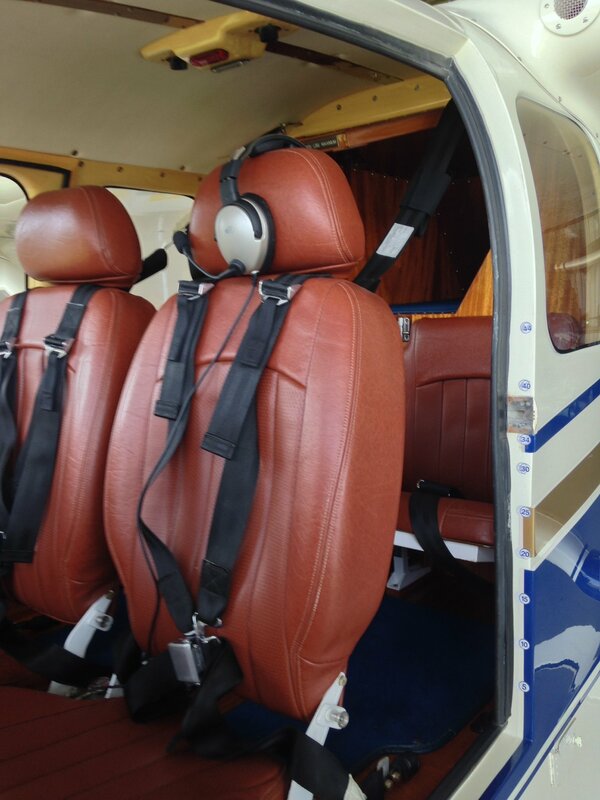 useful load), shoulder harness front seats, cabin fan, heater, PS Engineering PAR200A Com/Audio, Garmin GTX-327, GPS496 (in panel), Narco Nav-122 VOR/LOC/GS, Dynon D-10A EFIS, Angle of Attack Probe, Insight G4 engine monitor, custom Aero Logics dual Manifold Pressure Lower deck/Upper deck gauge, landing gear selector and flap selector on panel, electric hydraulic pump, smoke windshields and windows, flush mount windows, flush main door handles, custom interior, extended baggage area, aileron cable re-route, baggage compartment lighting, custom bow door prop, wide spray rails, hull step vents, hull strakes (boosters), Cleveland brakes, new AERO Black Discs and pads, solid rubber tail wheel, wing gap seals, Camlocs for all fairings, top cowling hatch, droop wing tips, LED wingtip lights and strobes, LED anchor light, LED tail light, heated pitot, retractable LED landing light, aux fuel tanks (25 gal. 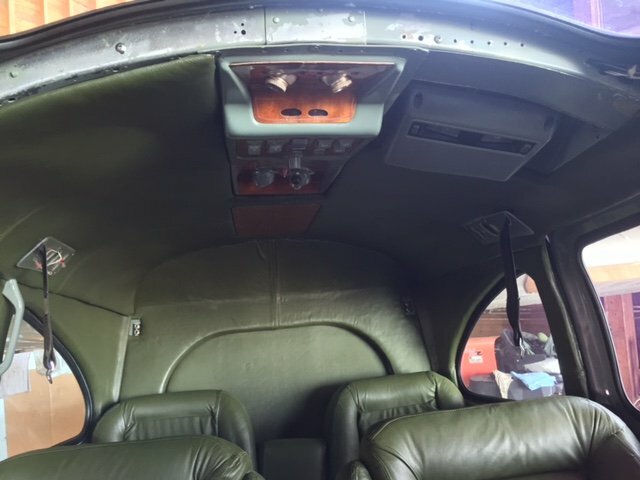 ), 87 gallon main fuel tank, 112 gallons total, all flap and gear retract cylinders are rebuilt, hydraulic system flushed, paint 8/10, interior 8/10. 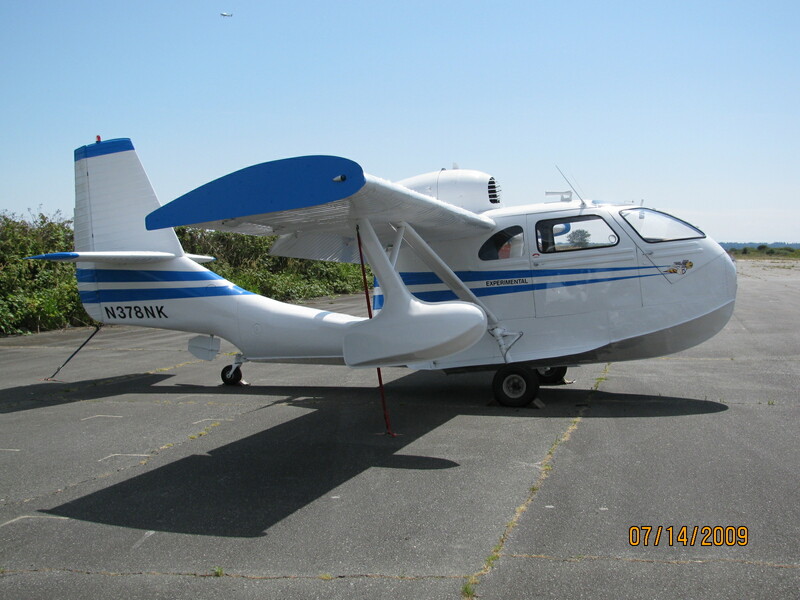 Aircraft has a tight hull, performance is fantastic, low noise, just a great Seabee to fly, light on the controls. 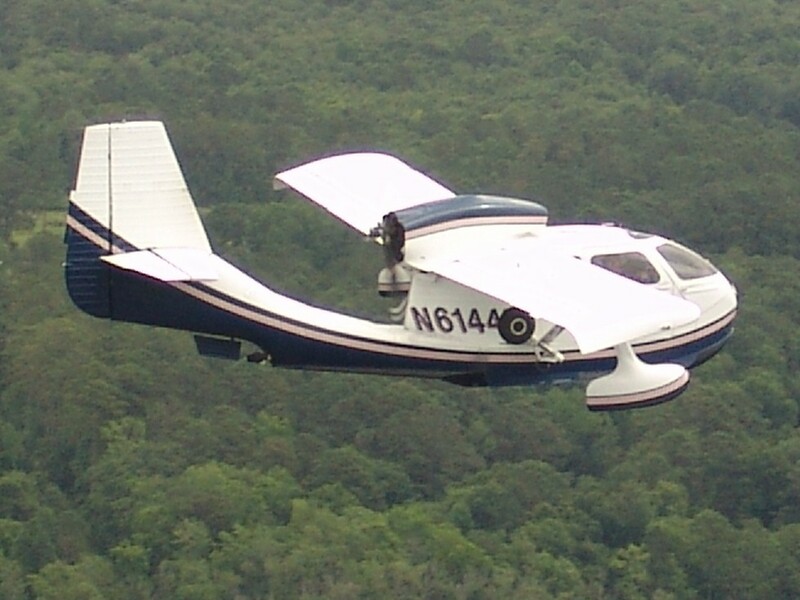 Call make arrangements to fly this TurboSeabee, aircraft is worthy of a one of a kind. No disappointments here. $225,000. 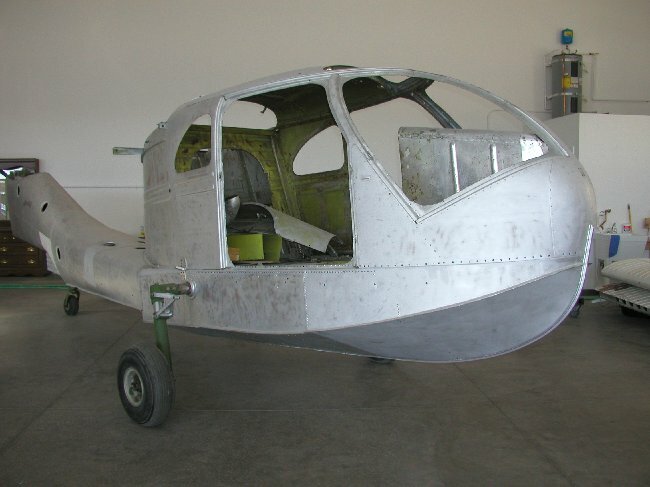 Also available, spare Hartzell 3-bladed prop for this conversion. Rare. 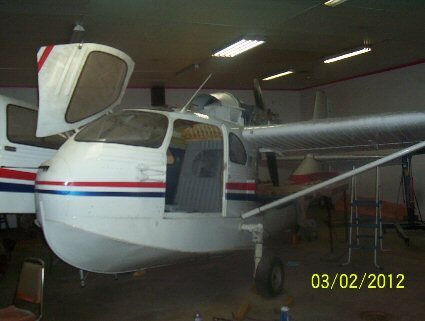 Up for sale is my Seabee project. 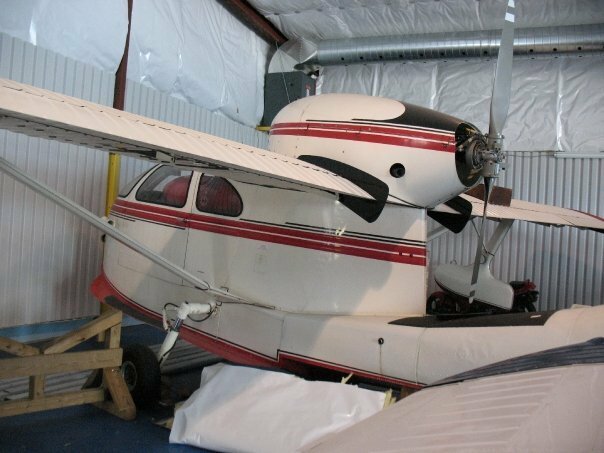 I've owned the aircraft for a decade and have yet to start the restoration. 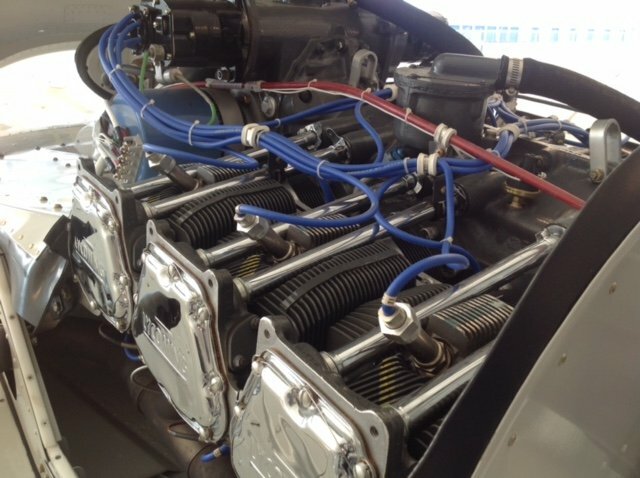 It was my intention to install a Robison V-8 Conversion, however, due to a divorce and the resulting financial realities, this project will sit even longer. 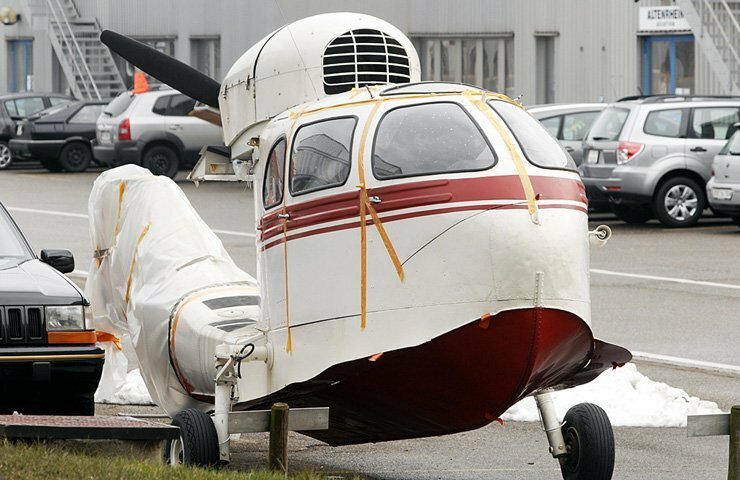 That seems unconscionable to me; so, I hope this exceptional aircraftâ€™s new owner will restore it quickly, and get her back in the air where she belongs. 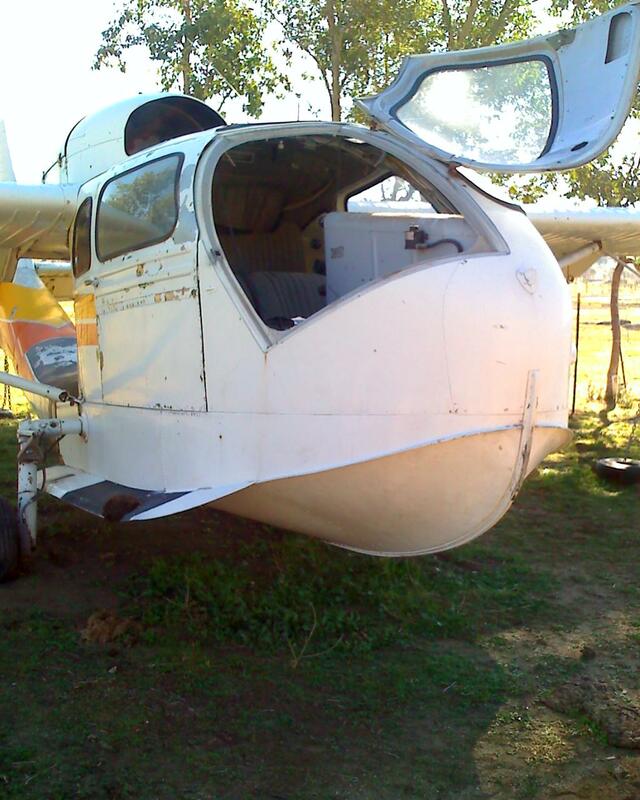 This aircraft has no corrosion and is in very good dismantled condition. 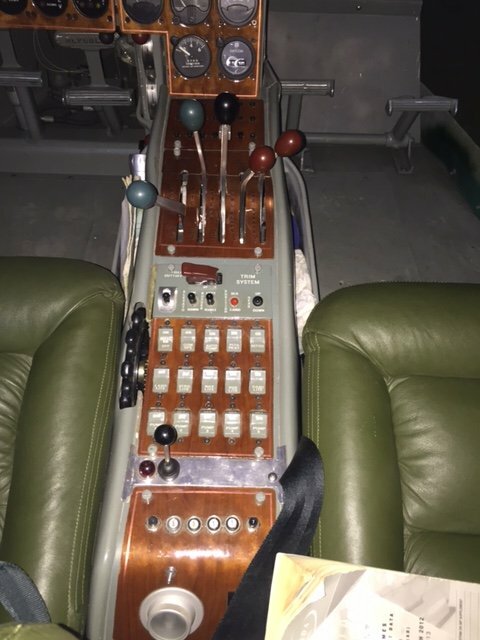 The logbooks are through 1985. 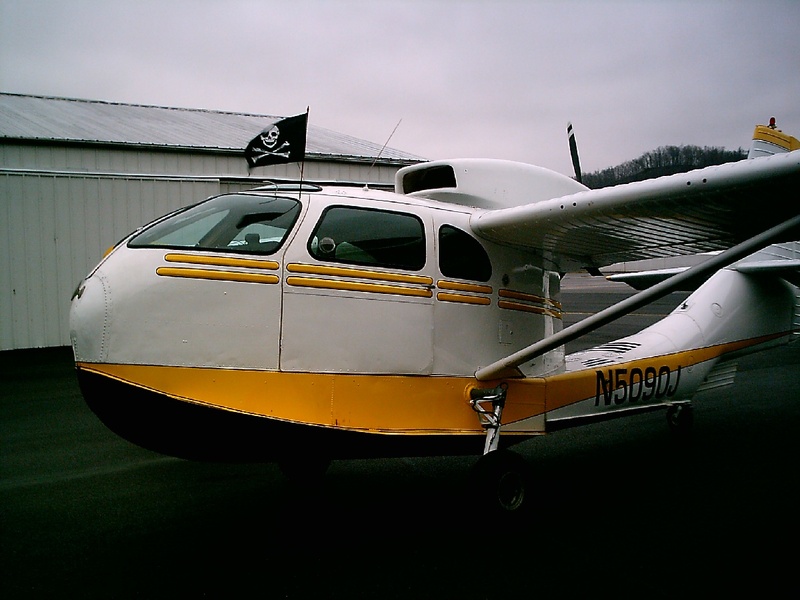 This Seabee had an TIO-540 installed in the 90's and apparently flew several flights with that configuration, when the owner passed of natural causes. 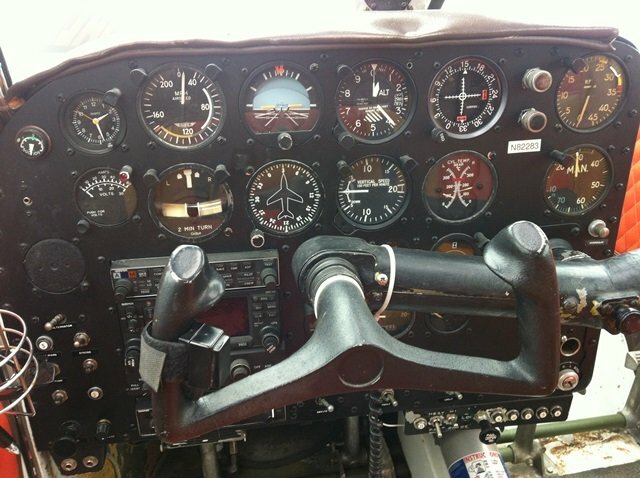 His daughter decided to sell the engine/instrumentation and that is what is missing to date: i.e. 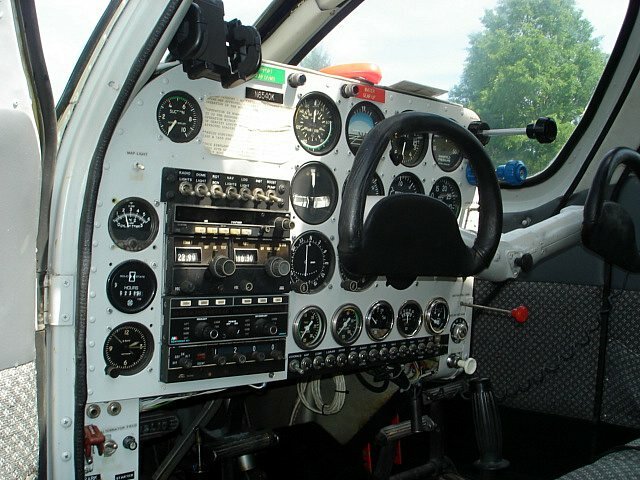 a compete aircraft minus the engine/instruments. 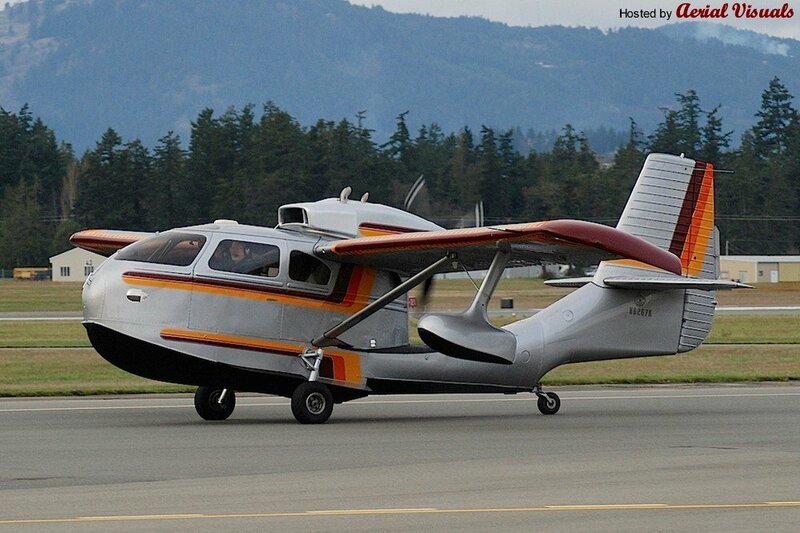 This is an excellent candidate for the Robinson conversion. 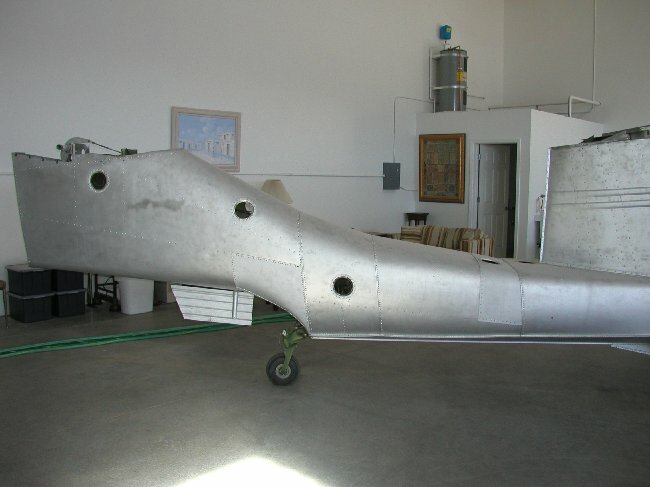 The aircraft is located in my hanger in Sanger, California and will be sold with the wing stands and fuselage cradle. If you have any questions please feel free to call. 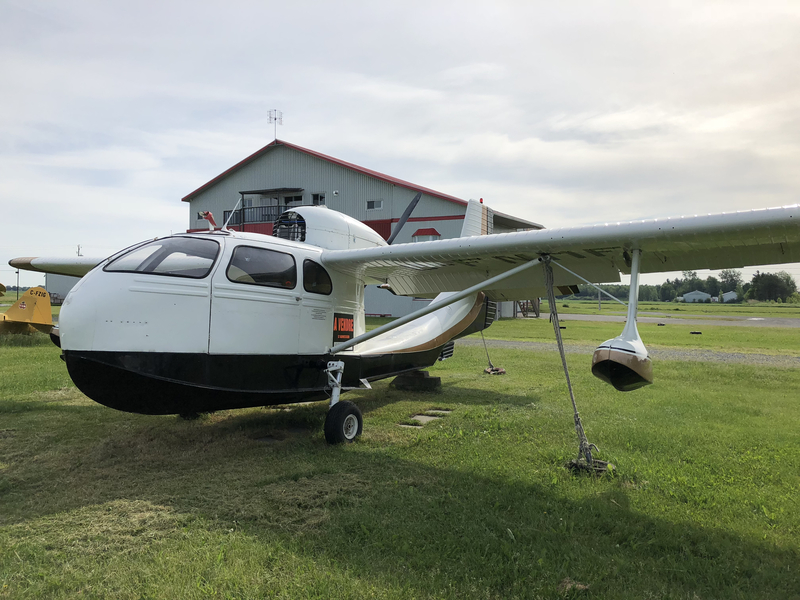 Homebuilt Seabee for sale. 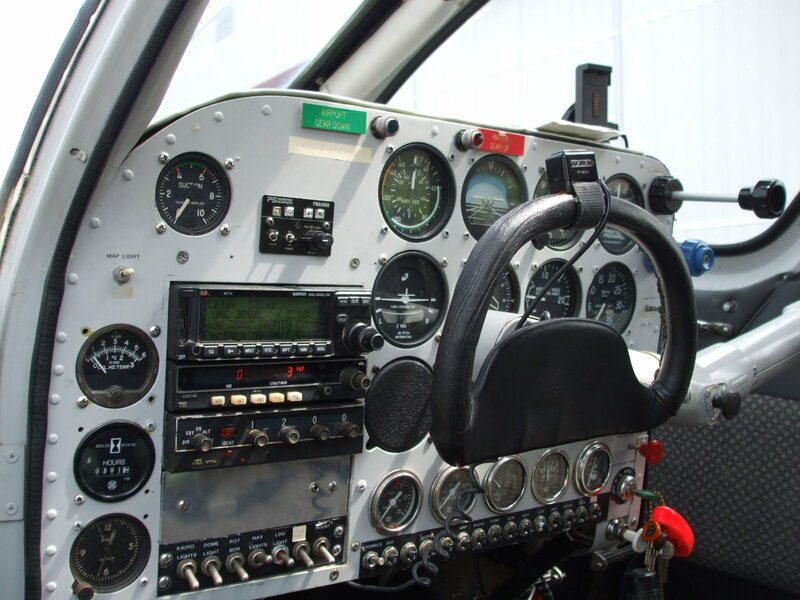 Airframe total time 1549 hours, Robinson GM engine conversion. 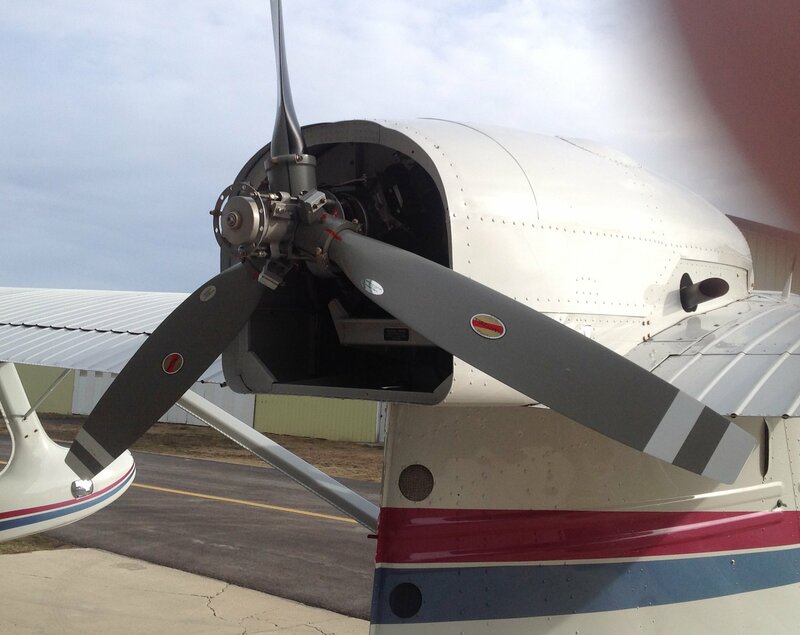 Propeller total time 1010.5, 36 hours since overhaul. 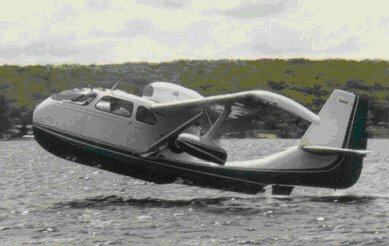 Spencer S-12 Air Car (design purchased and produced by Republic Aviation as the Sea Bee) for sale. 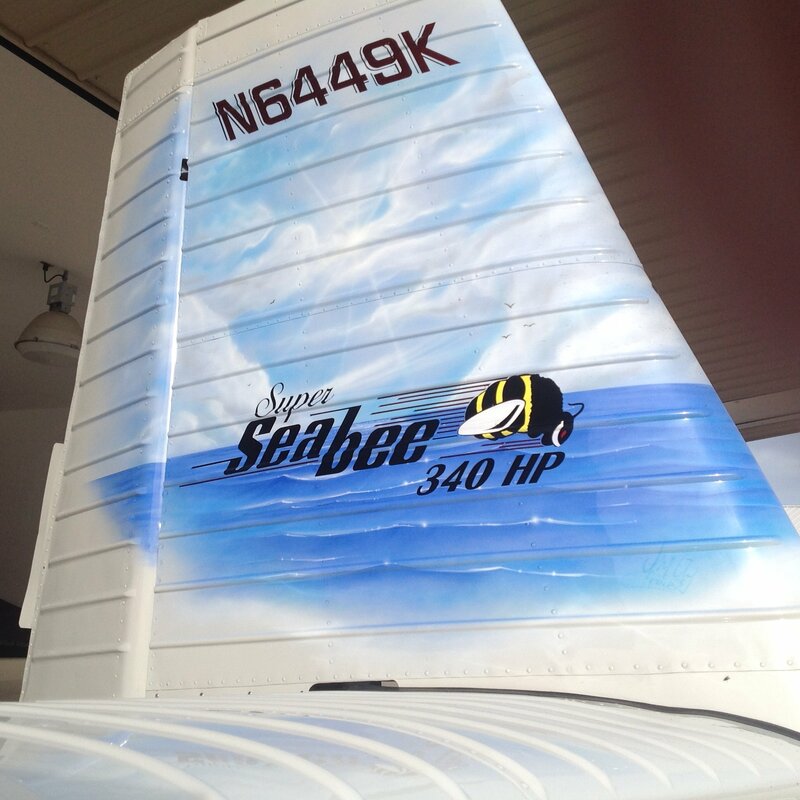 Simuflight G0-480-G2D6 “Super Bee” upgrade. 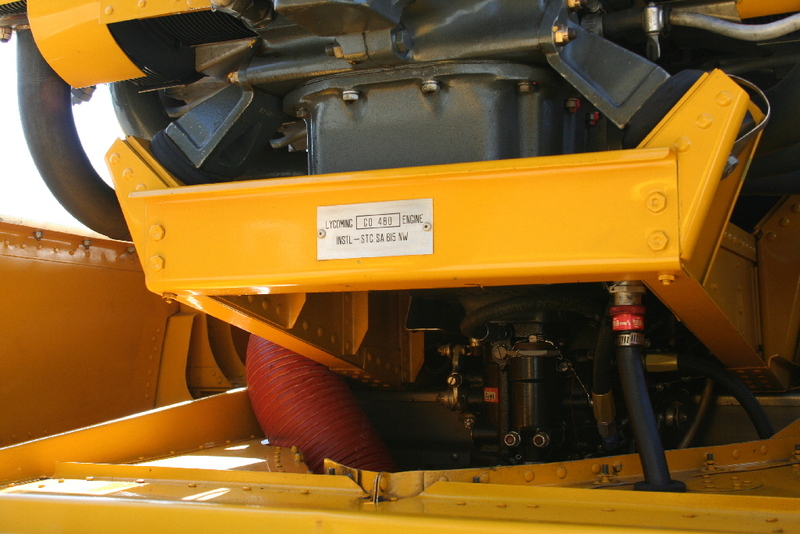 295 hp GO-480, 230 hours since overhauled in 2006. 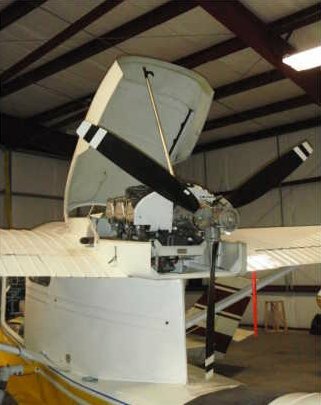 Three Blade Hartzell Reversible Propeller, 280 hours since new, installed new in 2003 to eliminate Hartzell recall/inspection issues. 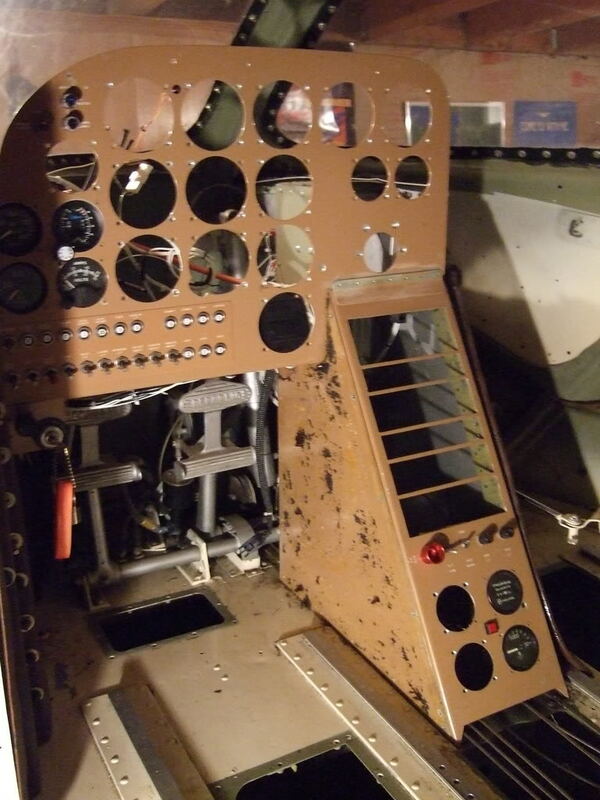 Old prop, good for parts, included with sale. 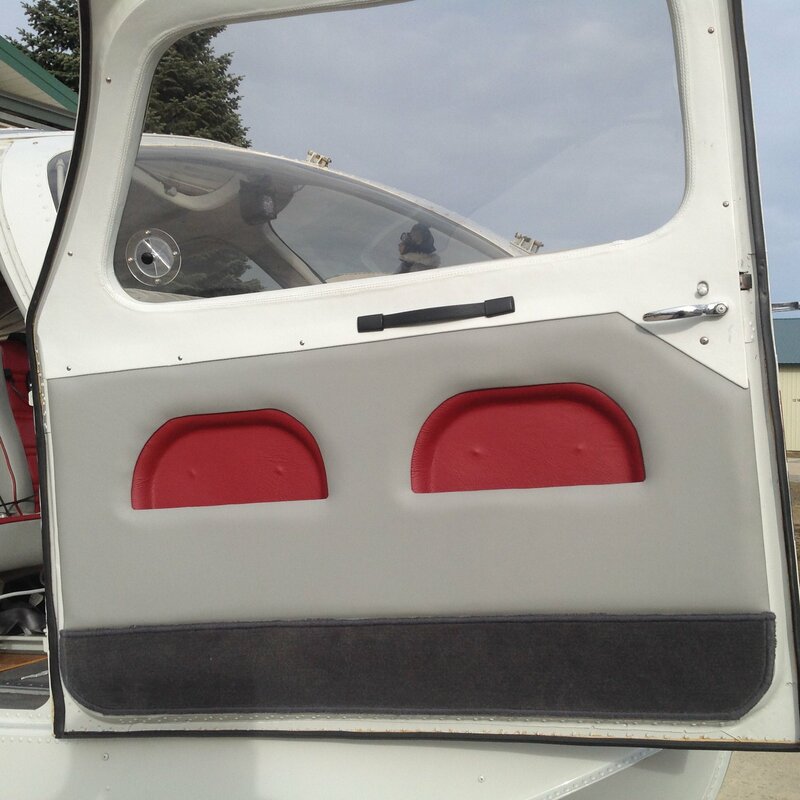 Light Weight Fiberglass Droops Wing Tips. 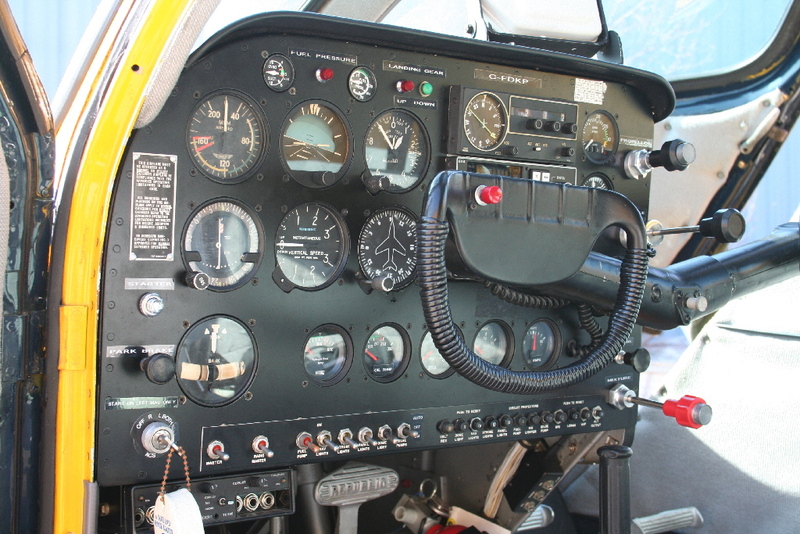 Garmin Audio Panel w/ 4 Place Intercom System. 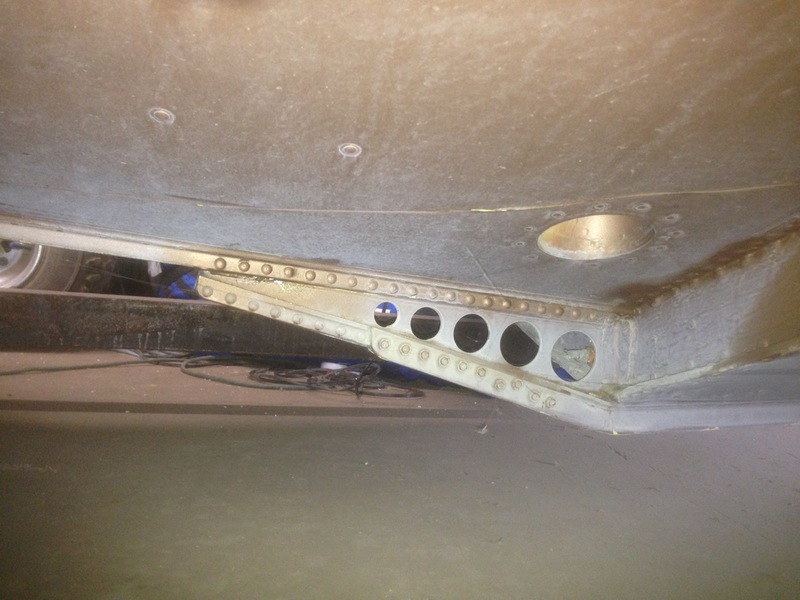 Wing extension & tips, Large spray Rails, Cleveland brakes. KLY 135A, KY 97A, KT 76A, Engine Analyzer, UBG-16, MUX-8A, Black box data recorder. 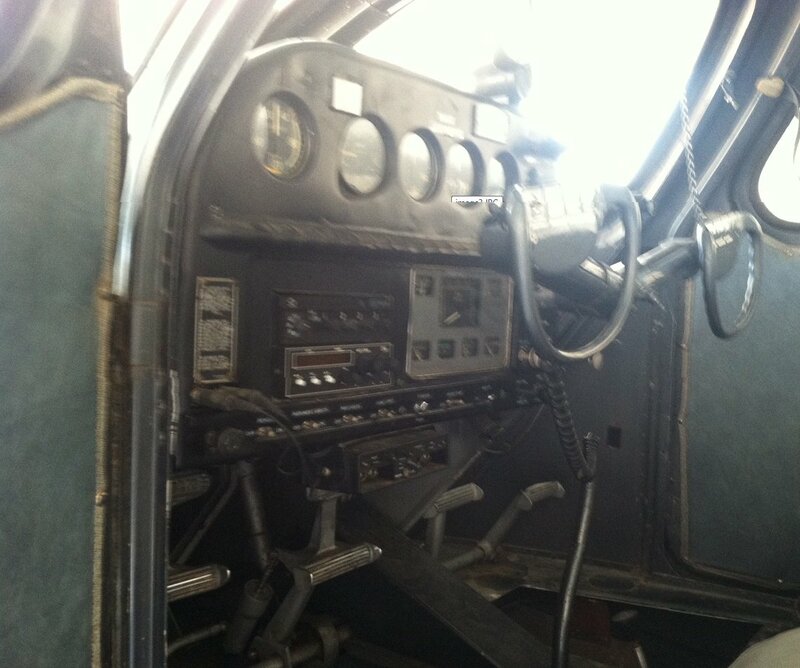 KING 720 COMM Trimb 1000 GPS TRANS Mod C New Glass, paint & interior. 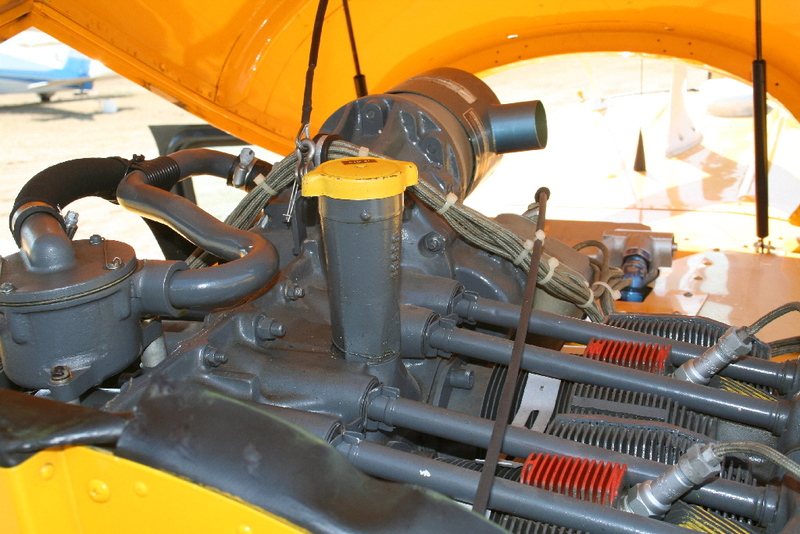 Engine is a Lycoming GSIO-480 340HP. 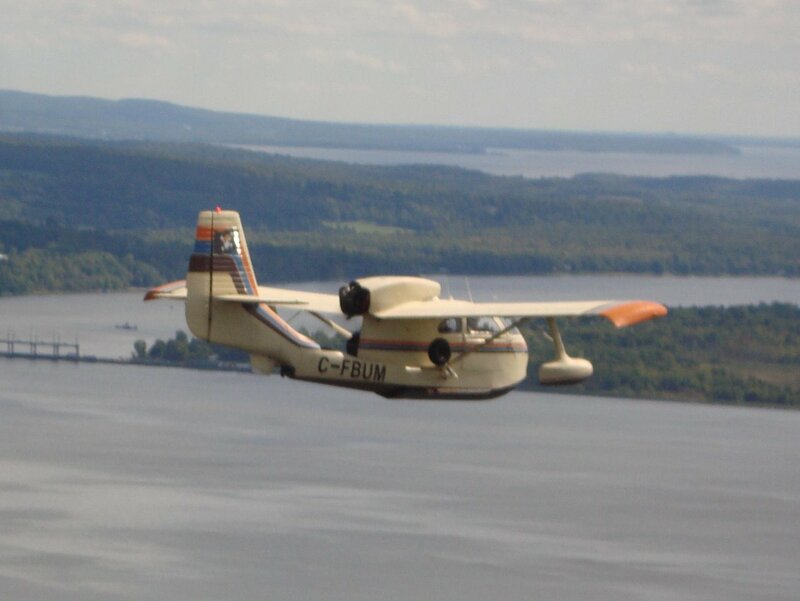 The aircraft is located north east of Quebec City Airport and ready to go. 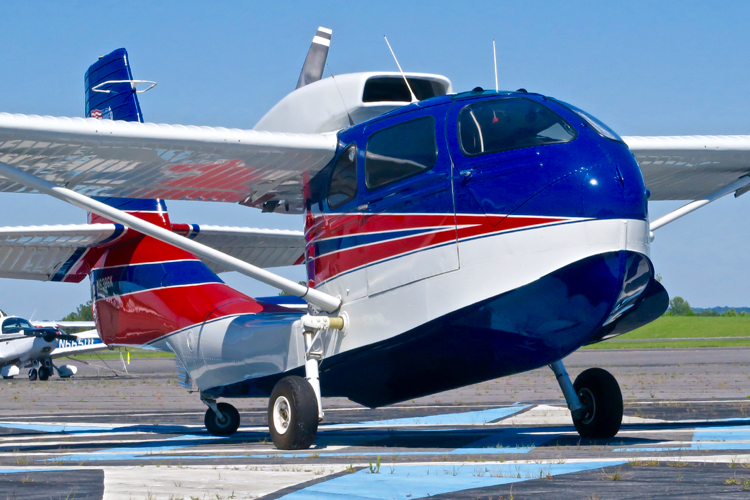 MODS: STC’s and 337 field approvals for; 16” wing extensions, Flap extensions, droop tips, wingtip strobes, landing/taxi lights, wig wag recognition lights, heated pitot, 180 degree cabin door hinges, hull strakes, Cleveland breaks, electric/hydraulic gear and flaps, electric trim, adjustable rudder trim, underseat storage lockers, baggage compartment mod, rear cabin window mod, Reiff engine pre-heat system, Airwolf remote oil filter, control yoke mod, individual adjustable cabin seats. Much, much more. Check the NEW specification sheet here (PDF). 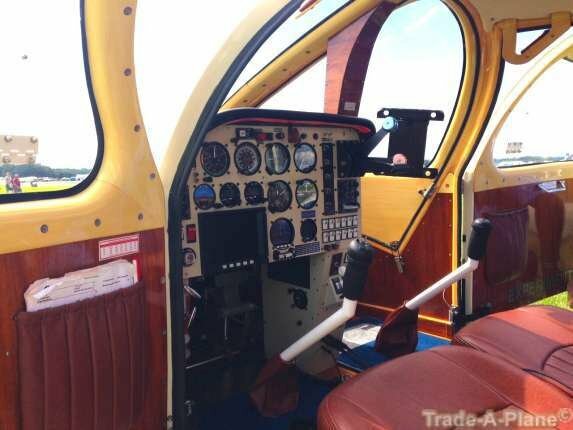 Buzz Hale is selling his "ThunderBee". Oshkosh Grand Champion 2011. Check out the specs here. 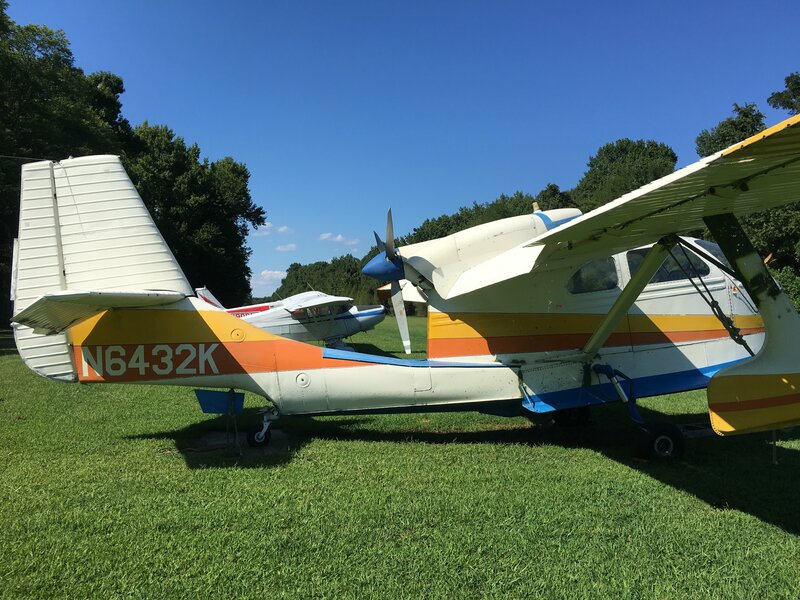 1748 TT, GO-480-G1B6 295HP, 705 SMOH, NEW PROP WITH NO ADS, 55 SPOH, IFR PANEL, STEP KIT, OVERHEAD ENGINE CONTROLS, LARGE SPRAY RAILS, STOL WING TIPS, CLEVELAND BRAKES, ENLARGED WINDOWS, LANDING LIGHT, STEWART WARNER HEATER, DEPTH FINDER, BILDGE PUMPS, STROBES, STEERABLE TAILWHEEL, 4 POSITION INTERCOM, KING RADIOS WITH G/S, ADF, TRANSPONDER, TONS OF SEABEE PARTS, EXTREMELY WELL MAINTAINED, CHECKOUT INCLUDED. Call Jim Ikard at (410) 620-5885 or e-mail at ikard2000@comcast.net . No logs , needs to be reassembled. Reported 9.1 Hours on engine . 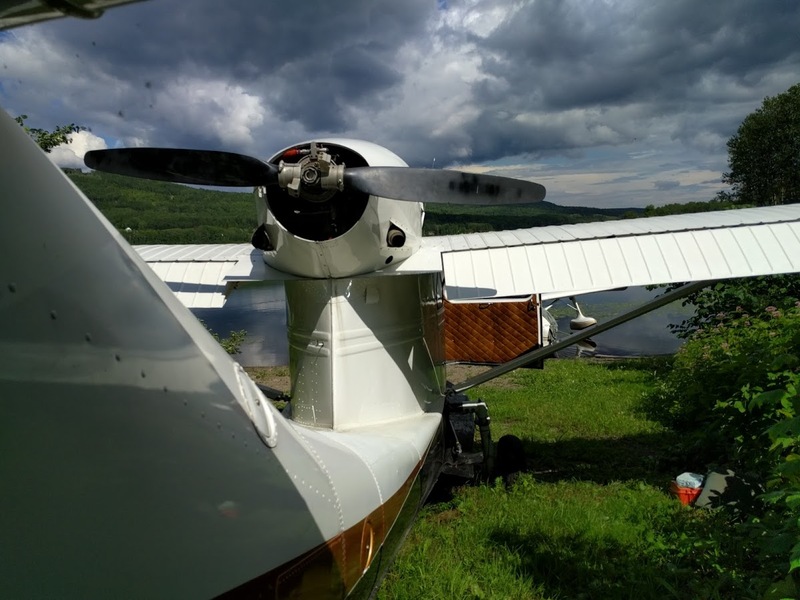 Family friend reported taking Franklin engine to Mr. Brumm in NY for overhaul . Extra parts , holds fuel. 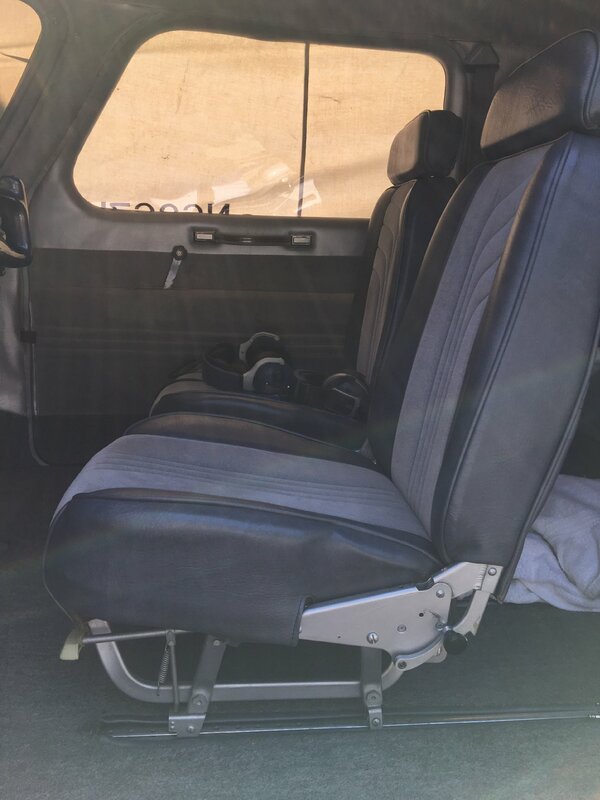 4 bulge pumps Needs front seats and L Eisman Mag (bad coil). Two sets of wings , extra sponson supports , many extra parts. 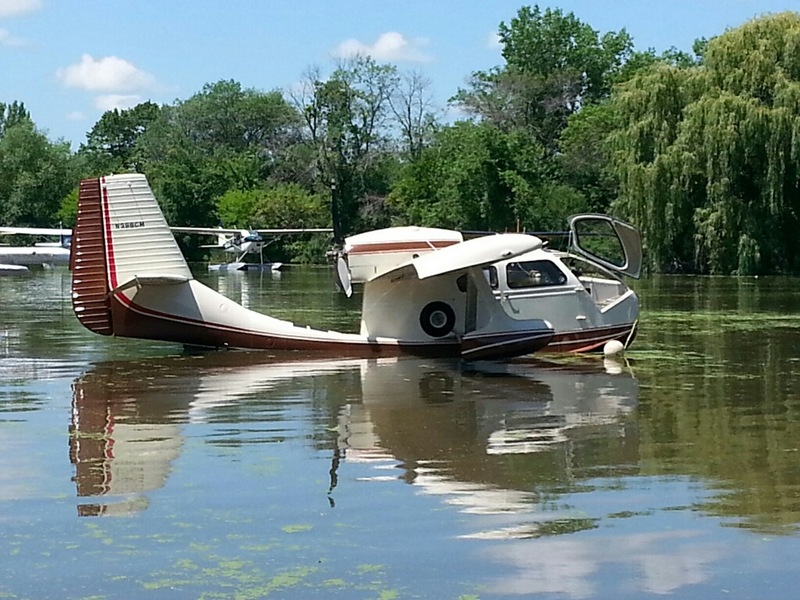 Located at KTVC, Traverse City, MI. 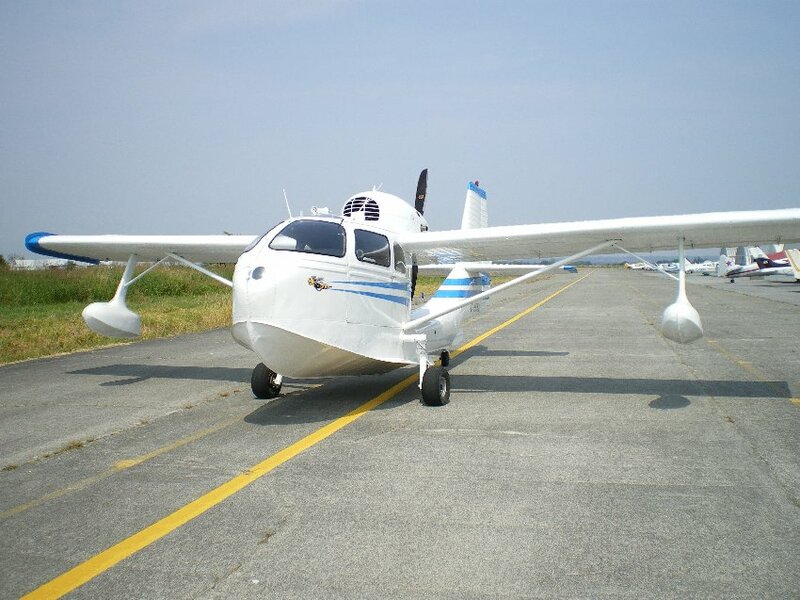 One Seabee, TIO 540 Lyc and low time propeller. 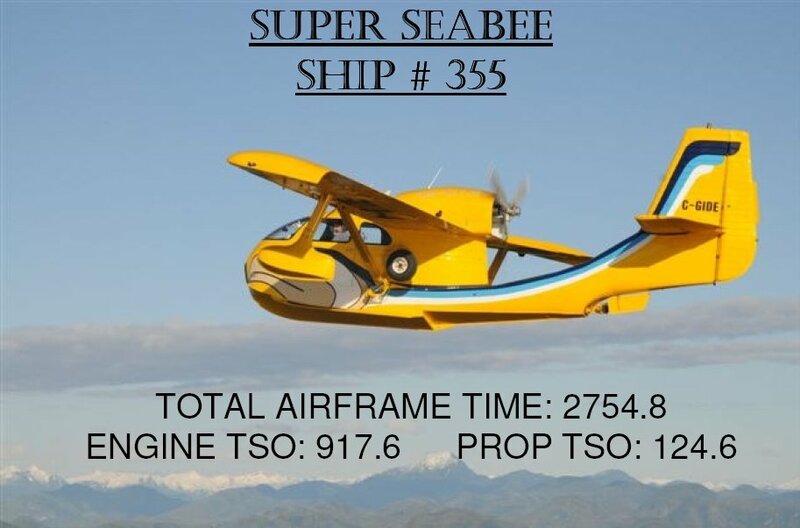 99% of all parts for the SeaBee are there, just a lot of labor. 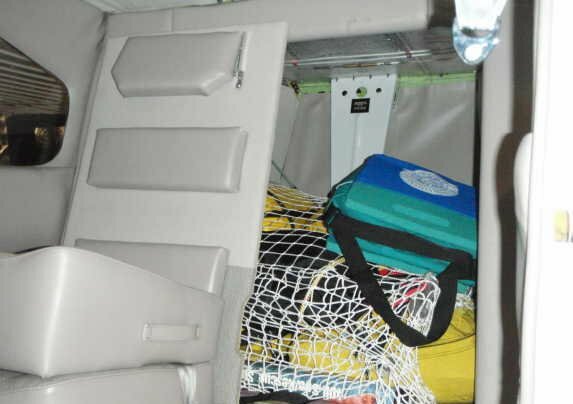 Items for the engine install will be needed. 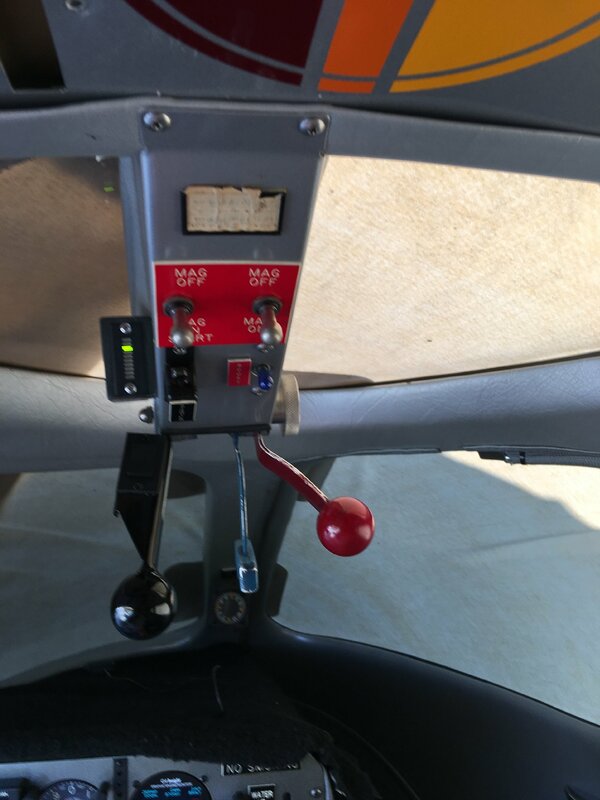 The prop is "0" TSMO. Lots for extra parts, sold some but a lot more left. Don't want to part things out. Medical problems, closing down my business. Update: Much work has been done since the initial posting of this ad. Photo #5 - 7 new. Added 01-29-2018. Out of health. Out of time. Out of money. Two Engines. 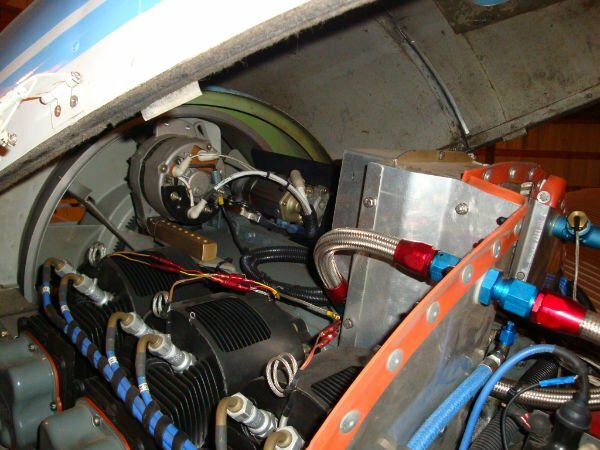 Should be able to combine into one serviceable engine. 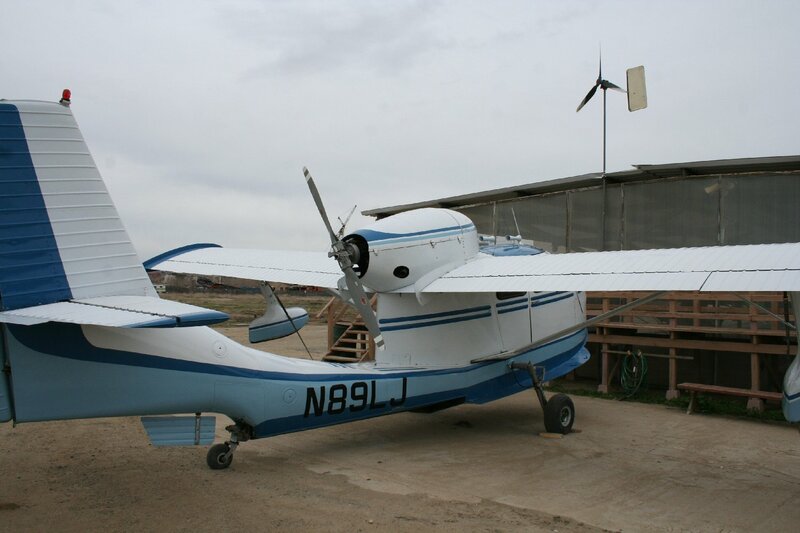 new 2-bladed fully-reversing prop (in box), new STC alternator system, new electric fuel pump, new tires and tubes, new STC brake system, new bearings and powder coated wheels, new fuel bladder, new fittings on bottom of wing struts , new fuselage fittings to struts. rebuilt hydraulic pump, rebuilt gear extend-and-retract cylinder, serviceable axles, engine stand, steel workbench, serviceable crankshaft and camshaft. 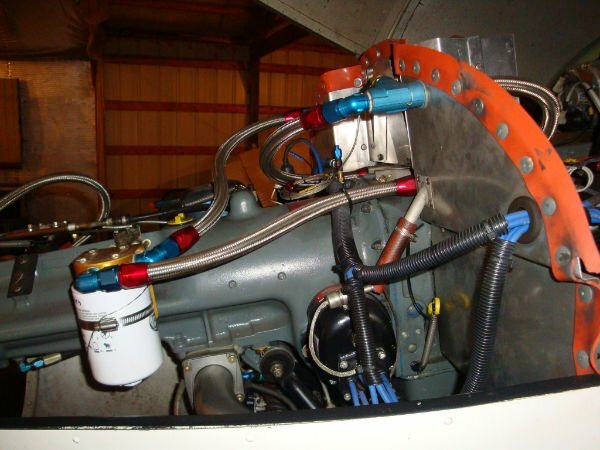 Many extra engine and aircraft parts. 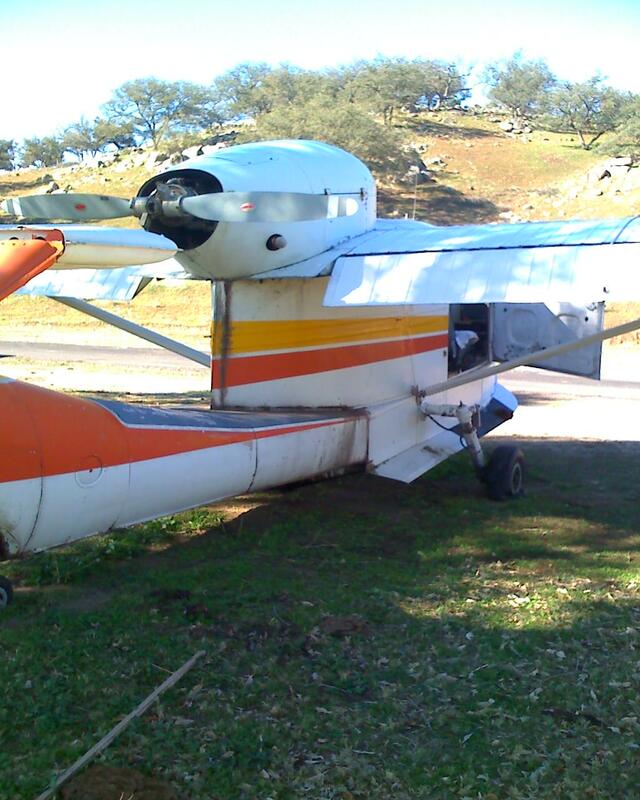 Engine, fuselage and wing stands included. Contact Don Maxwell, Sr. at lndmax@aol.com or call (732) 493-3964. 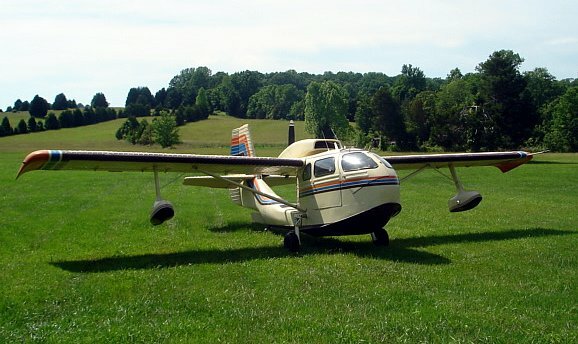 Complete Seabee Airframe. Serial #172. Many enhancements. Was planned for experimental Corvette but not required. 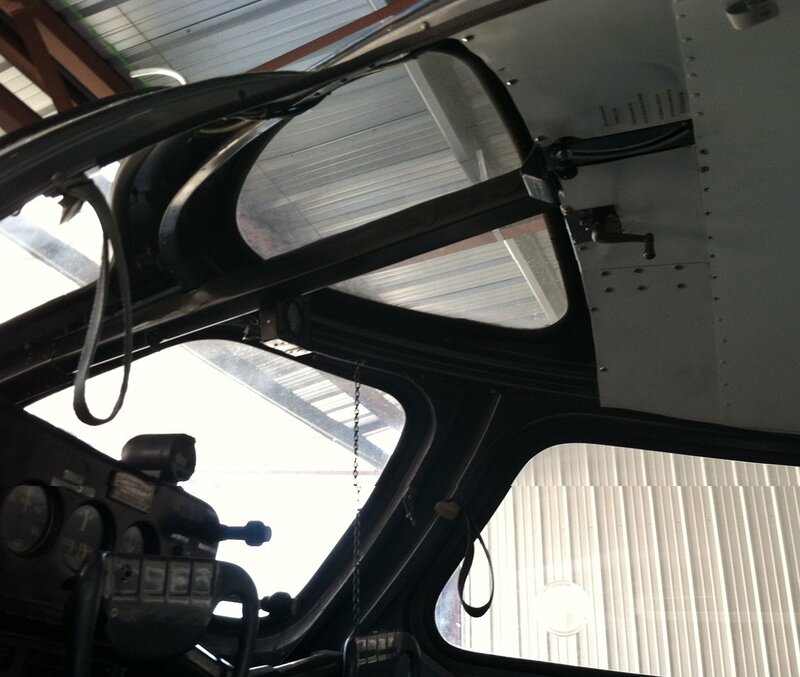 Fuselage and empennage soda blasted. 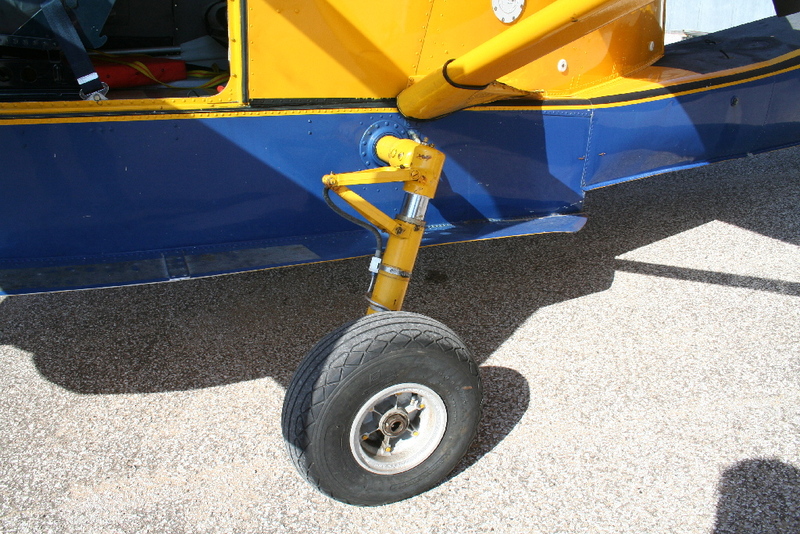 Tail wheel rebuilt. 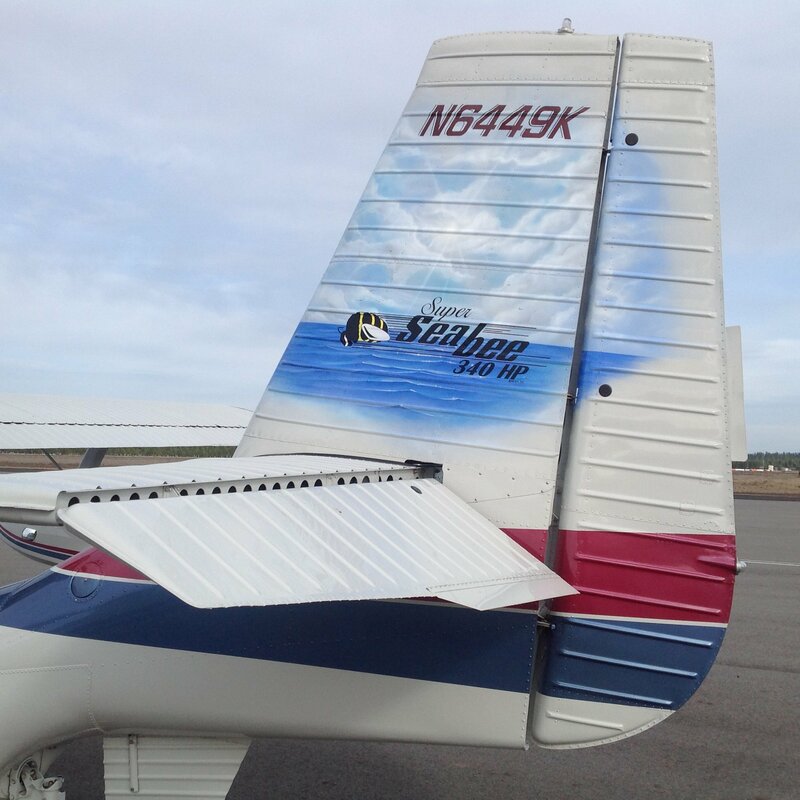 Special drooping-aileron wings. All windows new and complete with good tires. New, undrilled, wide spray rails. 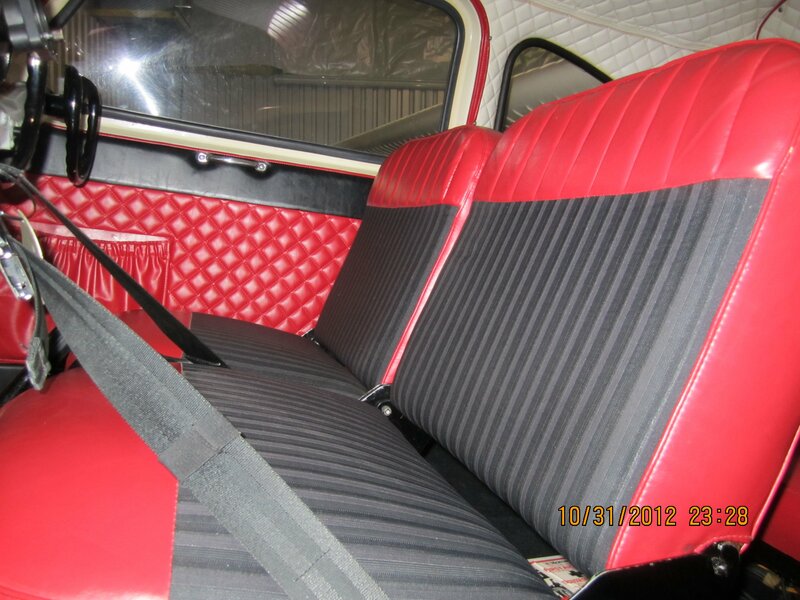 Seats, cushions and some upholstery. 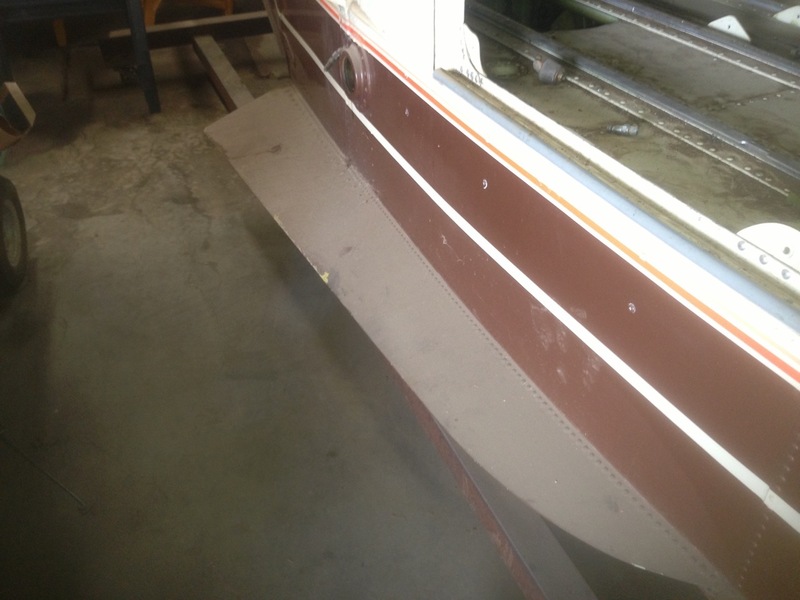 Minor wing-tip damage. Franklin B9F Overhaul by very reputable engine shop. 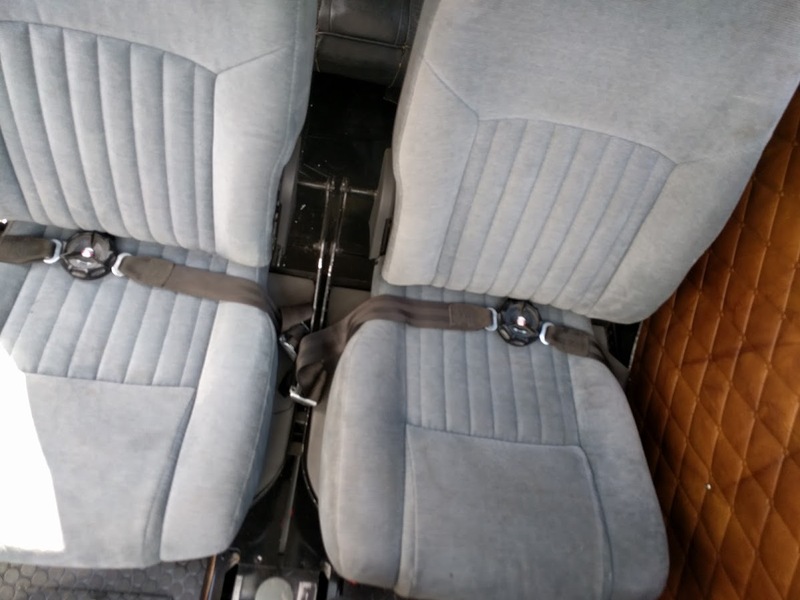 Kenmore Wing Extensions, Cleaveland Brakes, Wide Spray Rails, Strobe Lights, New Tires. 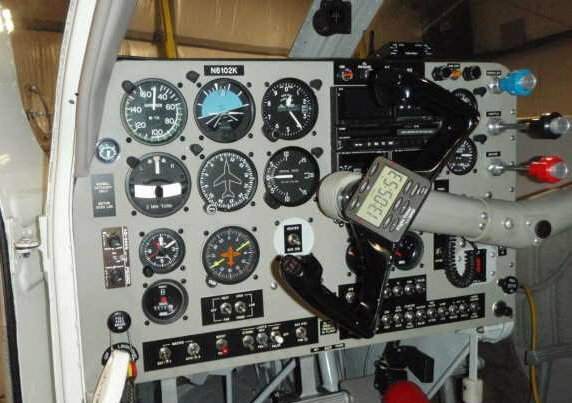 Electronics International: R-1 Tachometer, UBG-16 Engine Analyzer, FL-5 Fuel Flow. 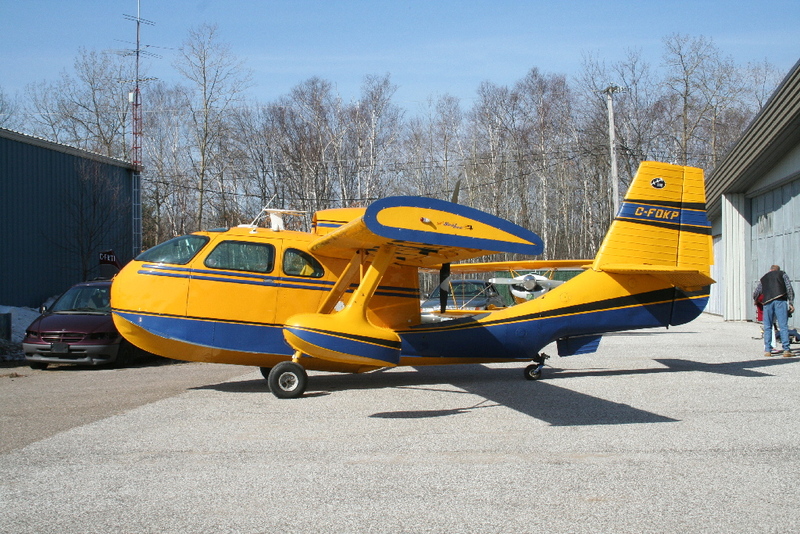 Super SeaBee Oshkosh award winning Outstanding Amphibian 2009. 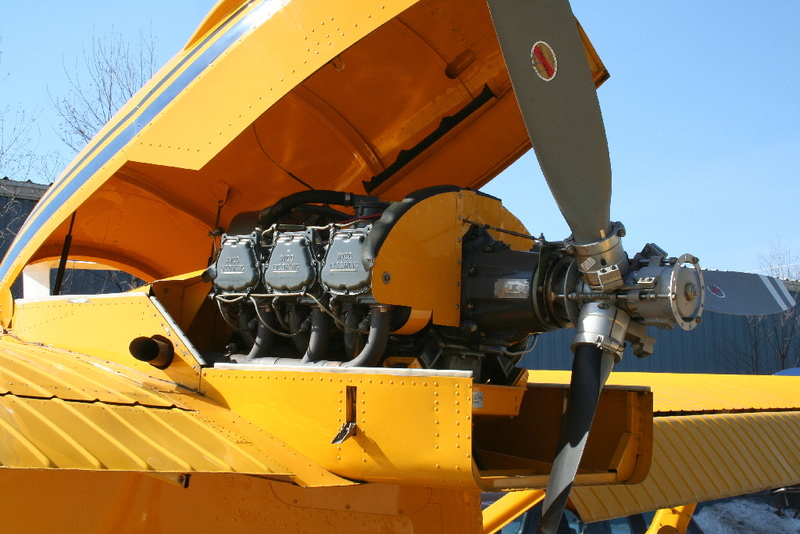 IGSO-480, 340HP 3 Blade Hartzel Rev Prop. 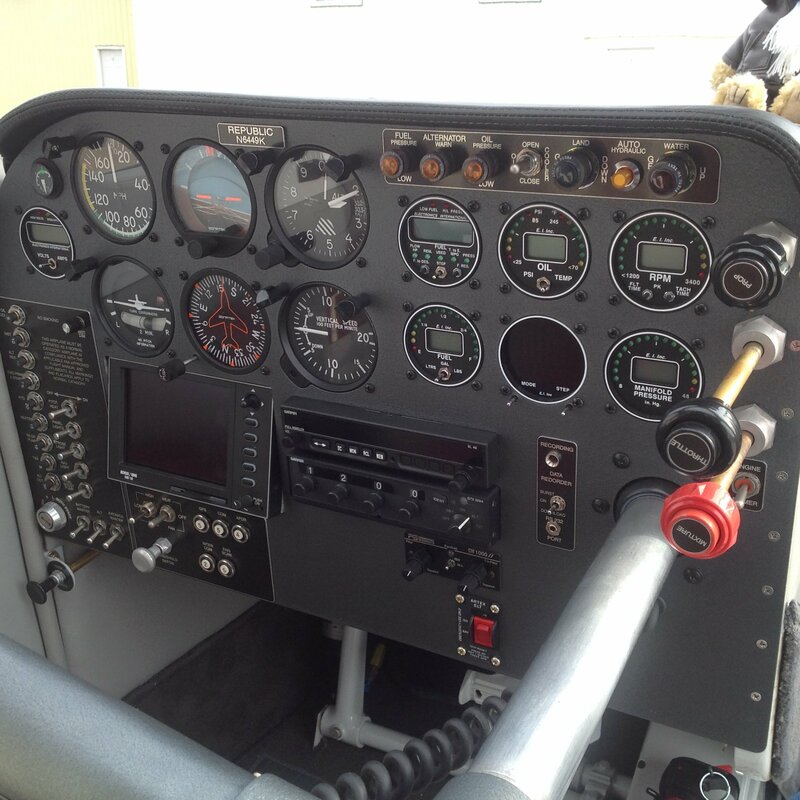 TT1739, SMOH 476, Prop 223, Droop Tips, Large Spray Rails, Piper Seats, Cleveland Brakes, Flight Inst Corp Graphic Engine Monitor, SkySport Fuel Monitor, Custom Naval Paint Theme, Val 760 comm, Narco AT50A, Narco Nav122 vor/loc/glideslope, Moving Map GPS, ELT, Spin-On Oil Filter. All STC''s and 337's. 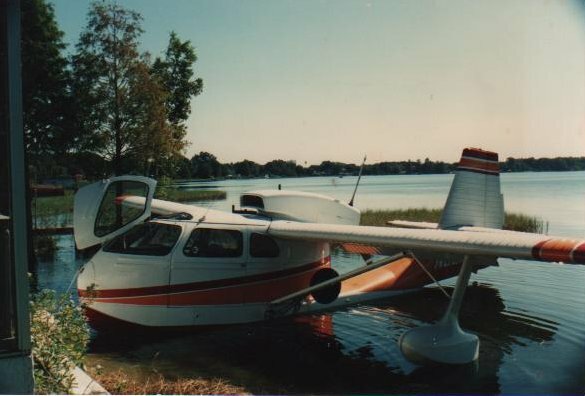 Brother passed this last year, this was his baby, Never in salt water, Always hangared, Based in north Florida. Price reflects need for annual. 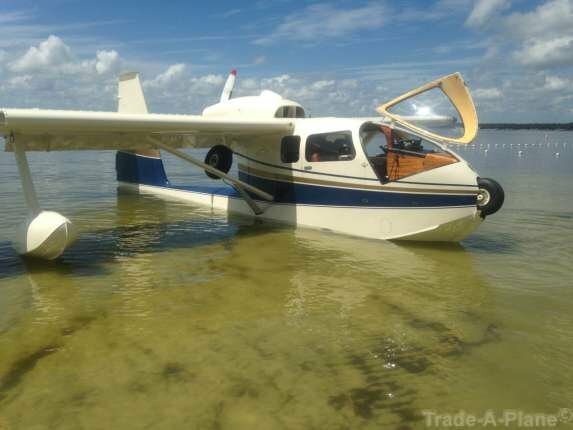 Prefer cash sale but open to aircraft trades plus cash. 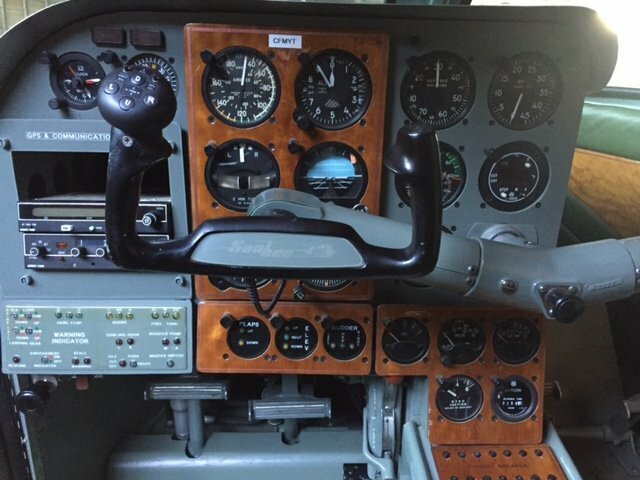 Brittain Autopilot, 5 place intercom. 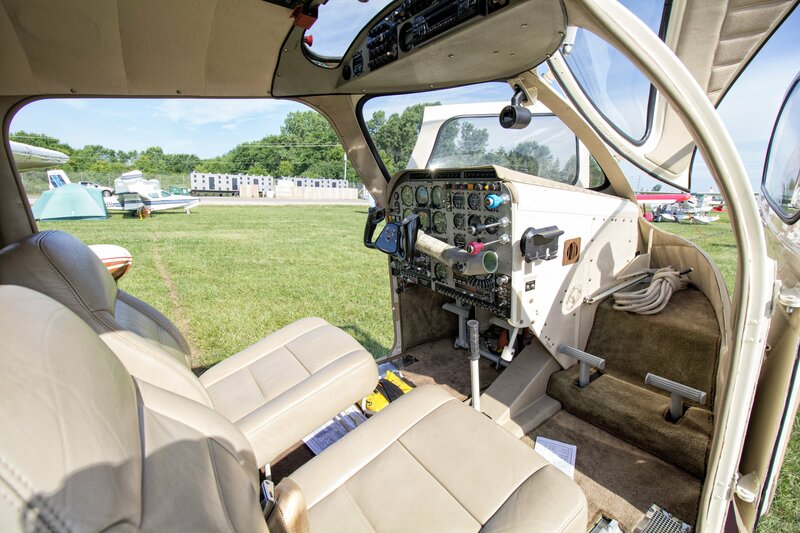 Plane is IFR certified and will be sold with a fresh annual. 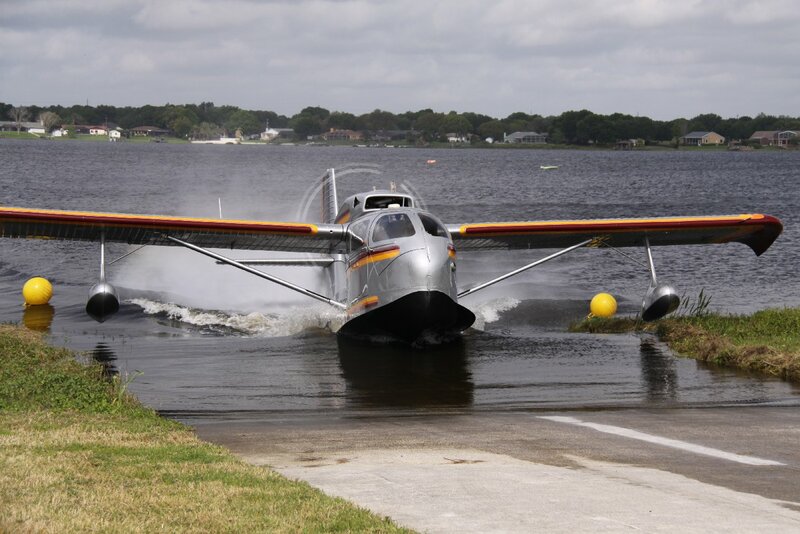 11 seconds off the water at gross weight, 375' takeoff on land. 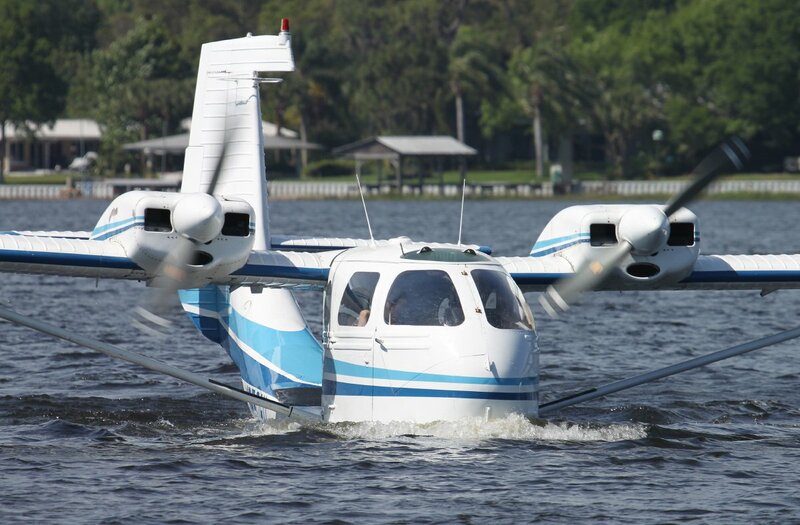 Unmatched performance in a twin engine amphibian. Interesting trades possible. 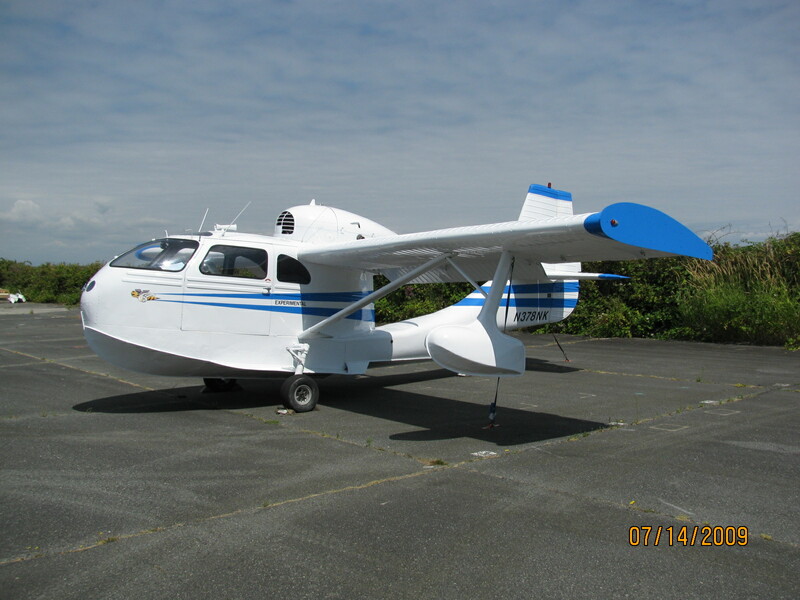 Mike Lush is selling his award winning Corvette powered Seabee. Please read the excellent spec sheet here. 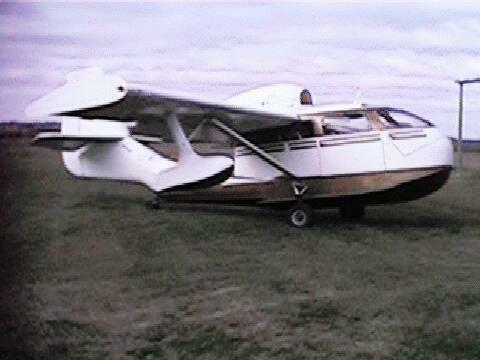 Click here for The Aviators video fo CF-DOQ. 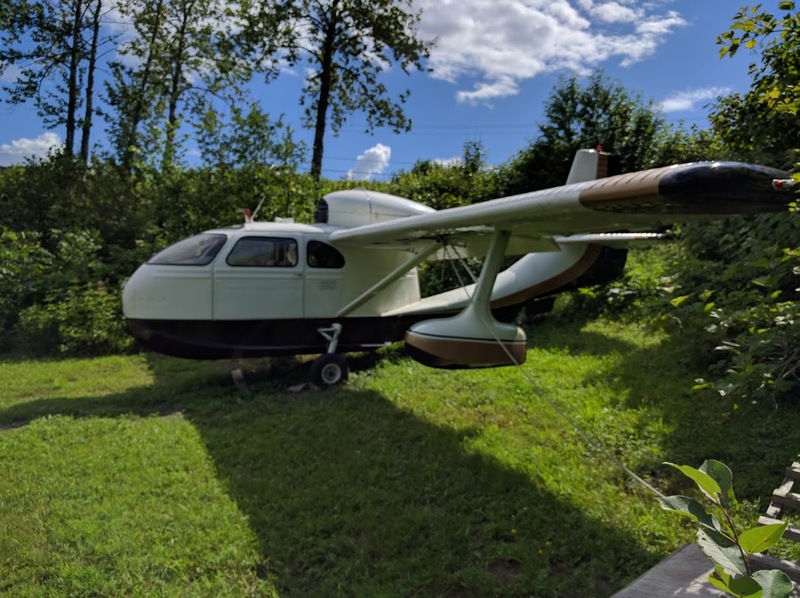 I am selling my 1947 RC-3 Franklin powered Seabee project. It is 90 percent complete. I have attached the information as well as some pictures. 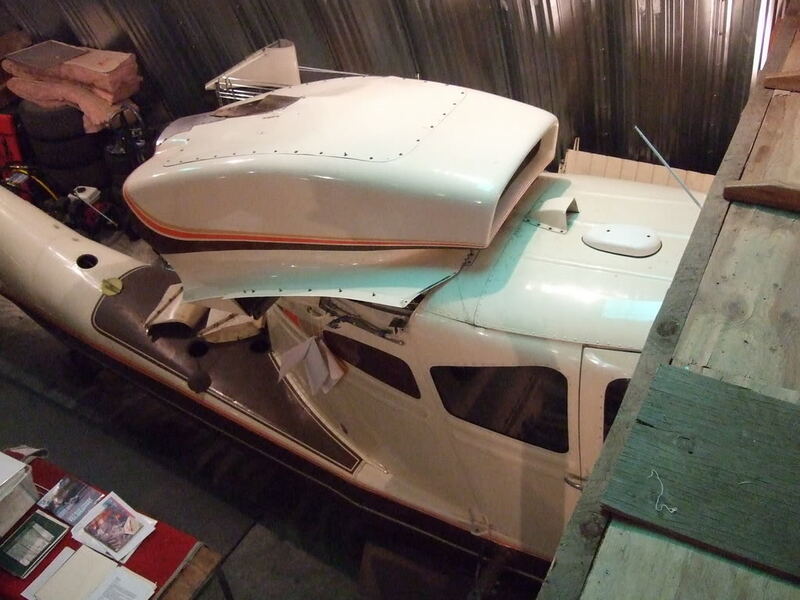 Contact Mike at (616) 846-3977 (home), (616) 502-6299 (cell), or via email at boatflyer01@yahoo.com. 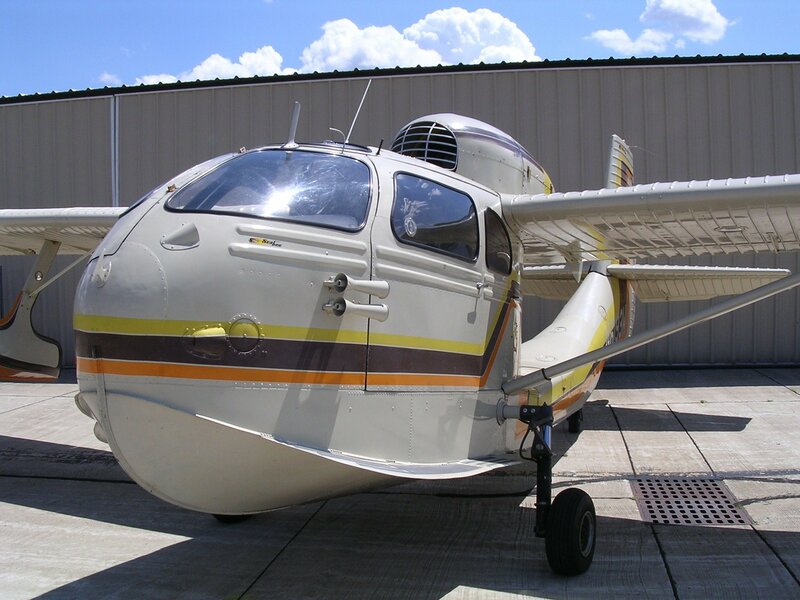 Fully FAA certificated Continental IO-470 powered Seabee for sale. 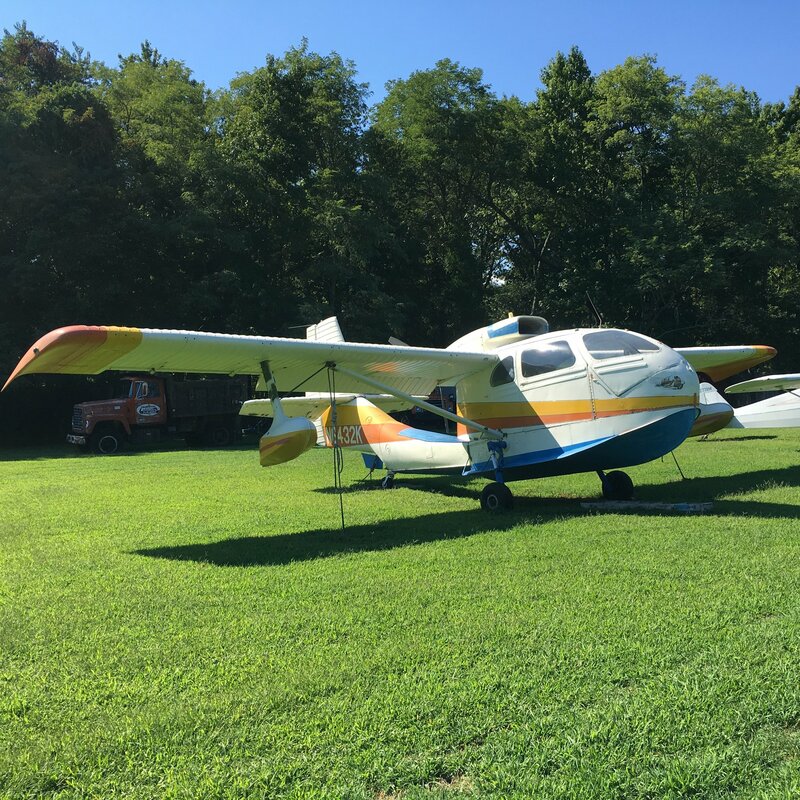 Many mods, recent annual, currently flying. Asking $39,000 or best offer. 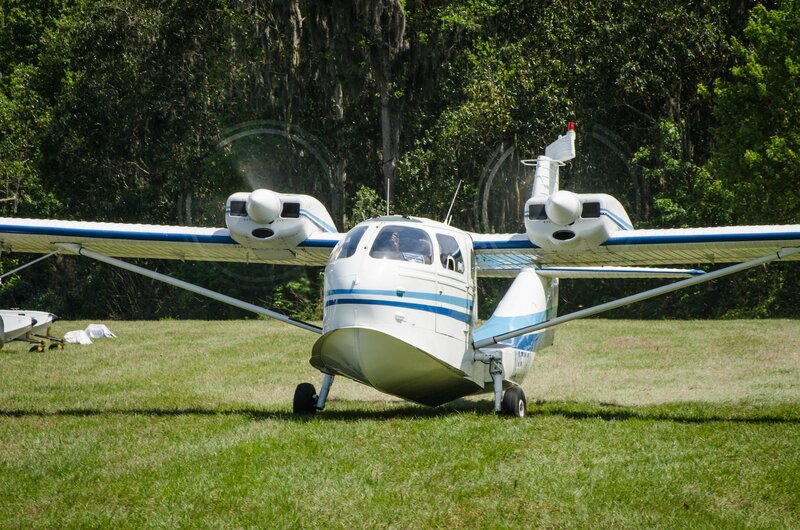 340 HP supercharged Simuflite conversion. Superb performance. 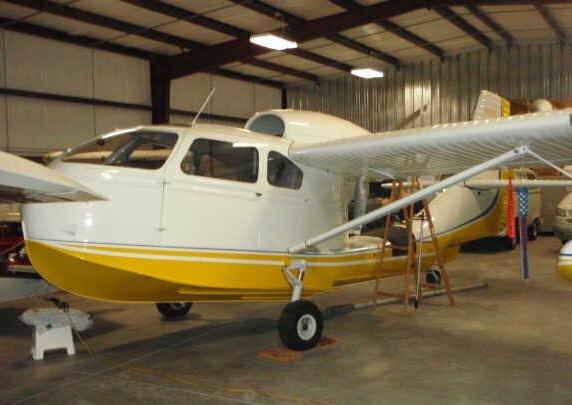 2008 updates: strip and paint, new deluxe leather upholstery, wiring, instrument panel, Southwind heater, extensive top overhaul, Simuflite wing extension, Daubenspeck droop tips, Simuflite wide spray rails, flush fuel fill, new glass, Bonanza-style Cygnet yokes, electronic auto/manual bilge pumps, DHC-2 sling rear seat. 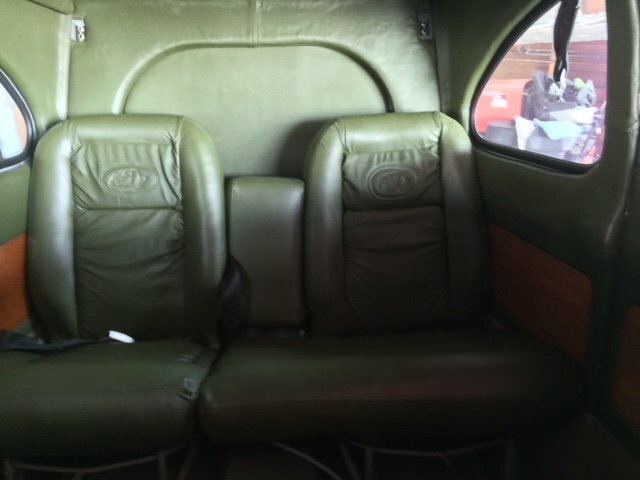 Other mods: electro hydraulic gear pump, Piper front seats and rails, removable 180 degree doors, flush windows, adjustable oil cooler door. 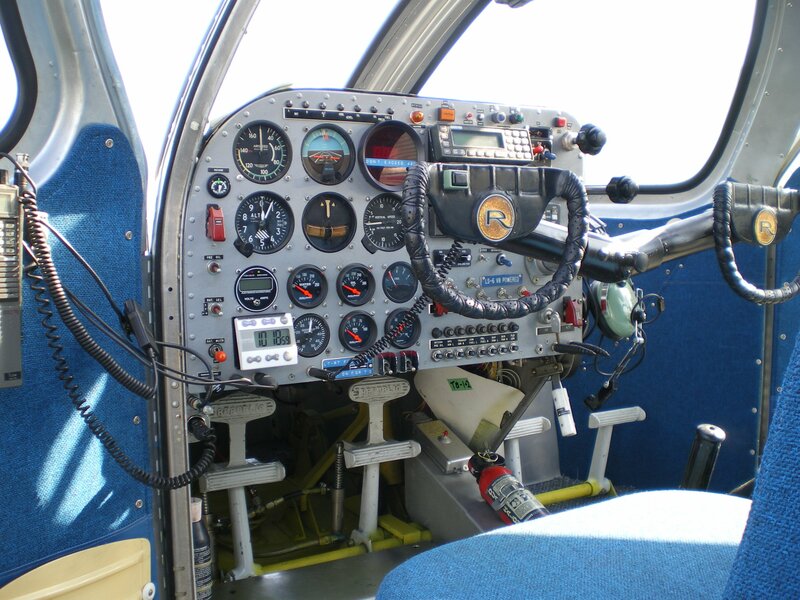 Airframe: TT 1235, Engine: Lycoming IGSO 480 TSMOH 320 hrs, TSTOP 70 hrs, Hartzell Prop: HC-A3MV20-3L TT 222 since new. 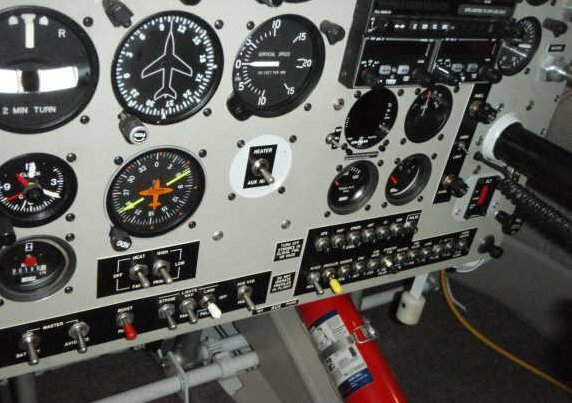 Electronics International: R-1 Tach, M-1 Manifold Pressure, OPT-1 Oil Pressure/Temp, VA-1 Volt/Amp gauge, SP-5L Fuel Pressure/Flow gauge, FLICAB Fuel quantity gauge, UPG-16 Engine analyzer, MUX-8A Black box data recorder. King KMD 150 Multi-function display/GPS. 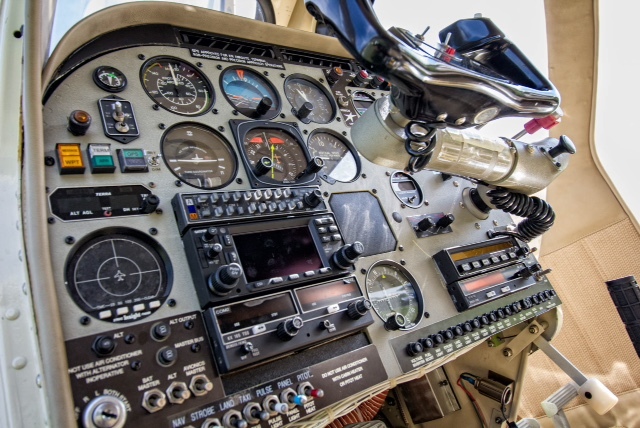 All new flight instruments. 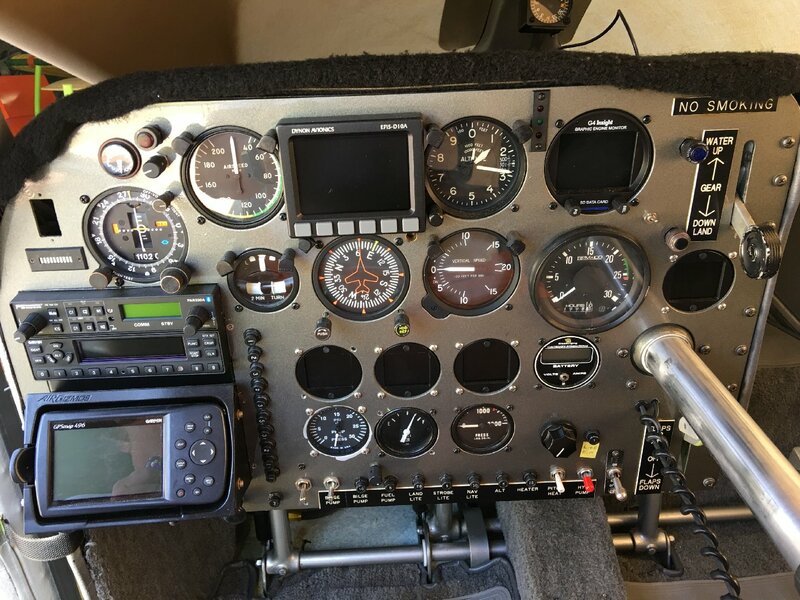 Garmin SL40 VHF, Garmin GTX 320A Transponder, Helicopter airspeed indicator for precision slow flying, PS Engineering PM 1000 Intercom, Bose Headsets (2). 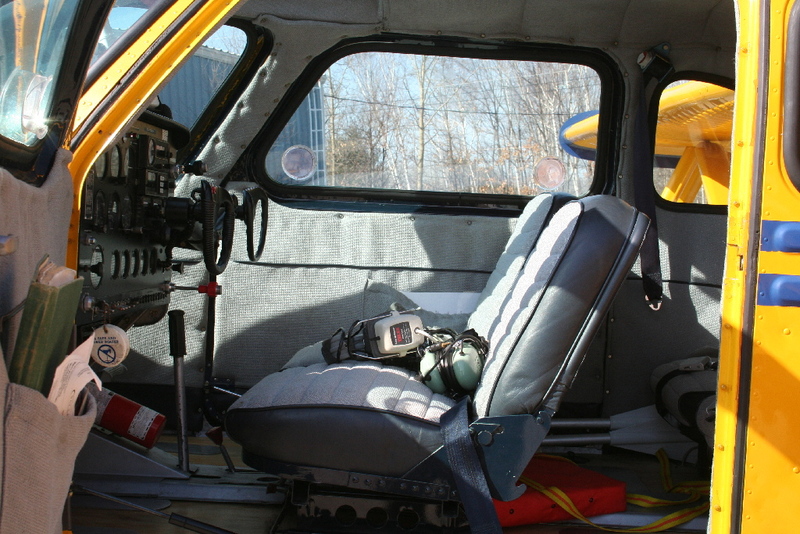 Aritex ME 406 ELT, Skytronics 100 Amp alternator. 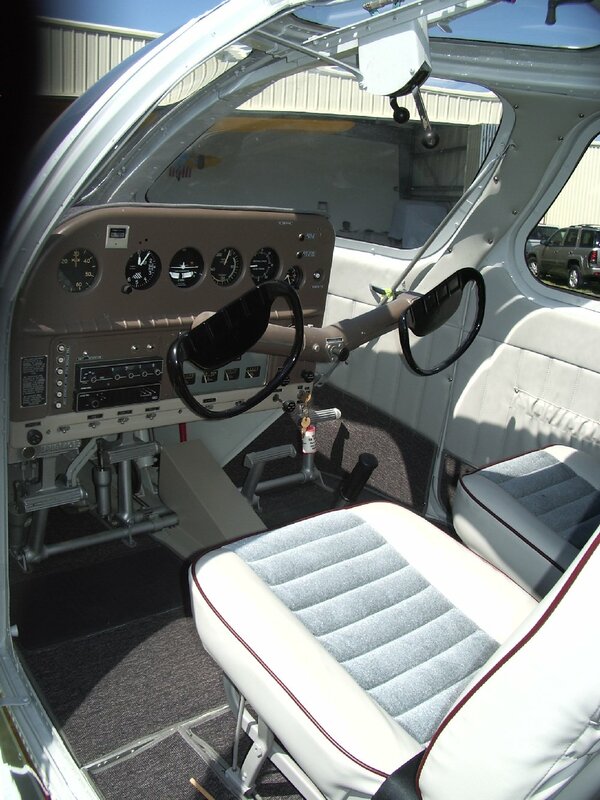 New main tires, complete logs, all modifications are accompanied with correct paperwork including upholstery. 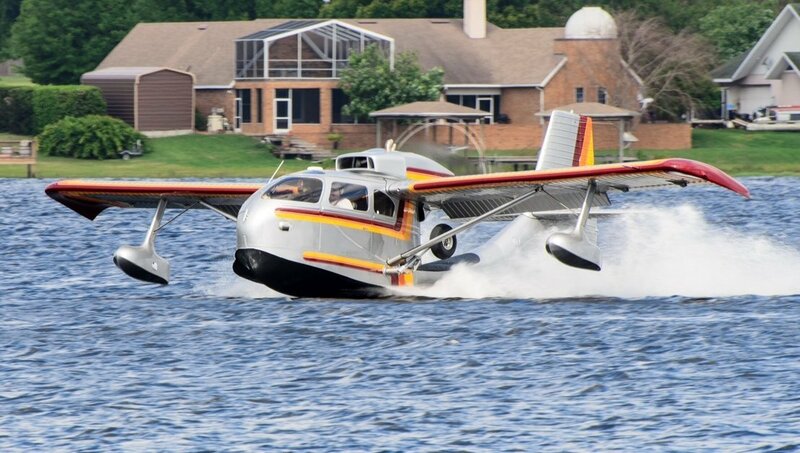 Bill Burtis, winner of the Sun n Fun Grand Champion Seaplane Award, 2015, for his Spencer Air Car, died unexpectedly, in January. 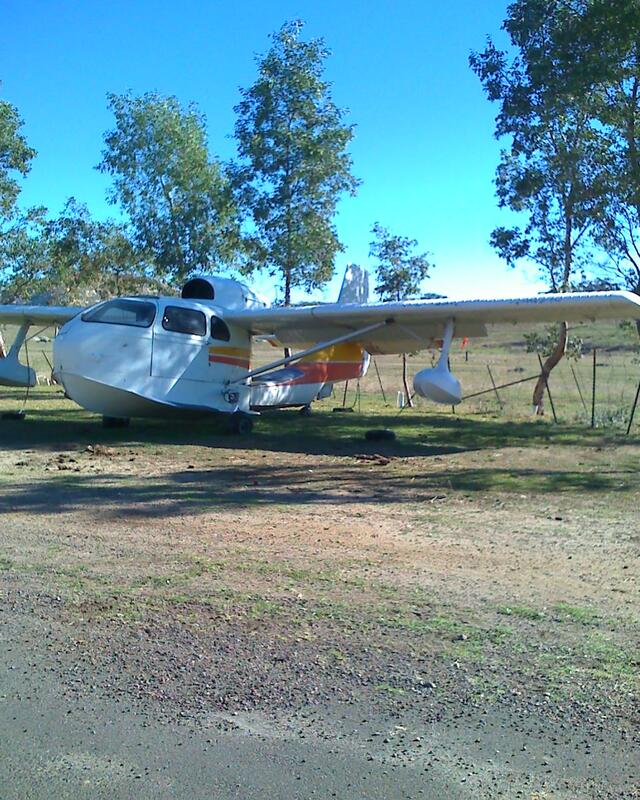 His sister has put the plane on the market. 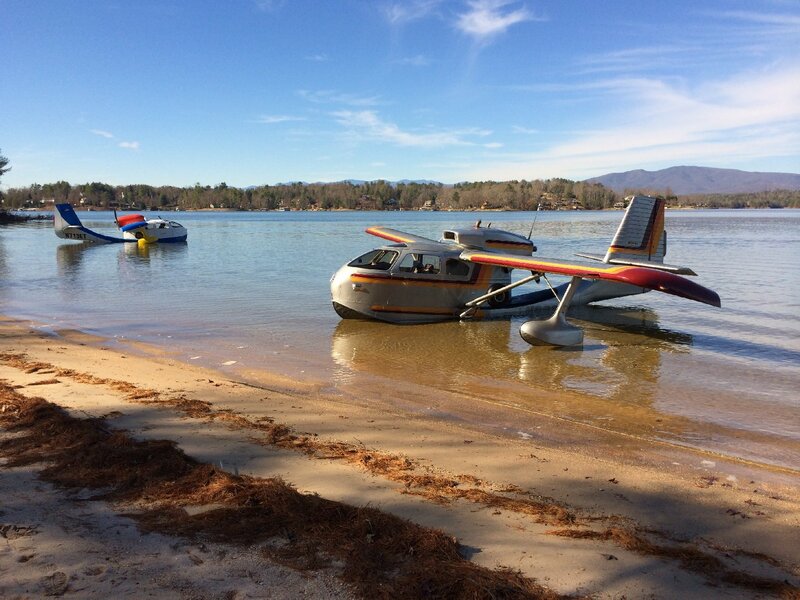 Sun n Fun Grand Champion Seaplane, 2015. 60 hours TT. 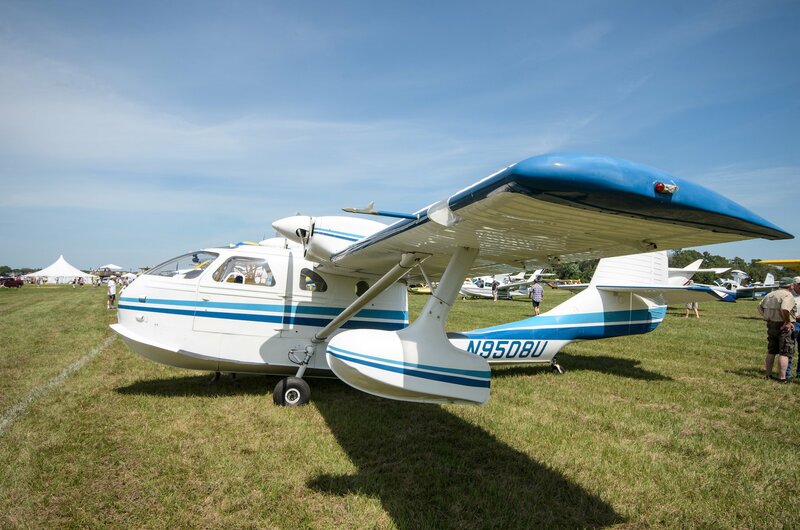 Large load capacity, 300 HP, STOL performance, excellent range, terrific water handling, remarkable craftsmanship in all phases of construction. Estate Sale. $175,000.00. All Offers Considered. 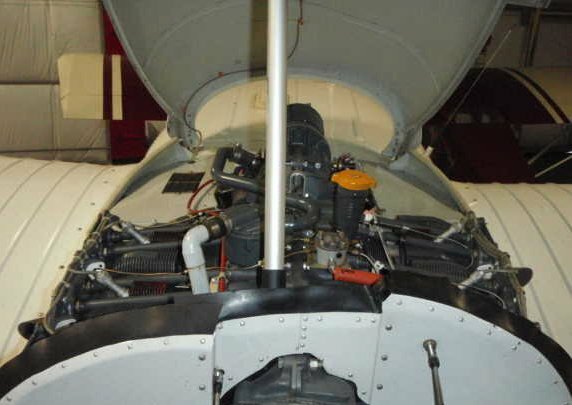 Engine LYCOMING GO 435 G2E (zero time overhaul may 1999) 135 hours SMOH. 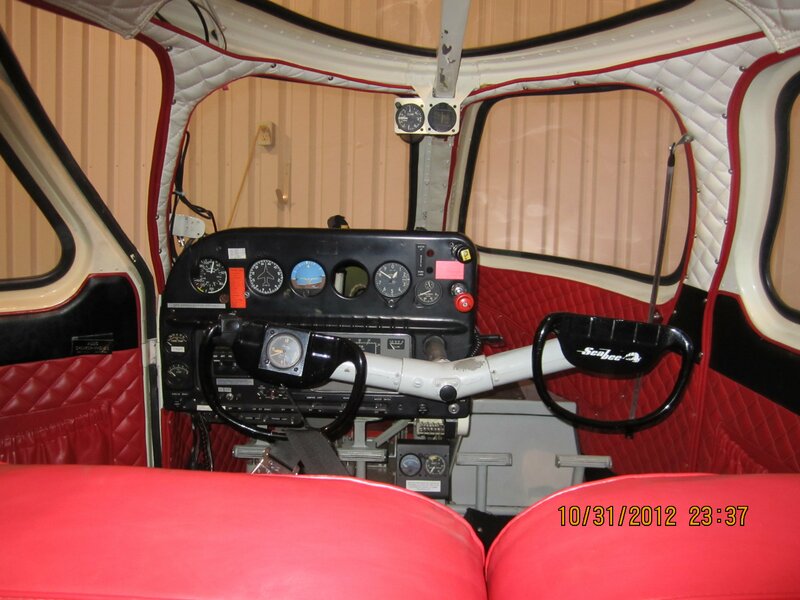 New hydraulic lines, new control cables, wing extensions with Kenmore drooping STOL wingtips. Empty weight: 2200, Gross: 3150. Paint 7/10, interior 8/10. New tire . Annual due august 2013. 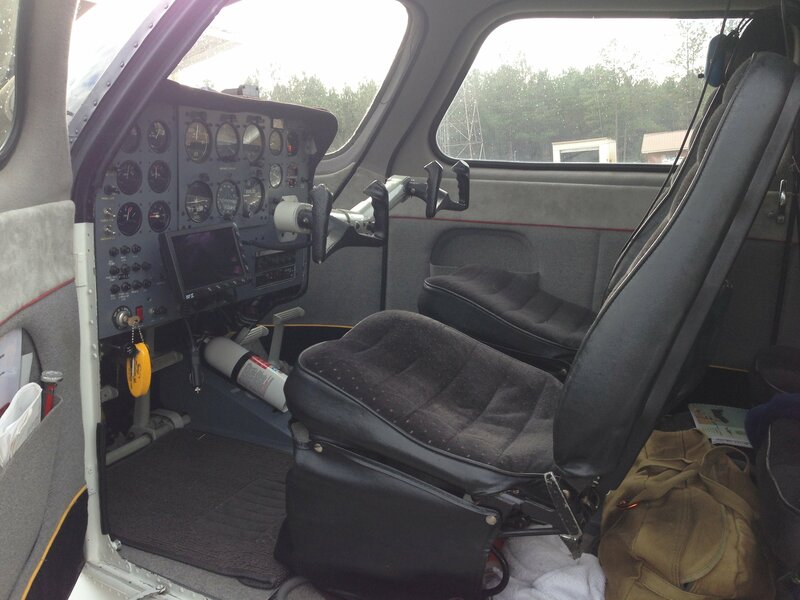 SUPER BEE GO-480-F1A6, 15 SMOH PROP, 15 SINCE NEW VHF 250, XPONDER/ENCODER, INTERCOM. NEW PAINT & GLASS. WILL CONSIDER POSSIBLE TRADE, NEED REASONABLE OFFER or TRADE. Price: $110,000 Reduced to $65,000!! 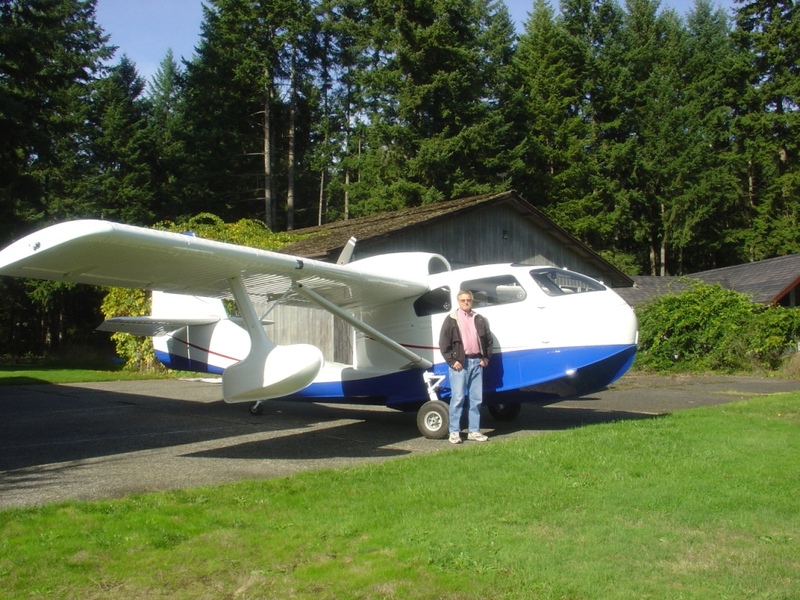 Long time member Grant Leonard is selling his Seabee. 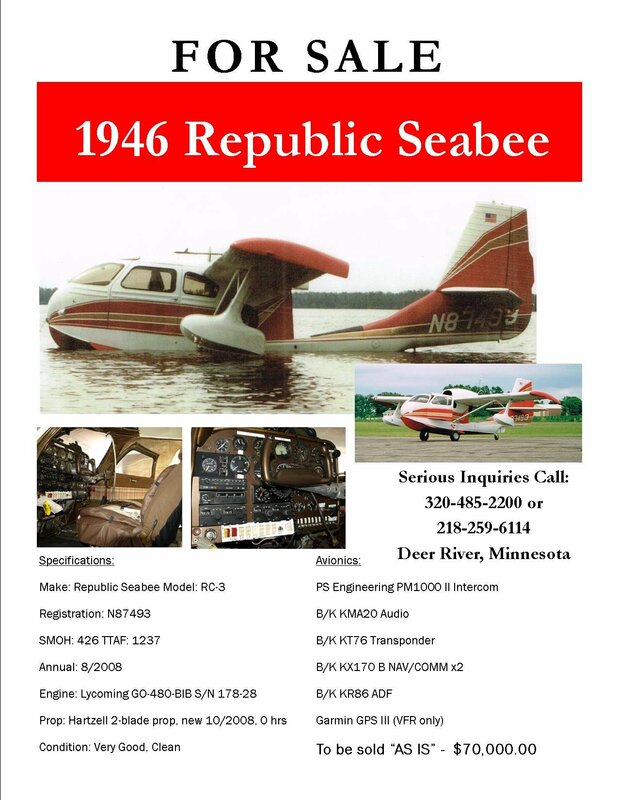 He writes: " Republic Seabee for sale. 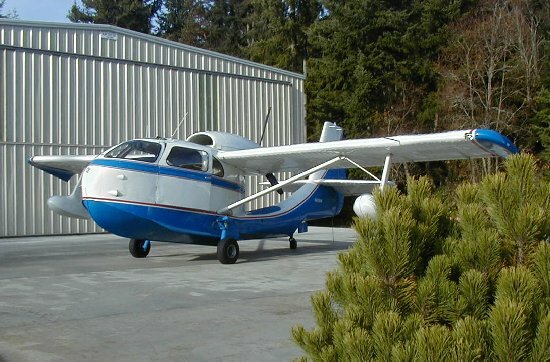 1947 S/N 843 with new Hatzell Propeller. No ad's. Less than 2000 total time. B9F Franklin engine runs very well and strong. 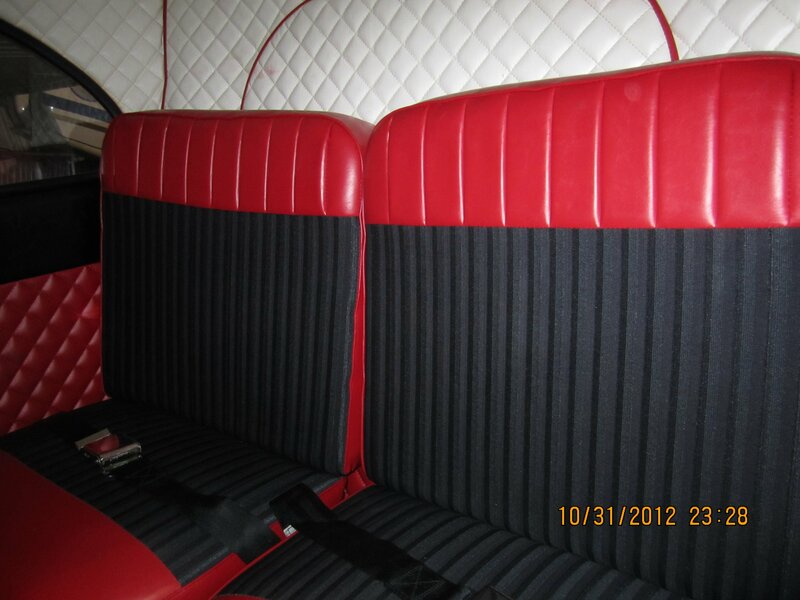 Hydraulics overhauled, new Airtex interior, great radio, leather front seats. Powerpac rebuilt. 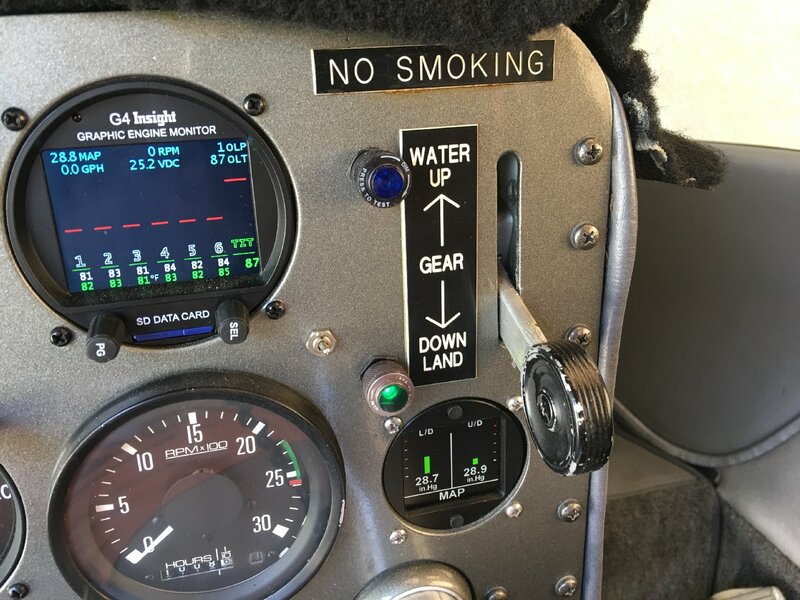 No engine logs. 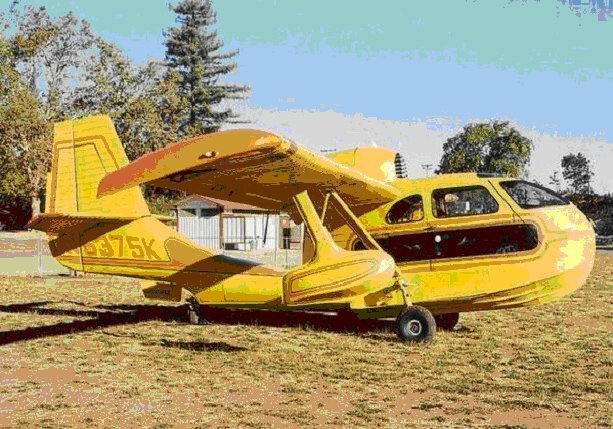 I have owned this Seabee for 42 years and now can no longer fly. Hangared at Fairbault, MN. 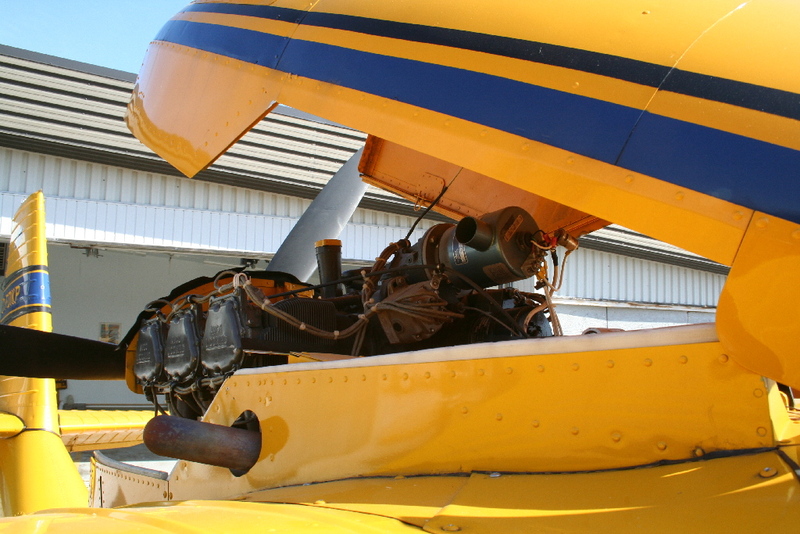 Newer fuel bladder. 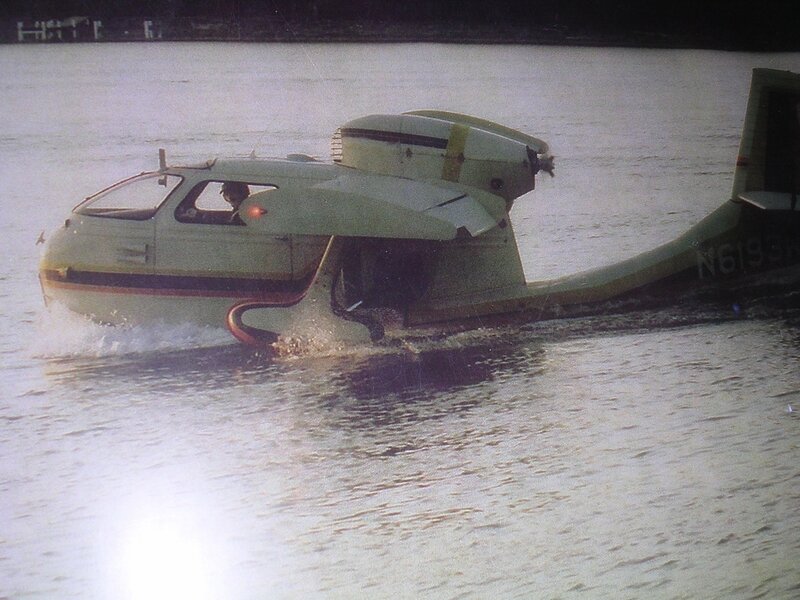 Probably the best single enigne amphibian ever built. It is ferriable. Will sacrifice for $35,000." 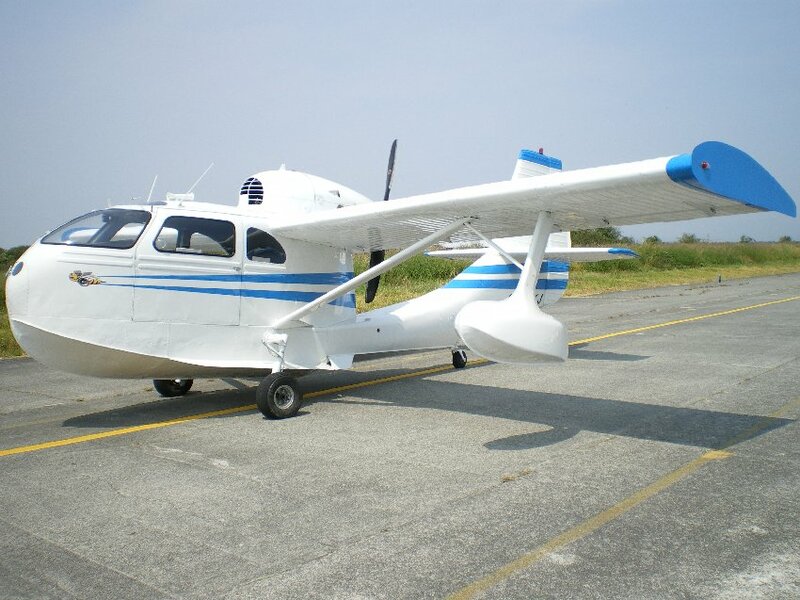 This is one of the best SEA-BEE’s available in this condition. Always hangared. 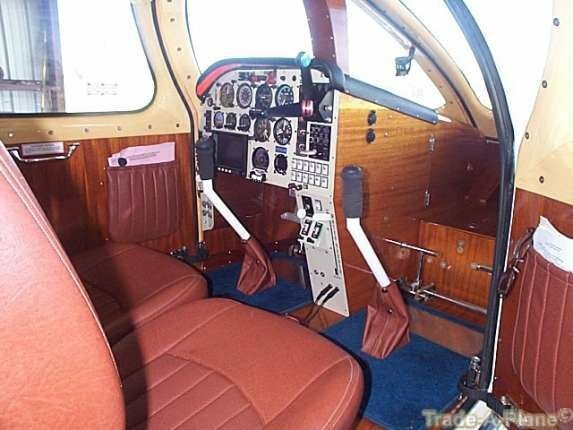 Price $65,000. 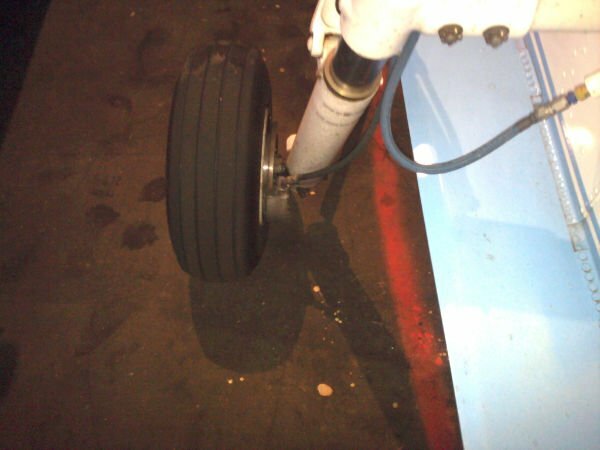 No costs spared in maintenance. 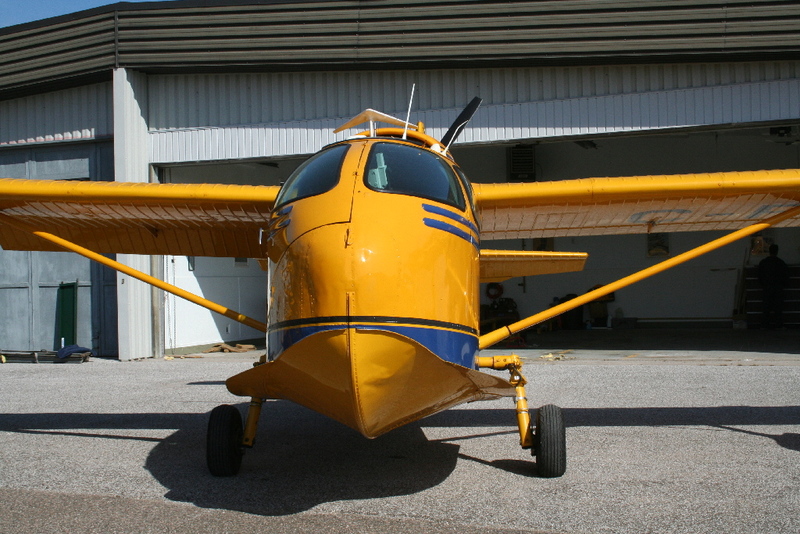 Engine Franklin 215 HP – smooth and quiet Looks better than shown in pictures. Ready to fly. Everything works. Looks new. Up to date on all AD’s. 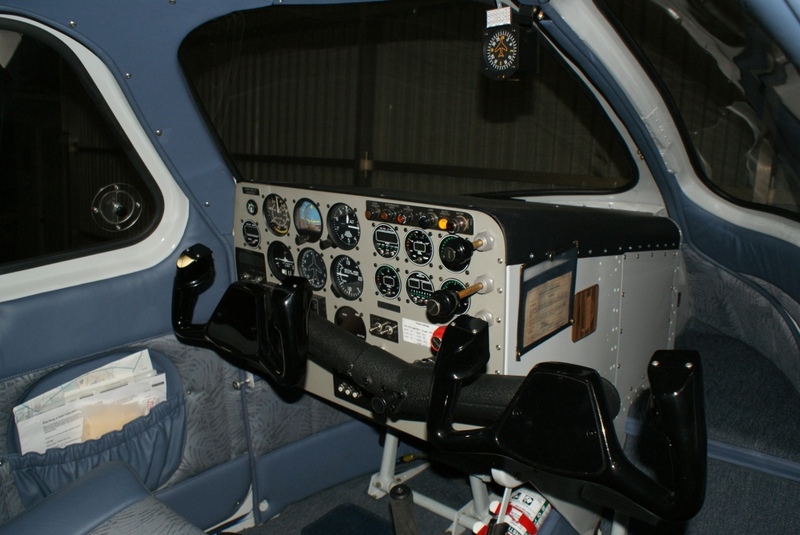 Also have new still in box spare 3 blade Hartzell prop for this aircraft. Make offer. 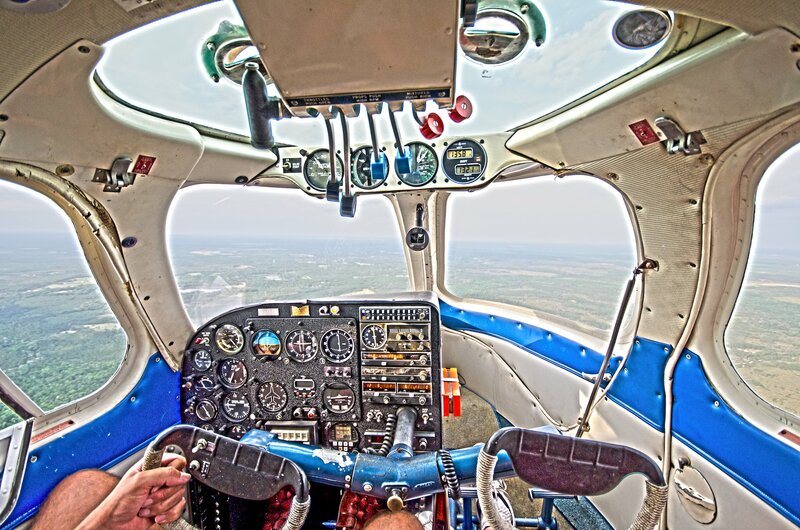 TOTAL TIME AIRFRAME: 460 hours. Total time since new. ENGINE TIME: 10 hours. 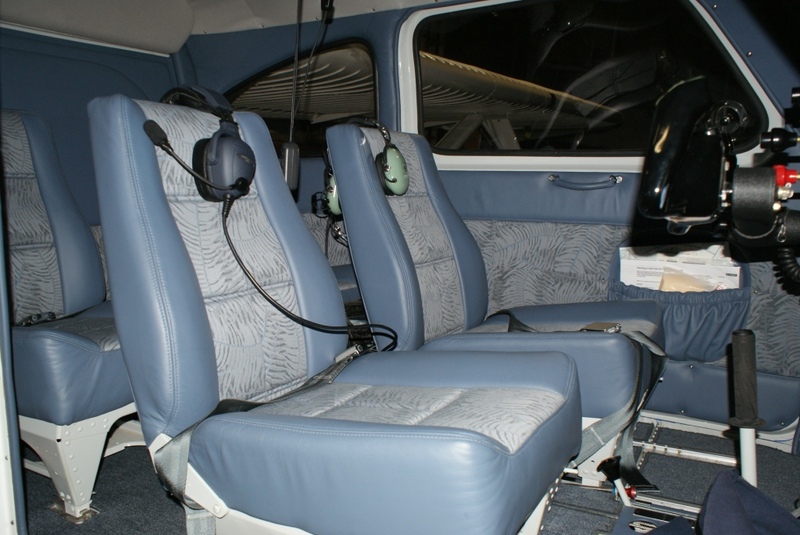 Since first class overhaul, B9F. 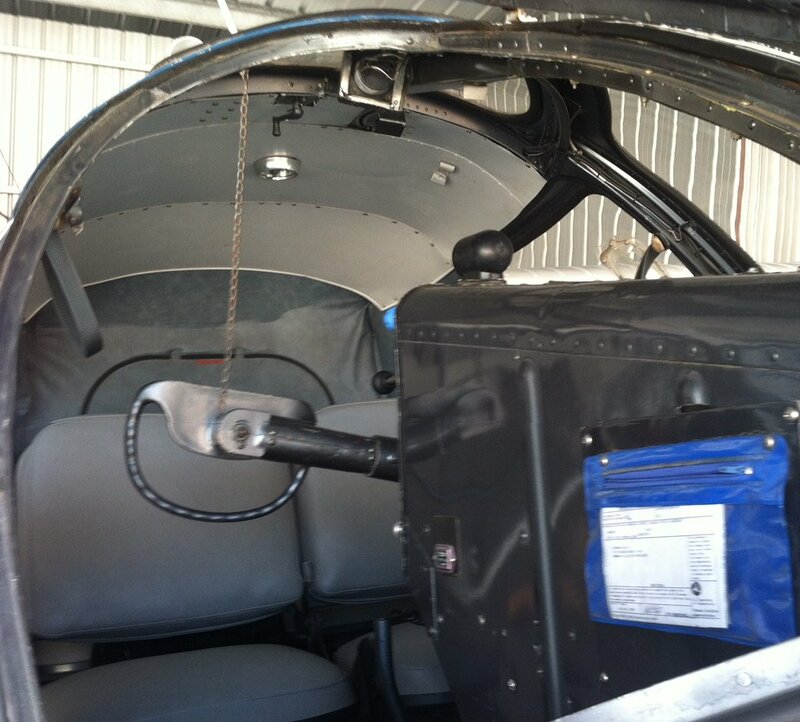 PROPELLER: New Hartzell 2 blade installed. 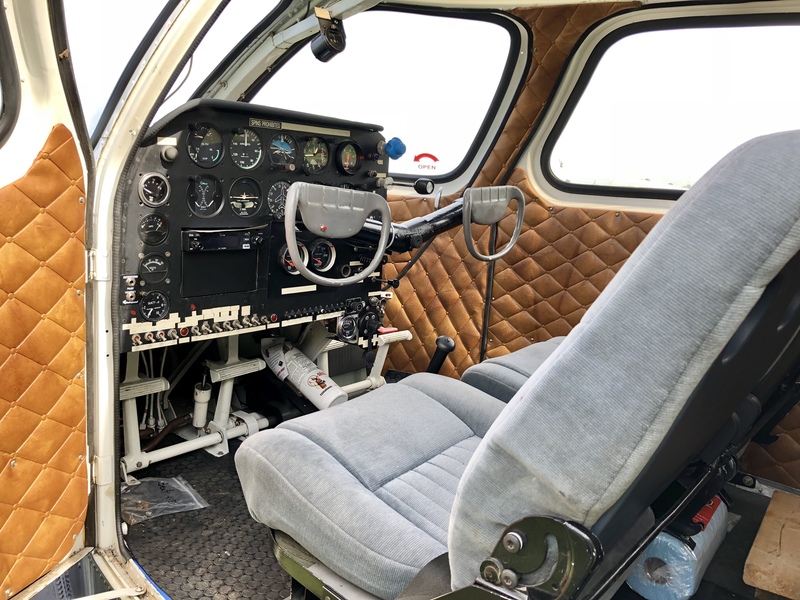 Radio King KX 170B,	Large spray rails, NARCO TX AT-50A,	Never in salt water,,Sigtronics Intercom 5PA-400	, Stewart Warner Heater,,New prop,	Strobe lights,,New fuel bladder,	Alternator,,New harnesses for mag & distributor,	Fuel pumps – one mech. 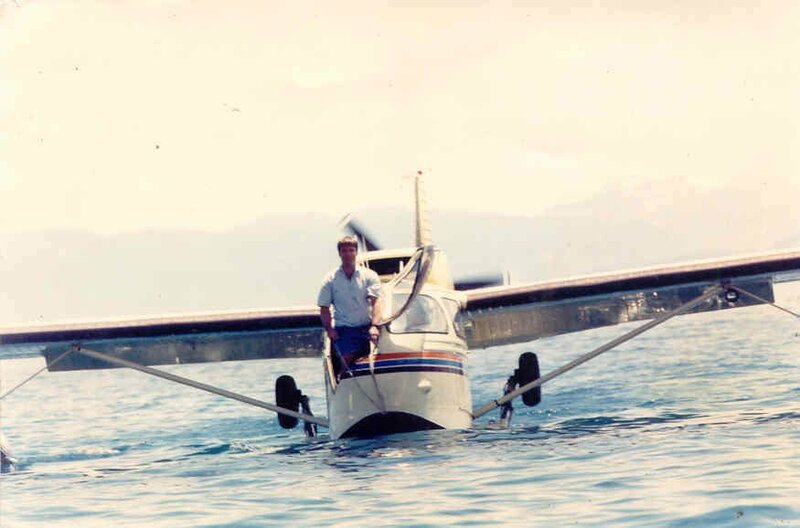 – one elect.,,Engine analyzer,	New tires & tubes,,Extended wings with spill plates,	Bilge pump & piping to compartments,,All seals struts & prop cylinders,are quad rings. EXTERIOR:	Paint is excellent. Glass is good. DAMAGE HISTORY: No damage what-so-ever. COMMENTS:	New Log Books. 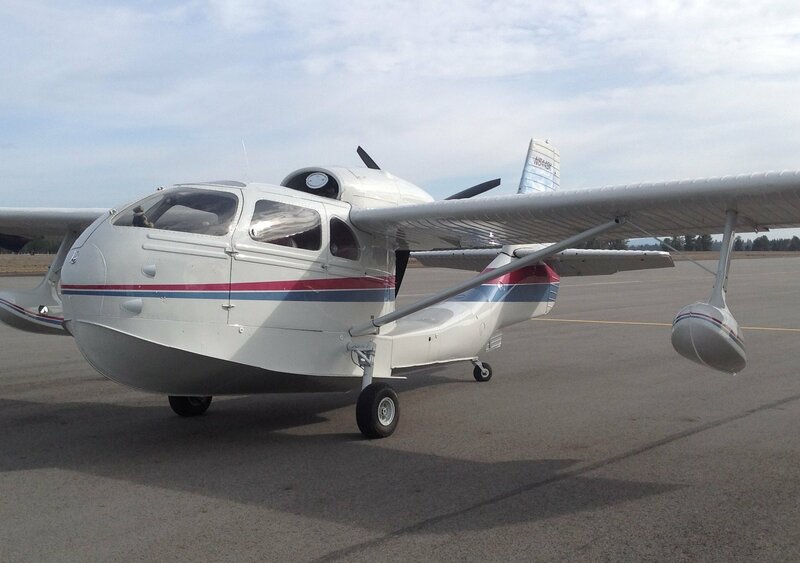 Nice up dates on a Good Looking Airplane. 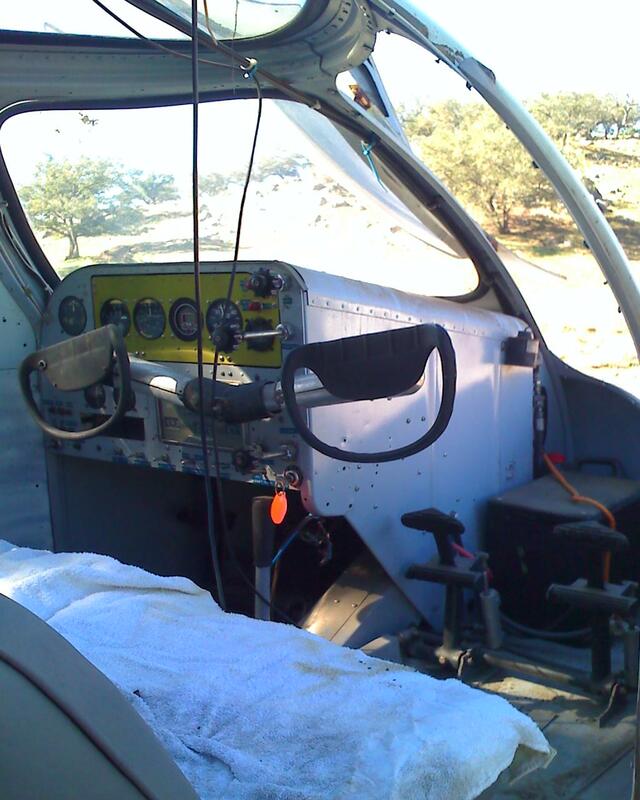 Ready to Fly and Everything Works. HOME STATION: KIAG Niagara Falls, NY. Asking: $65,000 or best offer. 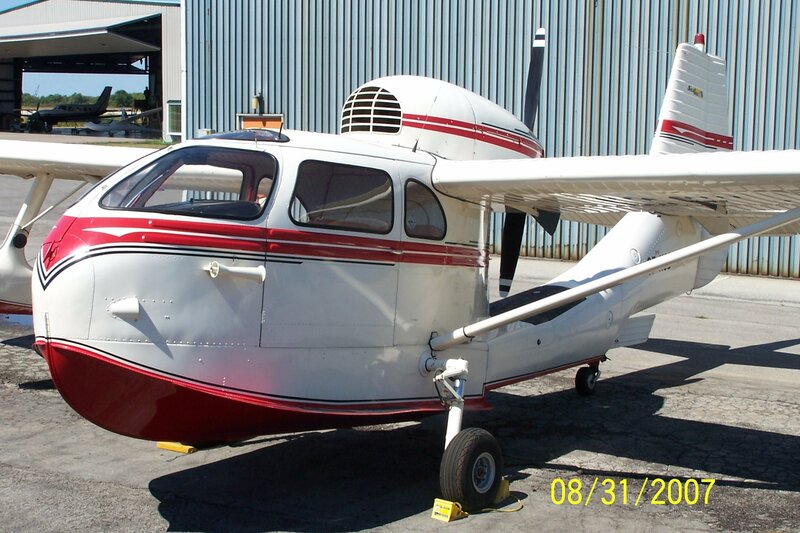 1947 Republic SeaBee, Aircraft TT 1385.2, Engine TSOH 178.8, Prop TSO 257.6. All ADs compiled with. 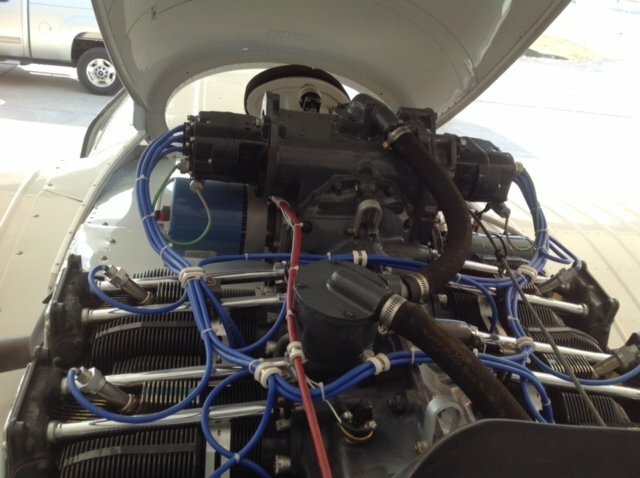 Engine overhauled by Richie Brumm with all his mods,InterAv Alternator, Oil filter. 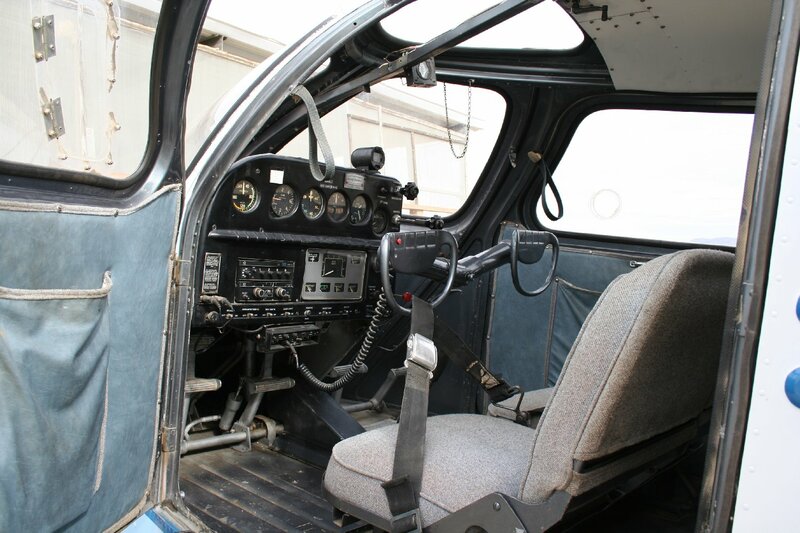 King KY197 Radio, PS Engineering PCD 7100 Intercom w/CD player, King KT76A Transponder, Trans Cal mode C Encoder, Electronics International R-1 Tachometer, M-1 Manifold Pressure Gauge and 6cly EGT/CHT, Cleveland Disk Brakes, Richie Brumm Stainless Tail Wheel control horn, Wing extensions w/droop tips, Wide spray rails. 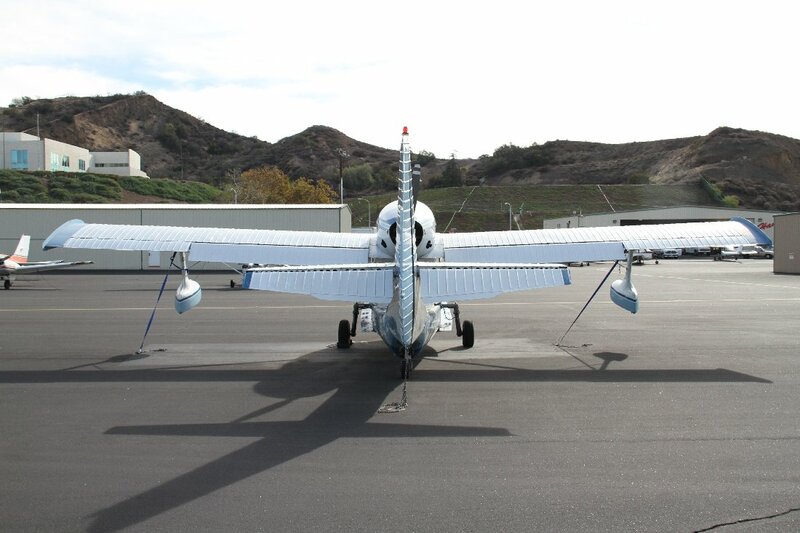 This Aircraft is ready to go out and play. Jay Herte 262-707-8346 or jayherte@live.com Asking: $75,000 Please make a reasonable offer. 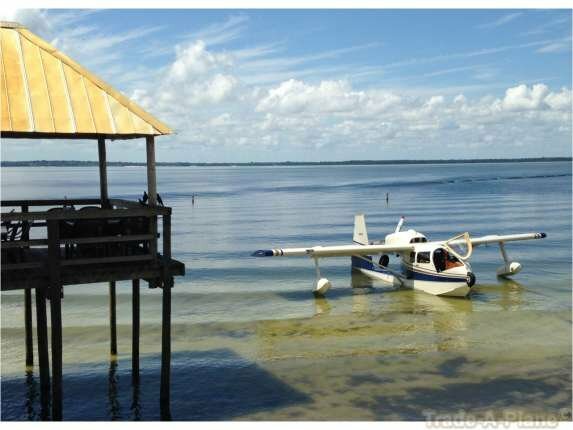 Offered at : 95,000 Reduced to 70,000 USD together with the project Serial 1001, TTAF 1200 and one Franklin 6A8-215-B9F engine. 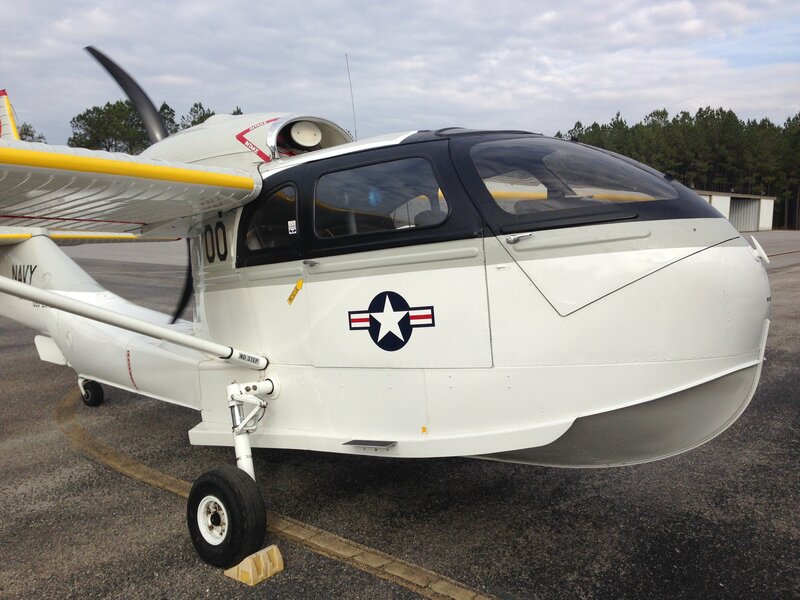 Walter McNamara is selling his Seabee. willing to Partial Trade. 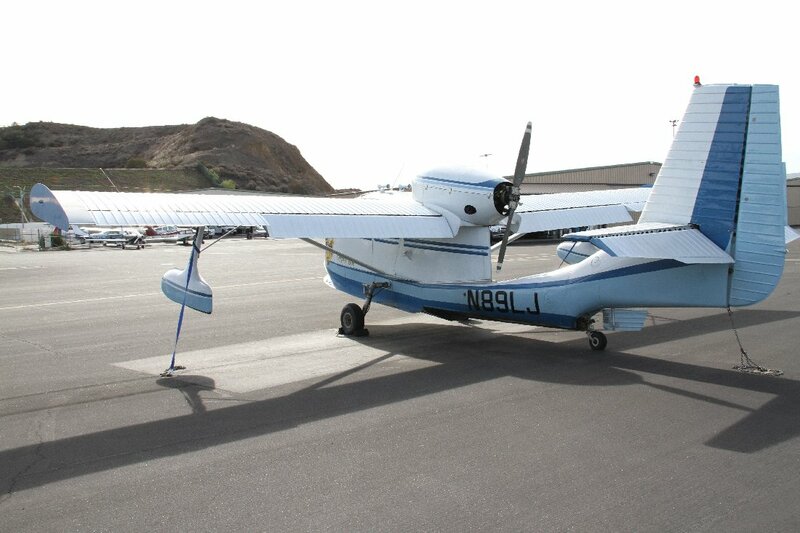 Seabee is Located in Southern California. Buyer is Responsible for Tear Down/Pick Up/Shipping to it's final destination. It last flew in October of this year. 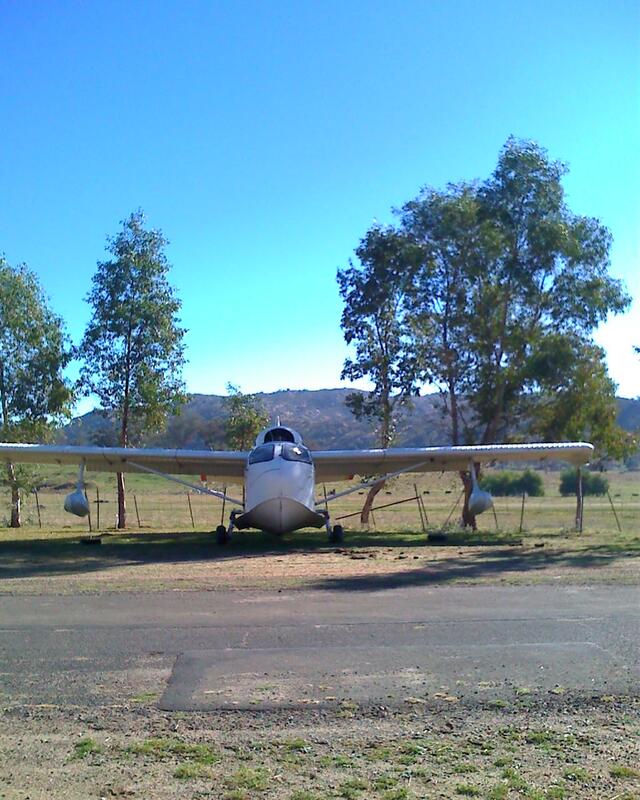 My plan was to put a bigger engine in it, as it has the -B9F, so it's a complete aircraft but needs work. 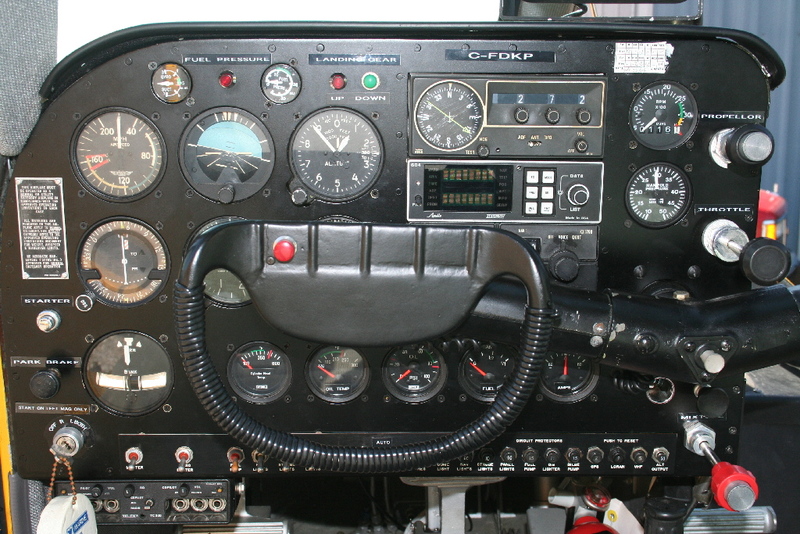 It has the original gauges, transponder and mx11 radio. 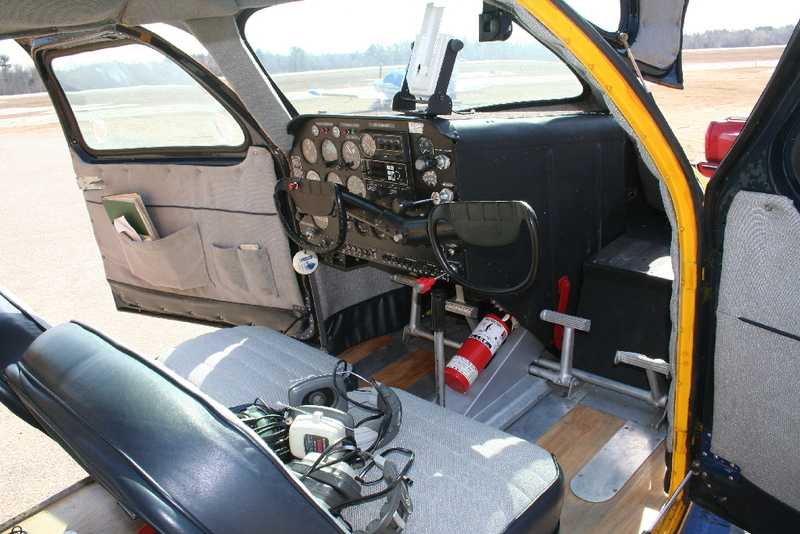 Aircraft TT 1049.2, Engine TSOH 153.8, Prop TSN 153.8. 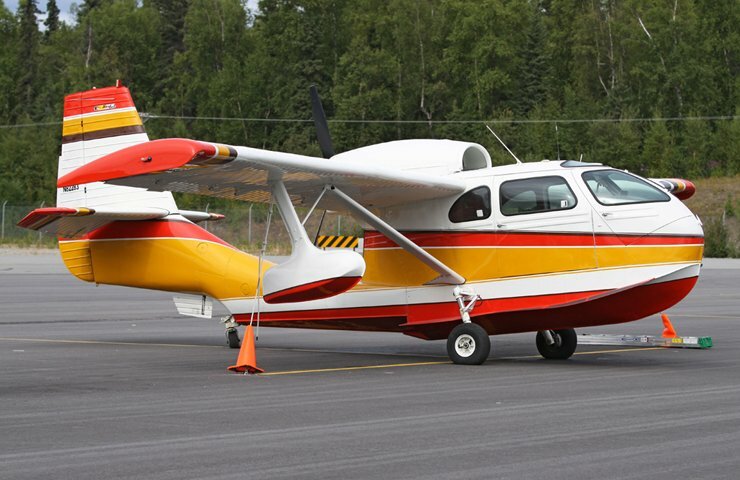 Nicknamed the “School Bus” and you can see why in the pictures! Rebuilt from the wiring harness up. 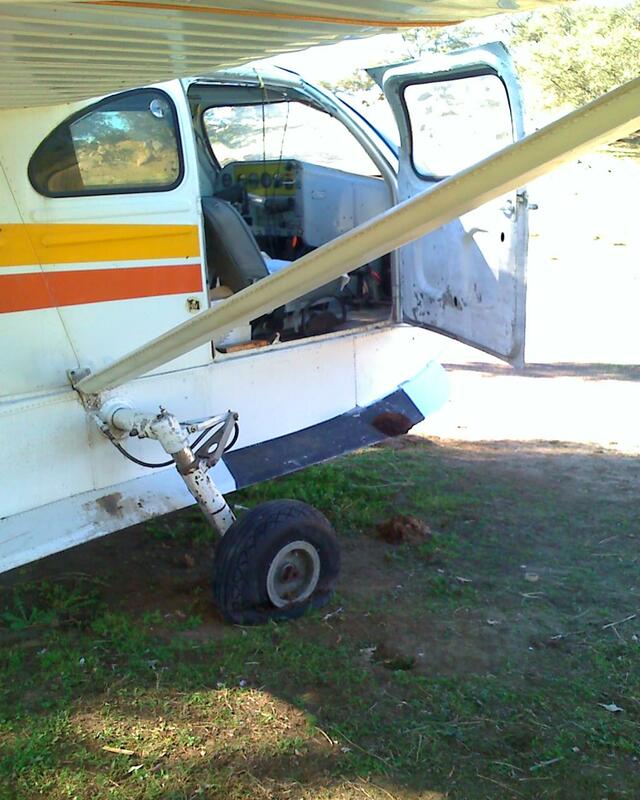 No costs spared in maintenance. 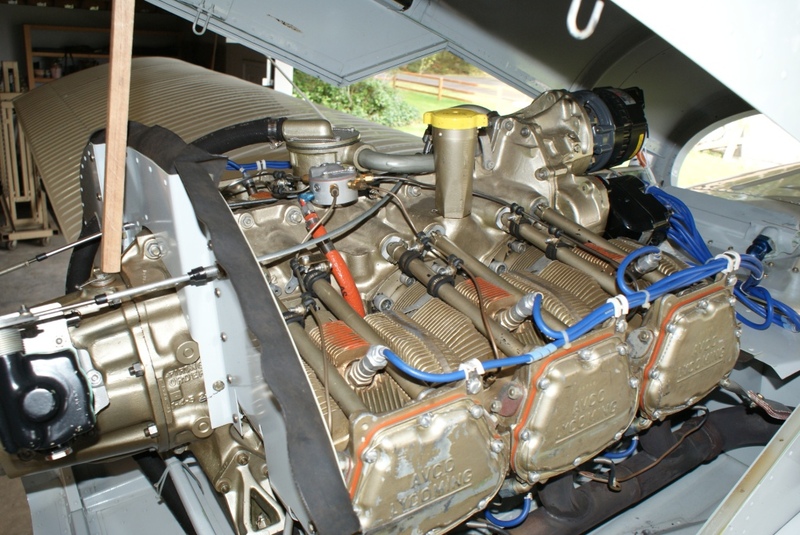 Up to date on all ADs, Franklin B9F Engine overhauled by a very reputable shop. Mnay mods include: InterAv Alternator, Oil filter. Cleveland Disk Brakes, wing extensions w/droop tips, wide spray rails. 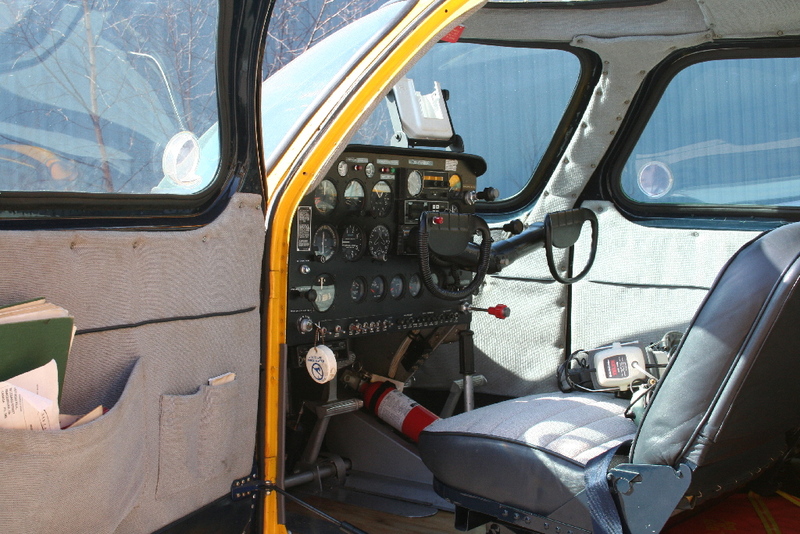 Reassembled with new control cables, hoses, interior, new panel, recessed fuel filler door STC, new belly and wingtip strobes, new antennas, new fuel pump, all new switches and breakers, new baffles, new tail wheel, overhauled hydraulic pump and pistons end-to-end. 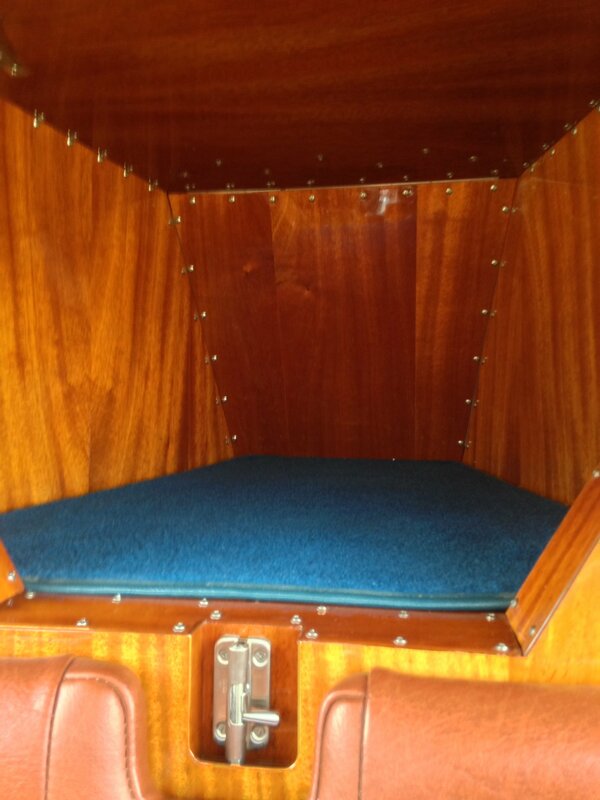 Automatic bilge pump & new piping to all compartments, all struts have new O-rings. 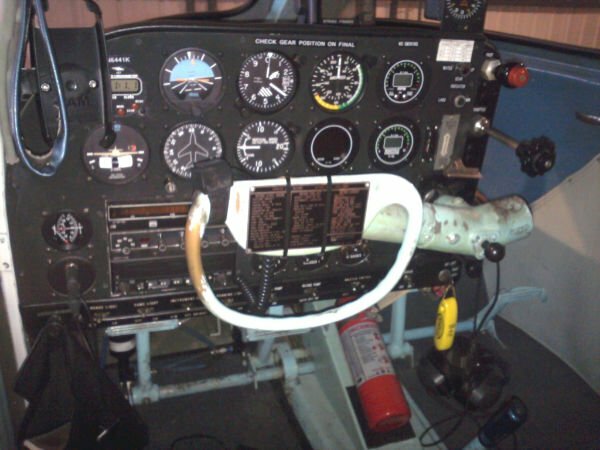 LEMO and regular headset plugs for pilot and co-pilot for four place intercom with music input, dual PTT switches plus pilot yoke PTT, external power plug. Panel: New custom powder-coated panel, All Digital EDM 930 STC Primary Engine Management System (RPM, MP, Oil Temp, Oil Pressure, Volts, Amps, OAT, Hobbs, Fuel Flow, Fuel Used, Full 6 cyl EGT, full 6 cyl CHT), Gear Position audible/visual warning system, new fuel quantity indicator, RCA 2600 electronic attitude indicator, PMA600B 4 place intercom with markers and music input, KX125 Nav/Comm with GS/LOC CDI, KY197 Comm, King KNS90B, Sandel 3308 Digital HSI, G-102 gyro, KMT-112 Flux Detector (wing mount), KT98 Transponder, 406 ELT, New Compass, every other panel instrument overhauled. 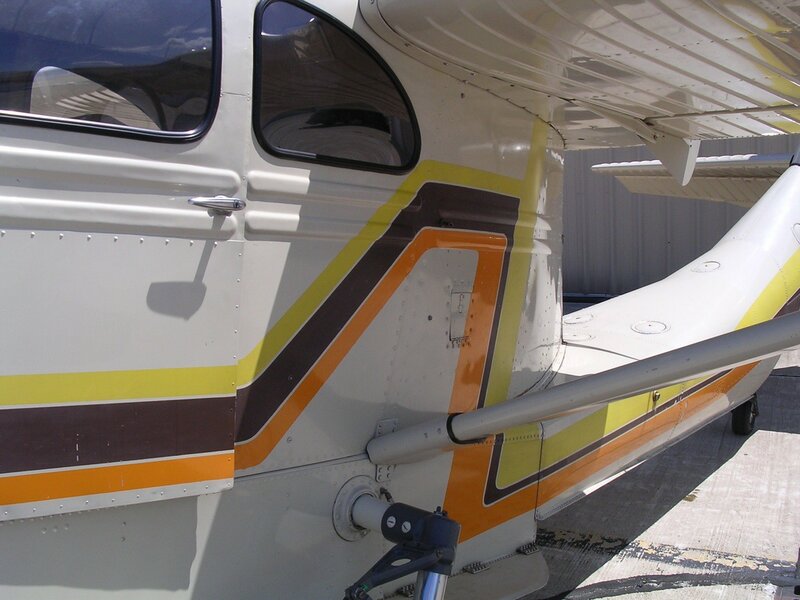 EXTERIOR: Paint is good – yellow/black. 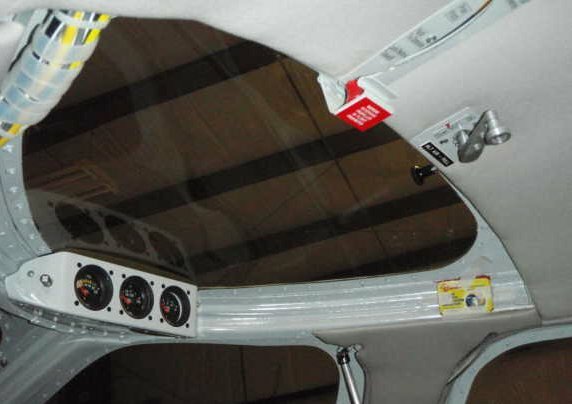 Glass is good with all new window gaskets. 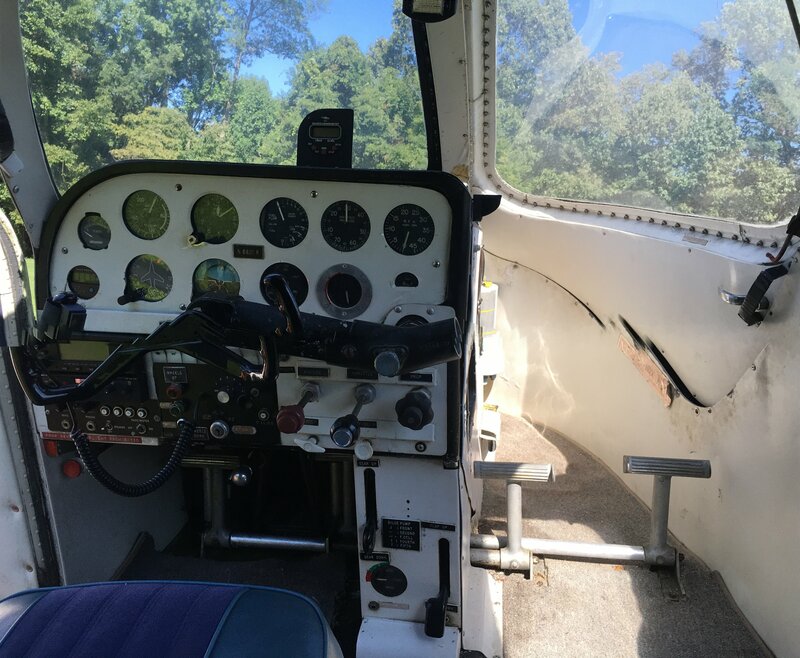 INTERIOR: All rebuilt and refurbished, cabin interior and accessories repainted, 2X12 Volt outlet on floor, new carpet, light weight anchor with chain, fire extinguisher, new cargo storage area, calibrated fuel dip stick, 4 inflatable PFDs. 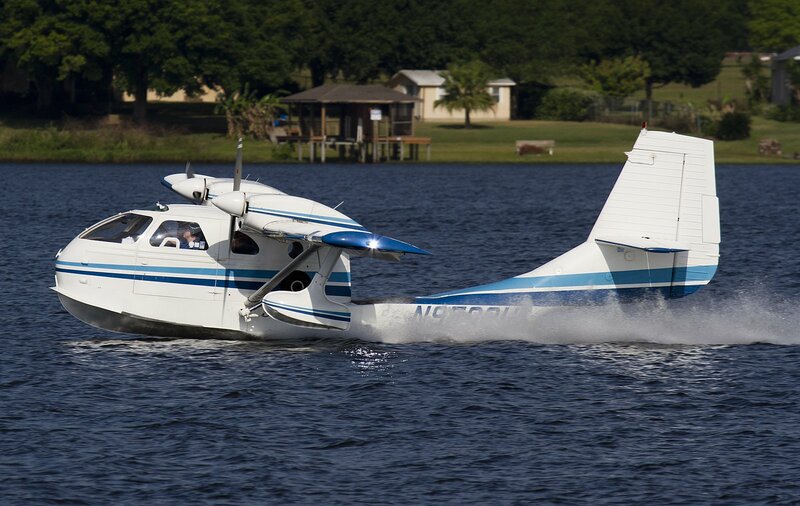 Flown on a weekly basis, she has only been operated on the lakes of South Carolina, North Carolina, Georgia and Florida and is based at Summerville, SC (KDYB). 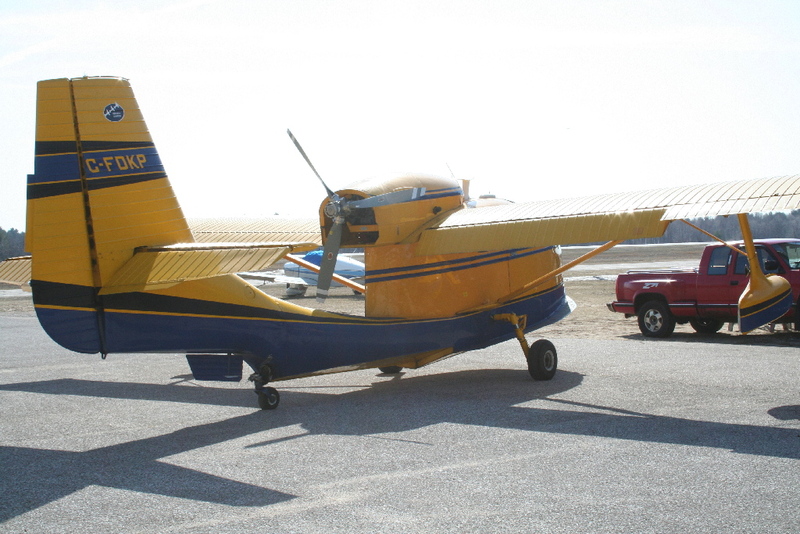 This is the best Seabee available in original configuration and ready to fly away! 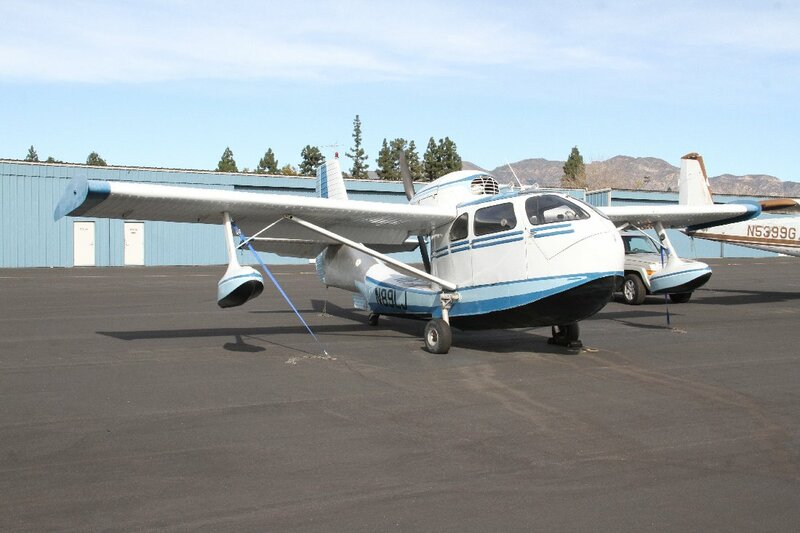 Asking: $62,500 and will deliver to buyer and give transition dual instruction for fuel costs. Republic RC-3 1947. TT235 47hrs since restoration. 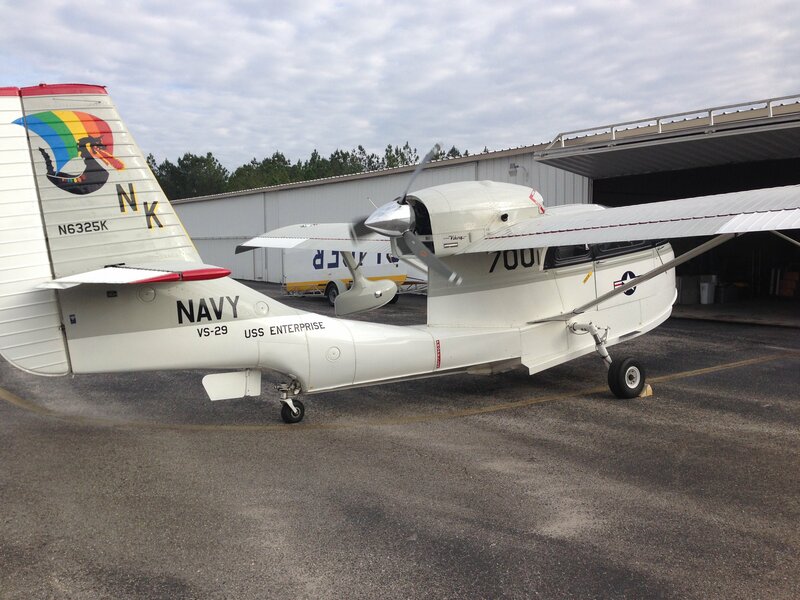 There aren’t many Seabees that have been restored and maintained to this level and far fewer are offered for sale. 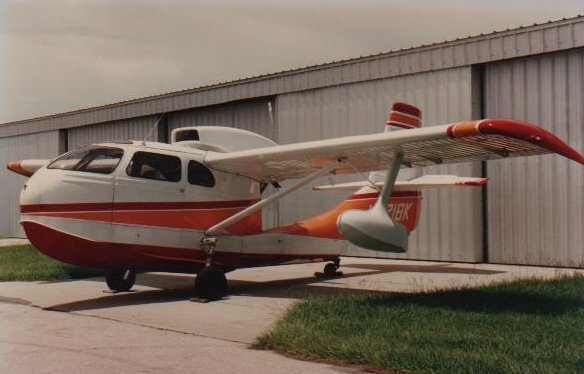 N6222K is one. 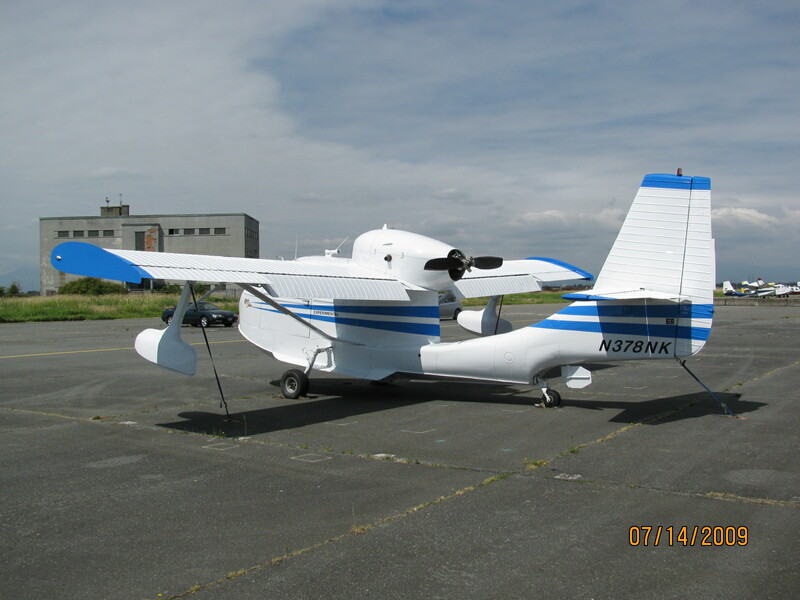 Completed in late 2010 by Avian in Bremerton WA, it has been flown only 47hrs since then. 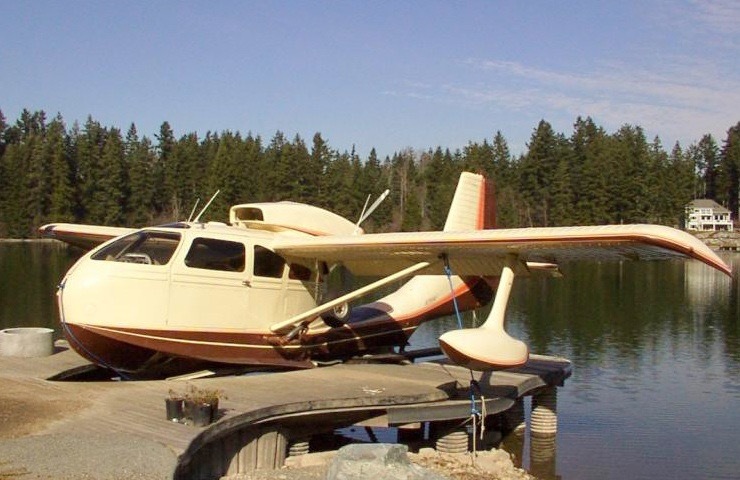 Speaking from experience, there is no way one can one can buy a Seabee and restore it for this price. My loss is your gain. 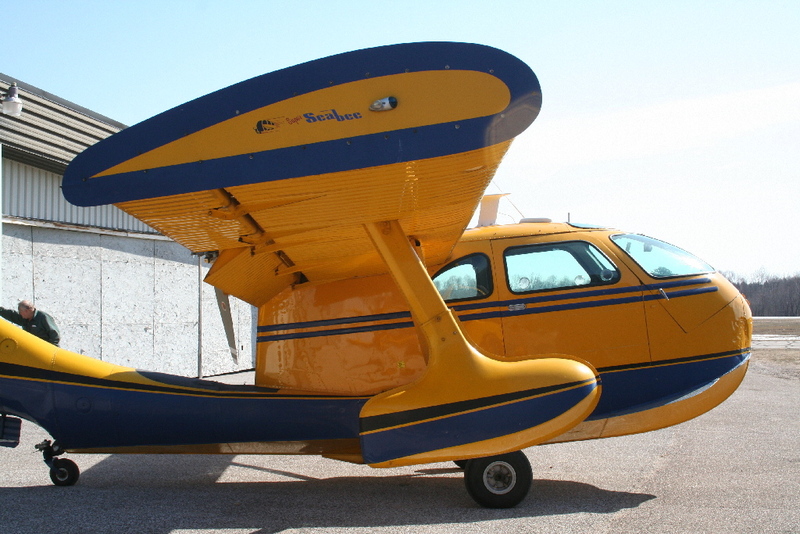 This Seabee has undergone a top to bottom, inside and out restoration. All surfaces have stripped, cleaned and painted. 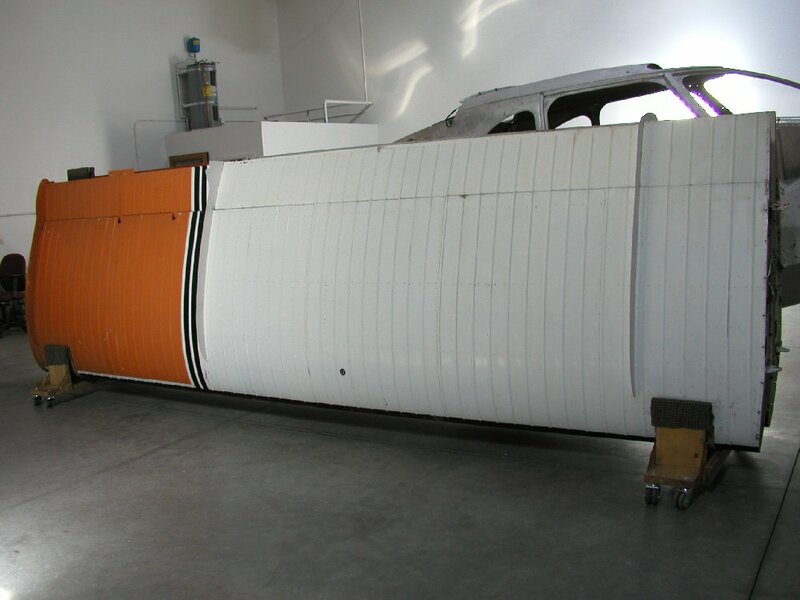 The bottom was removed, the wings dismantled and all control surfaces opened. 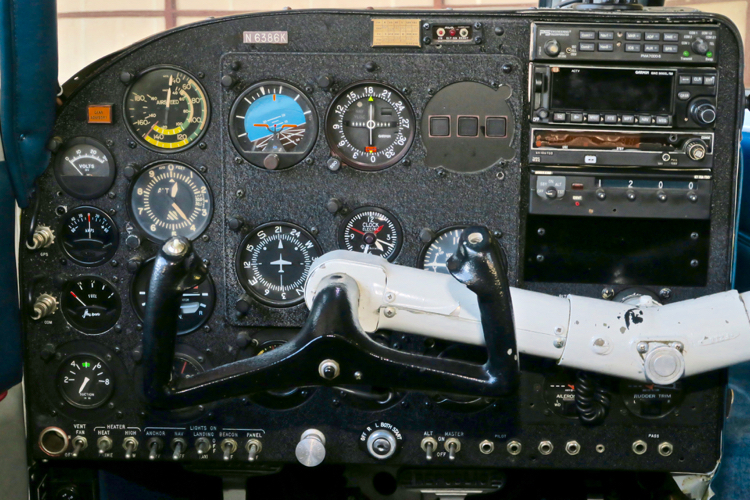 Then the modifications began: IGO480 with a Simuflight conversion and Hartzell reversible Prop, extended wings, Cleveland brakes, auxiliary electric hydraulics, Southwind heater, Whelen Nav/Strobes, landing lights and many more. 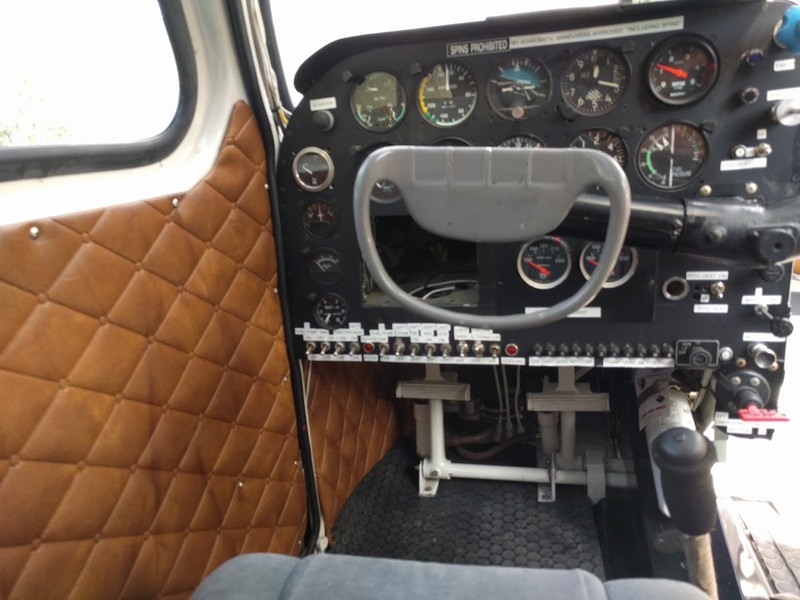 Virtually everything on this plane is new or like new. 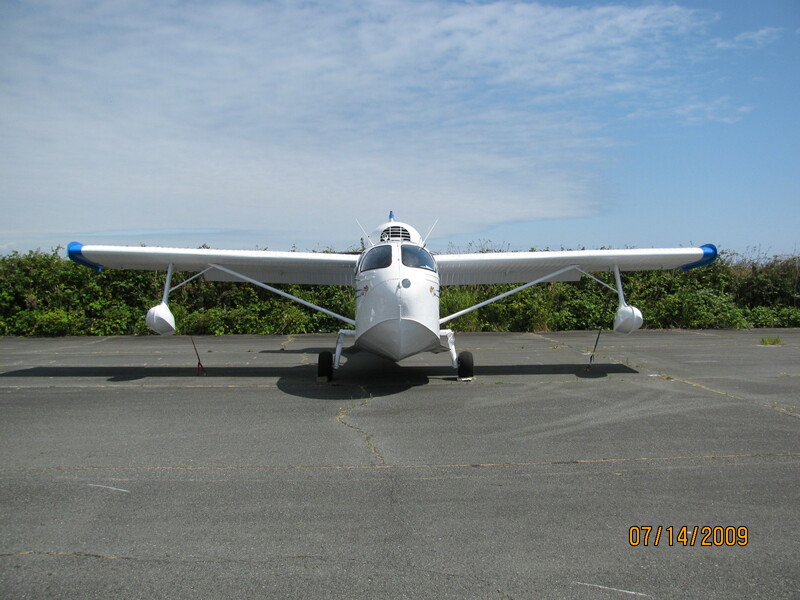 Airframe: Cleveland brakes, Extended wings, Drooped tips, Auxiliary electric hydraulics, Southwind cabin heater, Landing light, Whelen Nav/Strobes lights, Flush fuel filler,180 degree doors, Bilge pump with multi compartment selector, Completely stripped cleaned and painted inside and out on literally all surfaces. No corrosion. All new hydraulics. All new control cables. 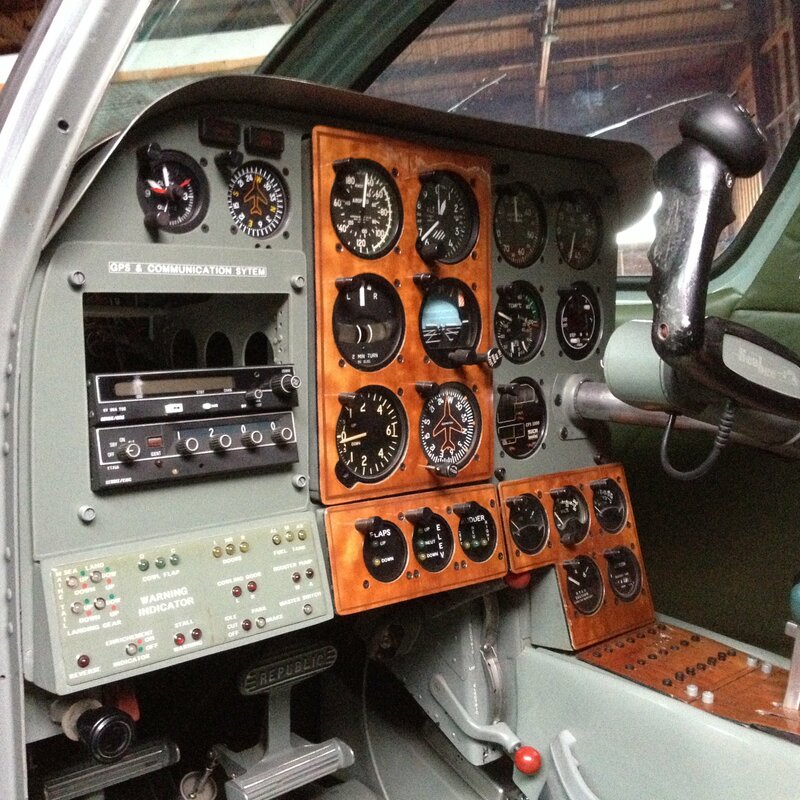 Avionics: All new at time of restoration. 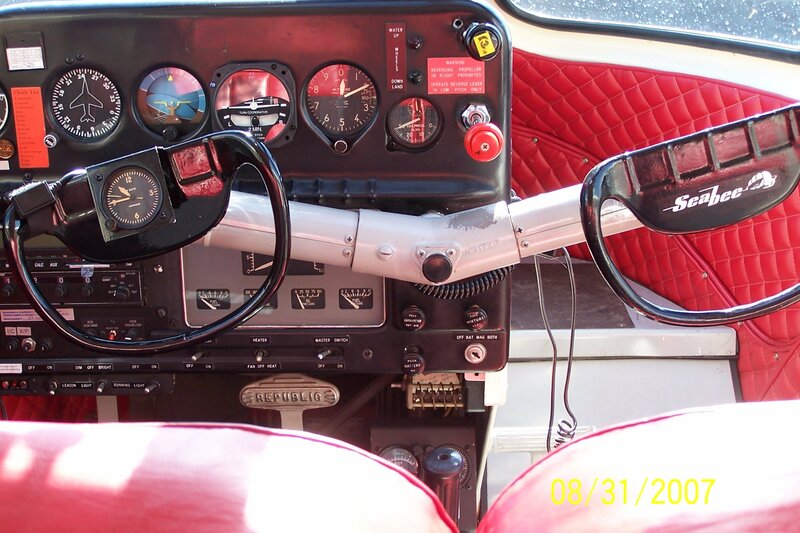 Terra Nav/Com, Terra intercom marker beacon, Electronic International, Bendix Transponder, All new wiring. 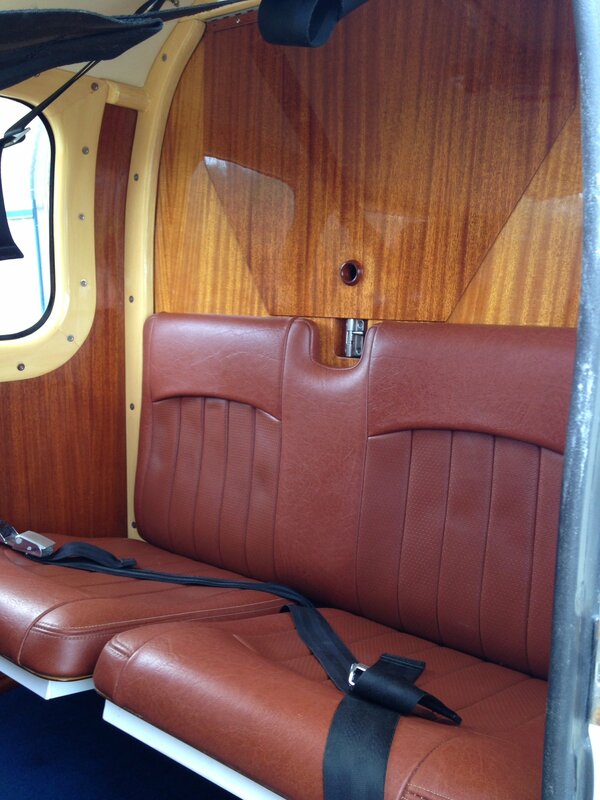 Interior: Beech Musketeer seats, Leather / Fabric interior, Headliner & carpet, Cabin lights. 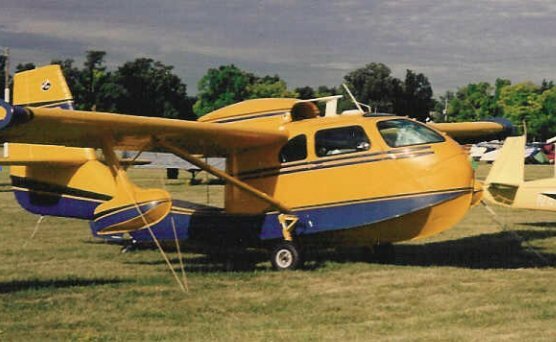 Jim O'Donnell is selling his Seabee. Jim has had a recent serious medical issue and needs to find a new home for his machine urgently. 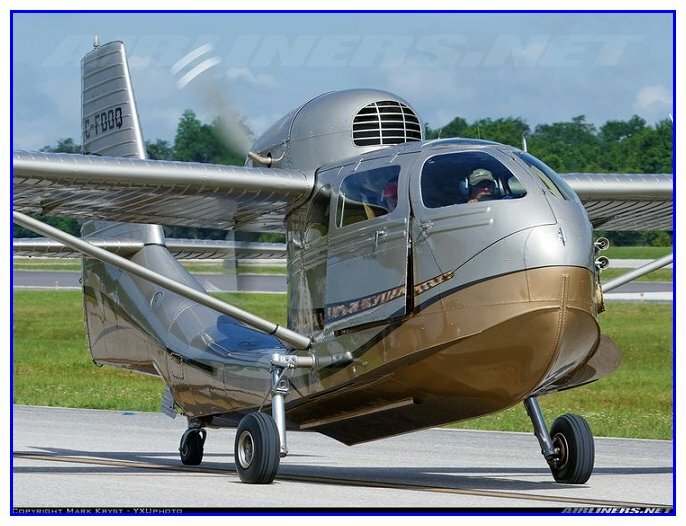 Below is a PDF file listing all the modifications to this wonderful Seabee. If you have trouble reading it, let me know and I'll send you a different file. Asking: $160,000.00 Any reasonable offer will be seriously considered. Super Bee for sale. 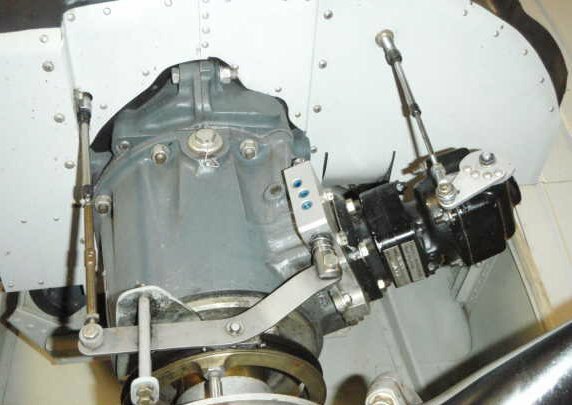 Lycoming GO-480-B, 130 hours SMOH, "0" SMOH on Hartzell 3 blade propeller. 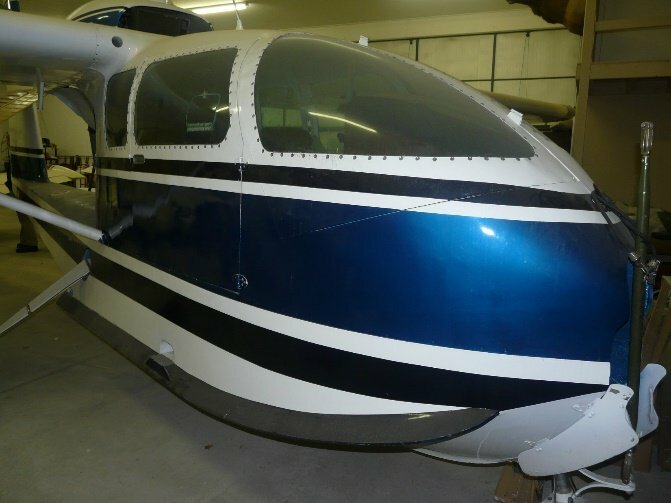 King KX-155, KT-76A, encoder, strobes, wide spray rails, tight hull, fresh annual, no salt, clean aircraft. 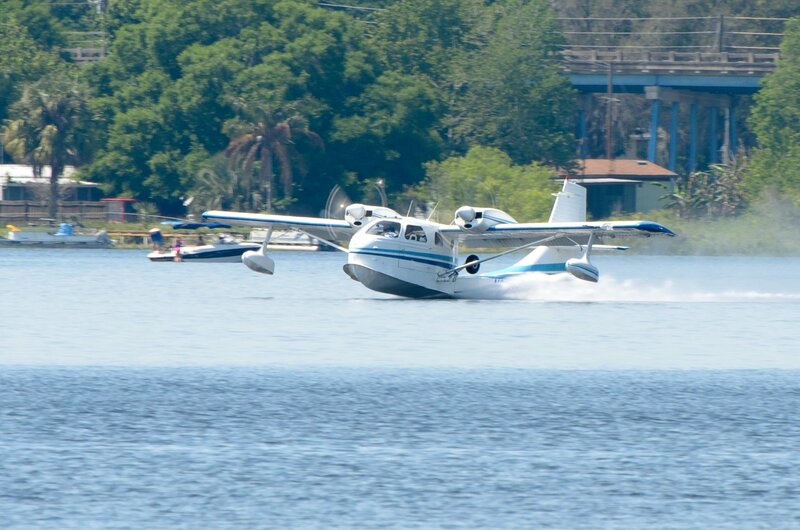 Hangared at Jack's Seaplane Base, Winter Haven, Florida. 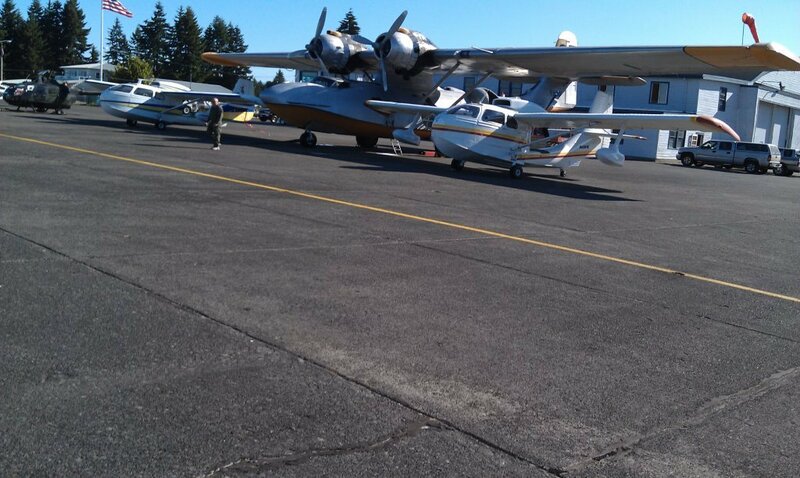 TTAF 699 hours and the Franklin -B9F engine has about 546 hours SMOH. Prop 99 hours SMOH (in 1999-due for inspection). 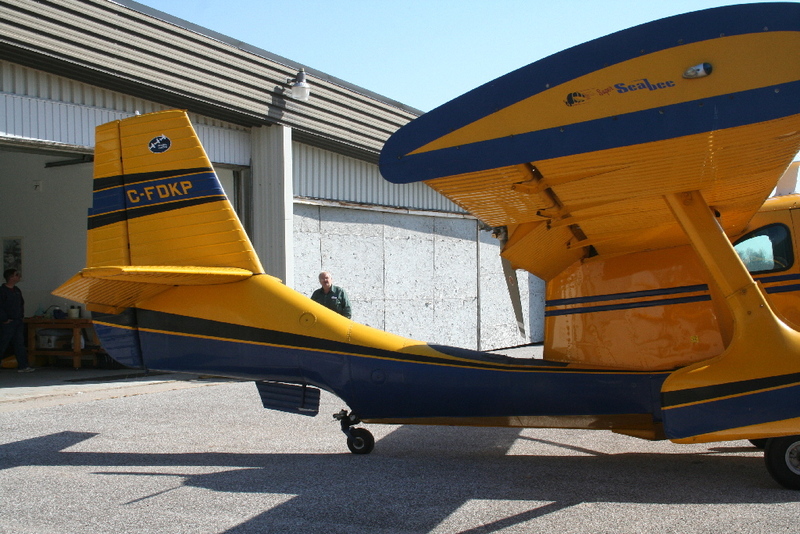 Complete with extended wings, Daubenspeck droop tips, extended spray rails and many spares. It has always been hangared. 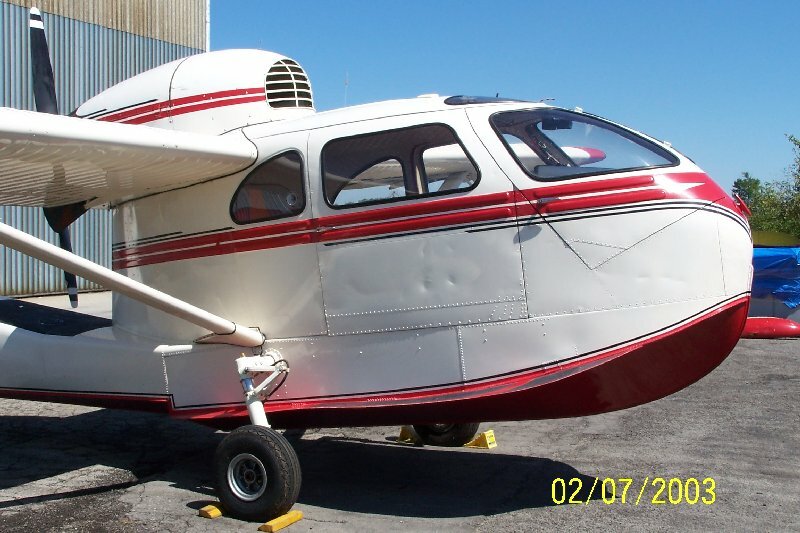 It is the most perfect airframe you will ever find for an engine conversion. 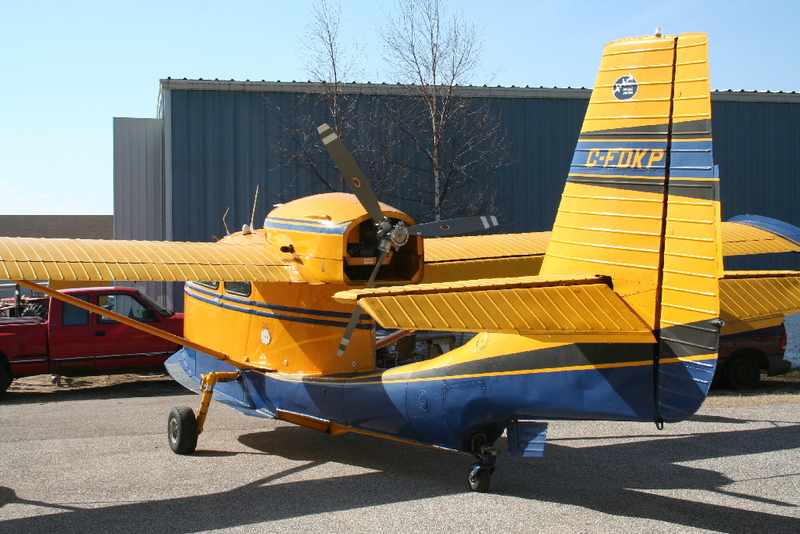 This aircraft is priced as an airframe, but could be flown with its Franklin engine. 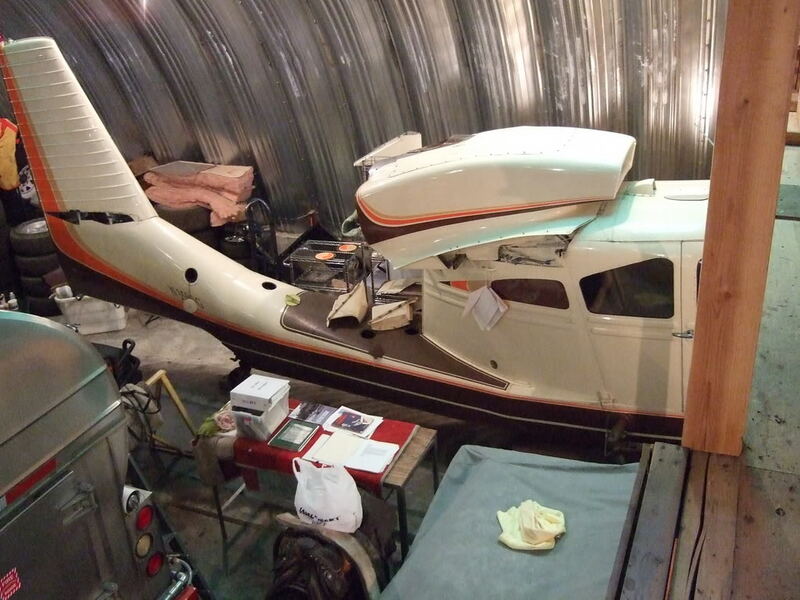 It has not been flown in several years, but is tucked away in a heated, dehumidified hangar. 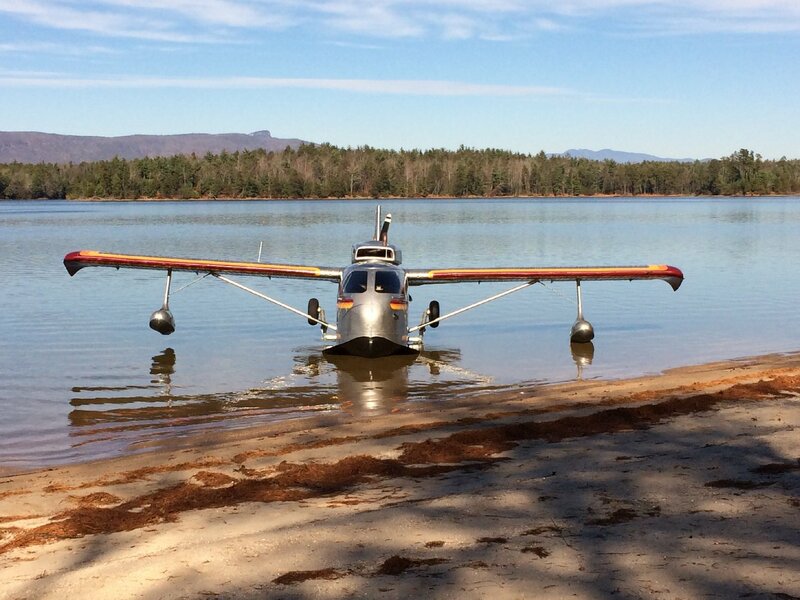 It has never seen salt water or been submerged and has all logs. 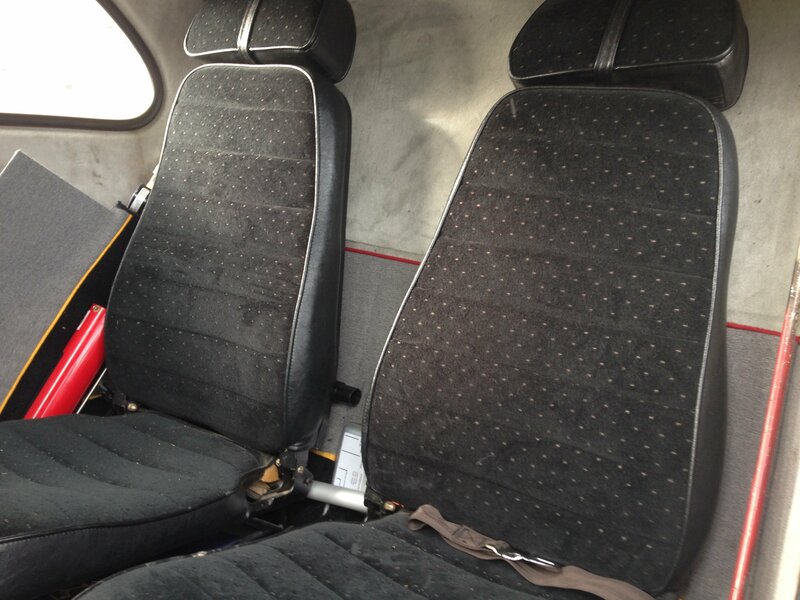 Paint and interior are in excellent condition. $65,000 or best offer. 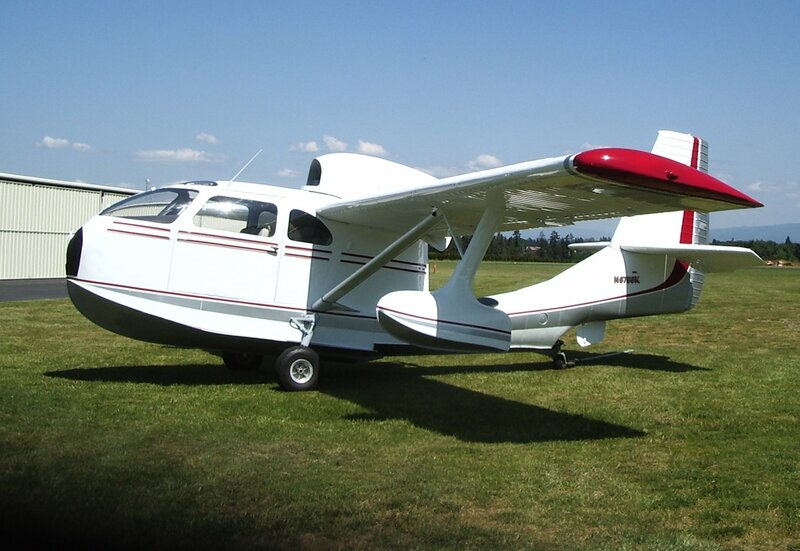 We have our Seabee for sale on the club website. 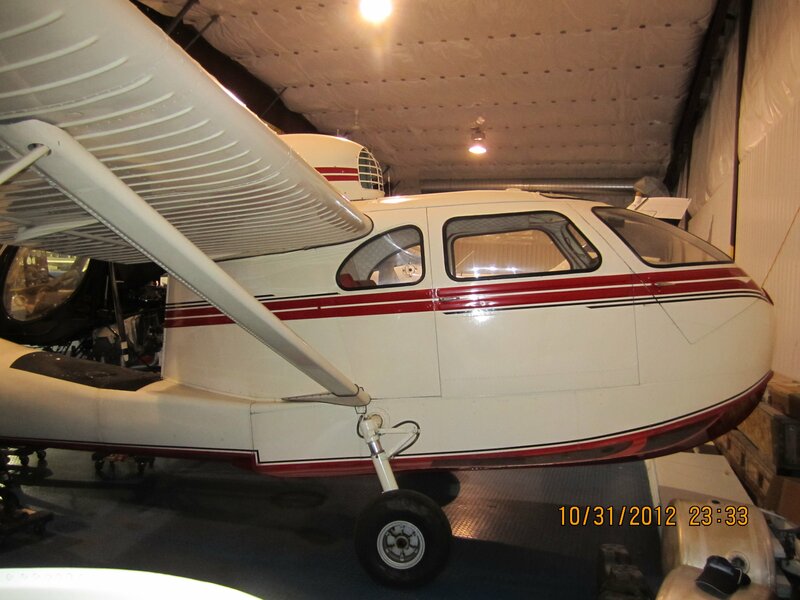 We’re having trouble selling it and are considering parting it out, we need the room in our hangar. I have sent a few more pictures in hopes that they will create some interest. I couldn’t send them all in the same email so I sent them one at a time. See the spec sheet here (PDF). 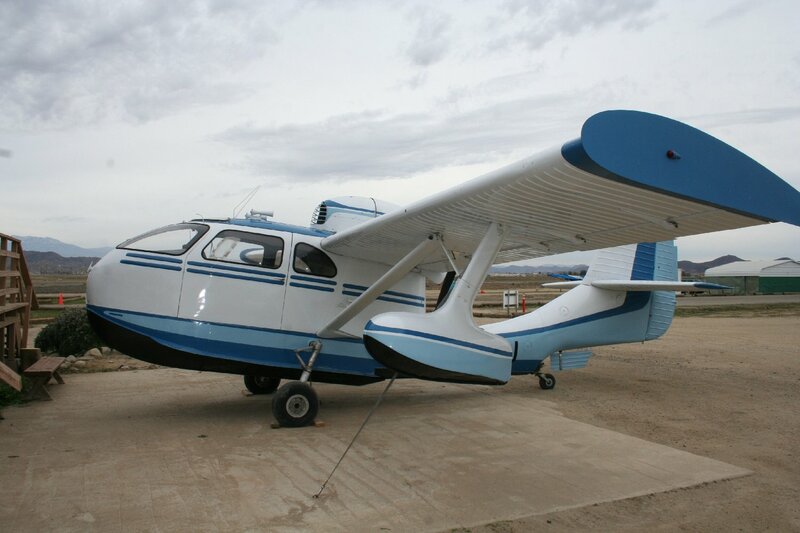 Republic 1947 RC3 Seabee. 1037 TT. 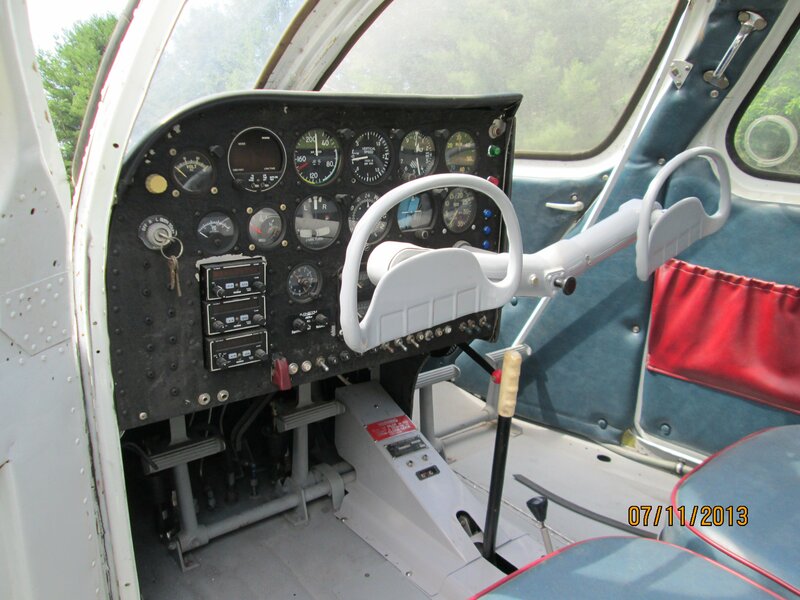 186 hrs since complete restoration by WE AEROTECH and SIMUFLITE, since NEW prop and SMOH IGO480. No corrosion/salt since restoration. Hangared. 10/10. Too many extras and mods to list. 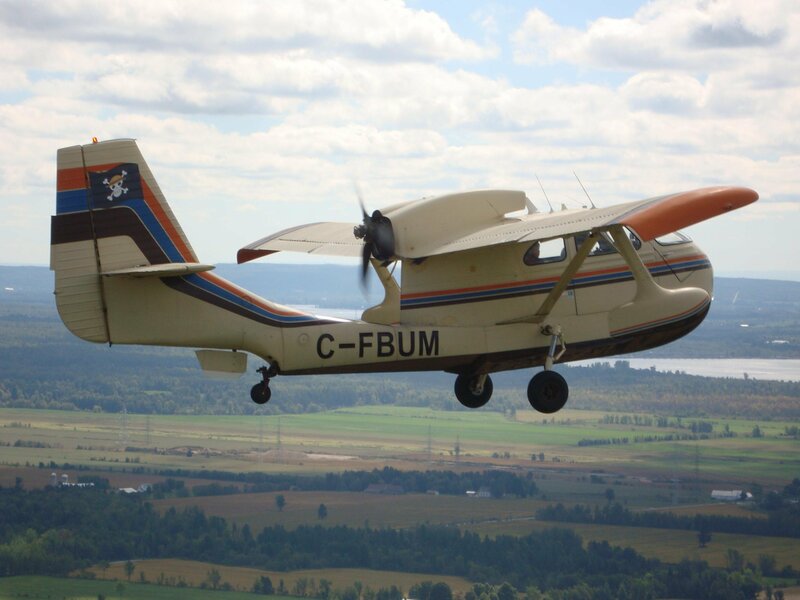 Likely the best Seabee out there. All logs and paper. Prop: 186 hours since NEW MV hub mod Simuflite reverse valve. 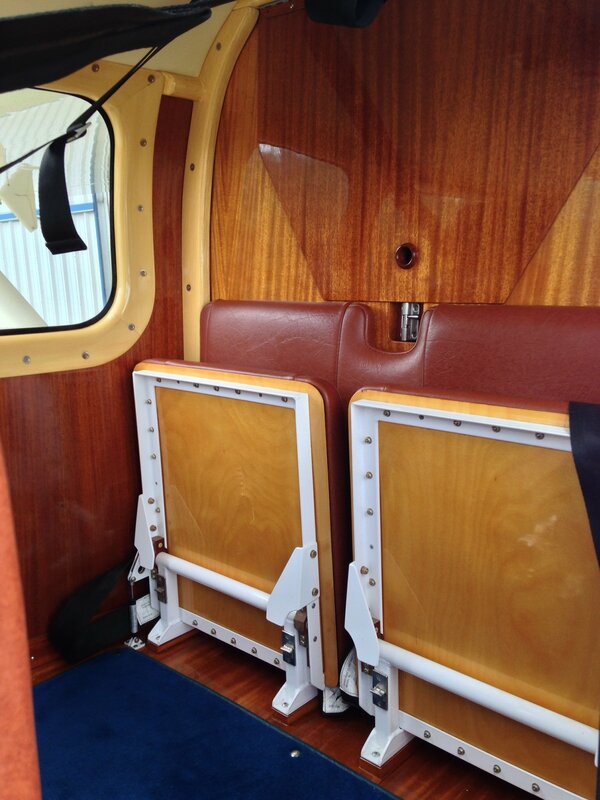 Locking tailwheel, New fuselage strut fittings,Droop wing tips. 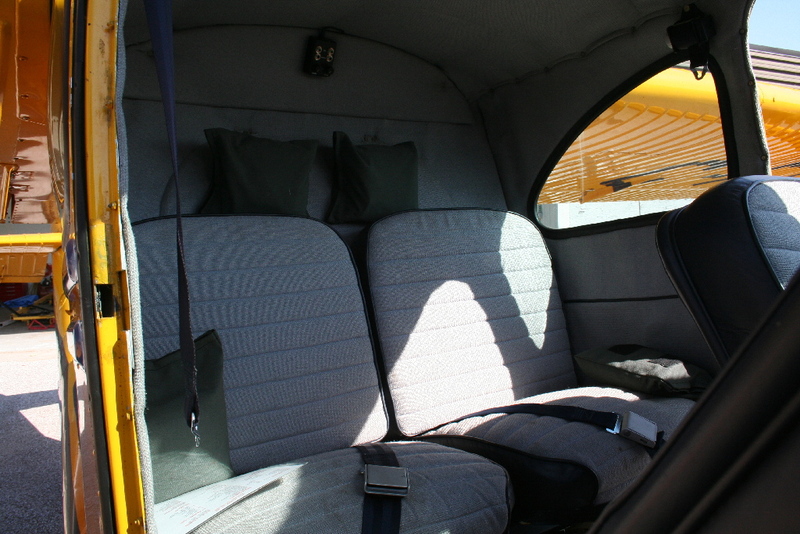 Wing extension, Flush filler cap, New fuel bladder, Large spray rails and strakes. 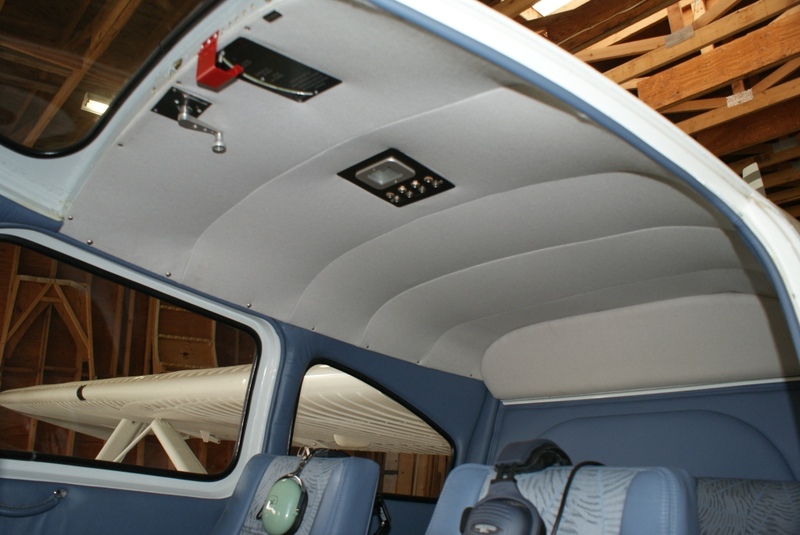 for GPS update, Towbar, SOSuspender life vests, Corrosion X applicator, Canopy cover. Extended wings, droop tips, extended spray rails. 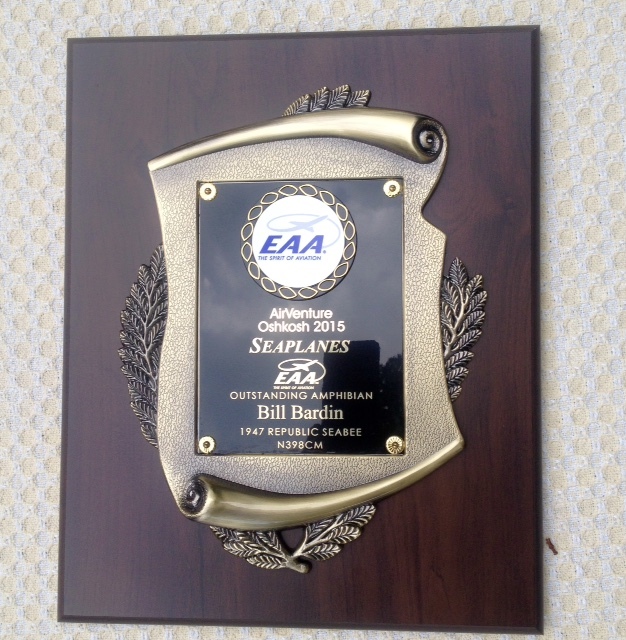 Airframe Total Time 1040 Hours. Sale will take place after June 30, 2008. Offers can be emailed to me at jzantop@aol.com. More information is at www.skybronco.com under the Classified Button. 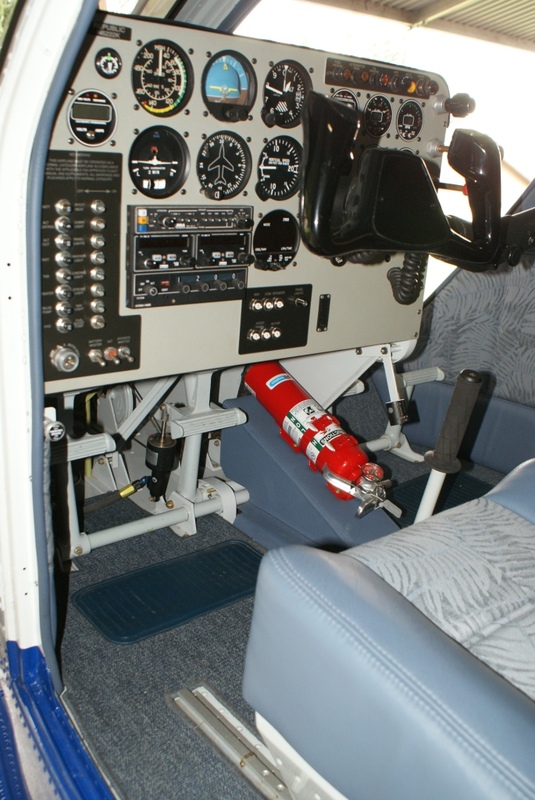 Simuflight GO480-B1A6, 270-HP, 80 octane, logs since new, 9/16/46. 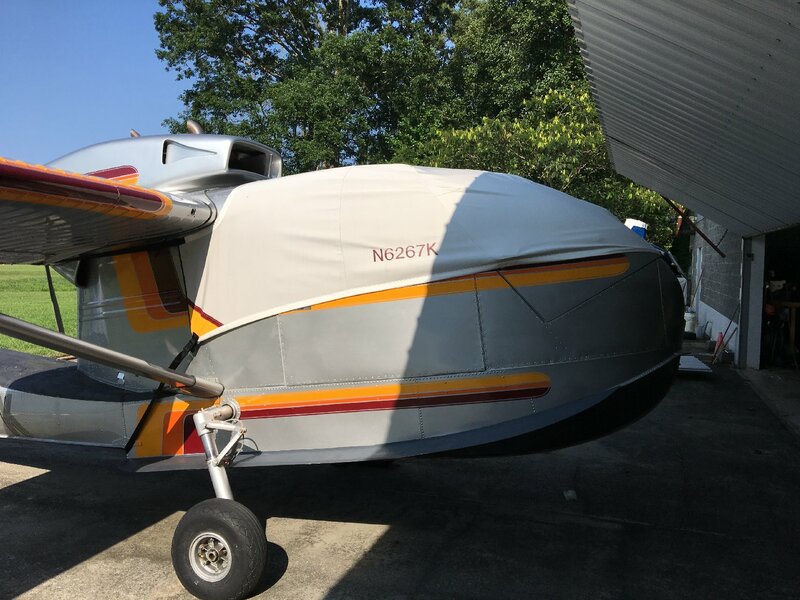 Hangared, TTAF 2188, Engine 600 hrs since overhaul 10/86, Reversible Prop 322 hrs since overhaul, 5 yr. repair last year (same as overhaul), Landing light on each wing tip. 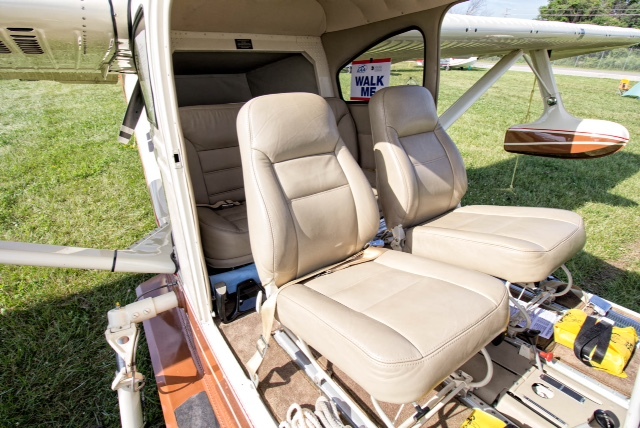 Overhead engine controls, Large spray rails, Full swivel Locking tail wheel, Cleveland brakes, Whelen three light strobe system, Daubenspeck droop wing tips, KT 76A transponder, KR 86 ADF, KY97A Comm., Narco 122 Nav., Northstar M2V Loran/GPS. 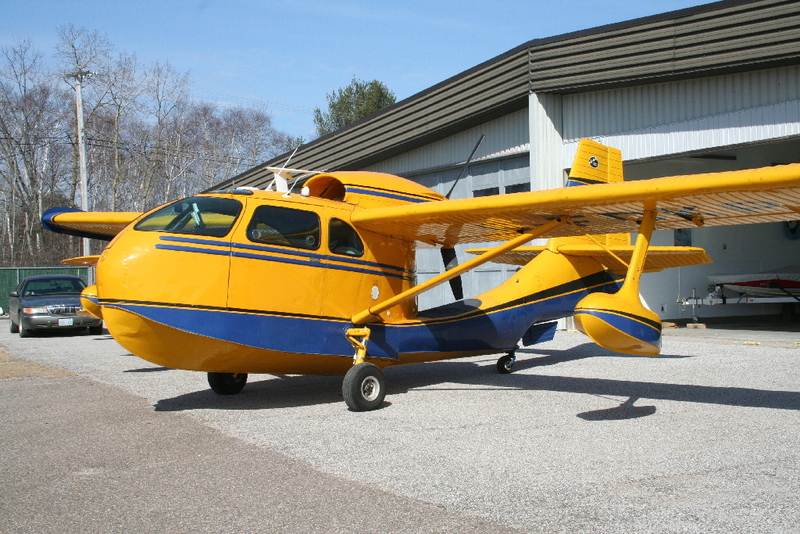 1947 Seabee N6755K, S/N 1043, Recent restoration, T.T. 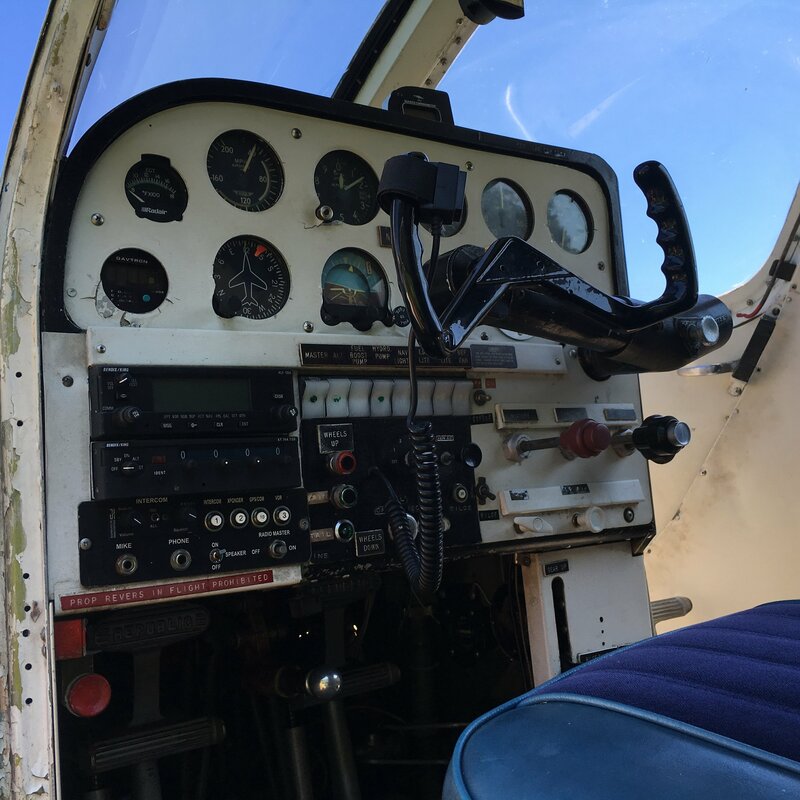 650, Engine & Prop 17 SMOH, Alternator, Airwolf Oil Filter, New: Glass, Paint, Interior & fuel cell in '07', wide spray rails, wing extensions, overhead quadrant, Clevelands, inboard strakes, steerable T/W, all logs, hull stands and work station for fuselage, tow bar, spare airworthy B9-F available. Located in Wilsonville, Oregon. 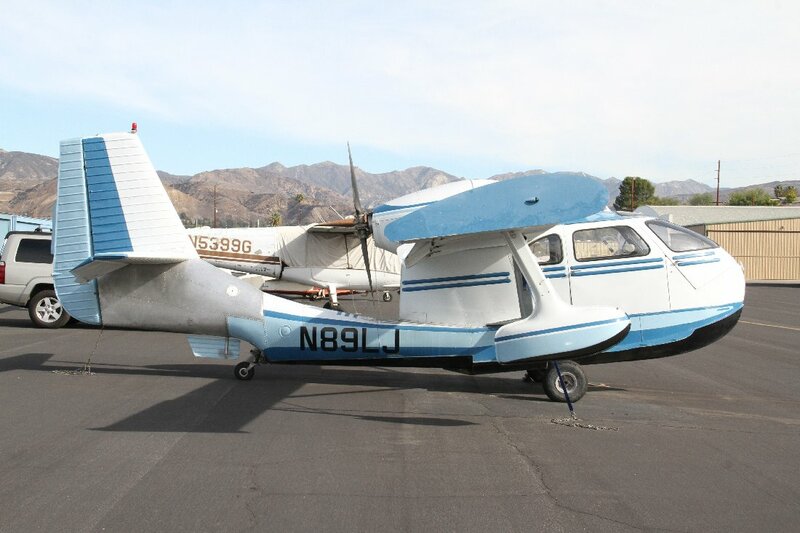 I am selling Serial #663, N60CB, for the owner in California. You may have known the owner, Gaylin Tustison. 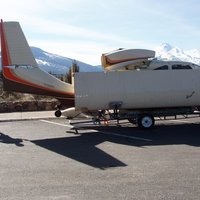 This is the airplane which was covered in a story on your website when the owner purchased the airplane in New York 3-years ago and flew it out to his ranch in California. 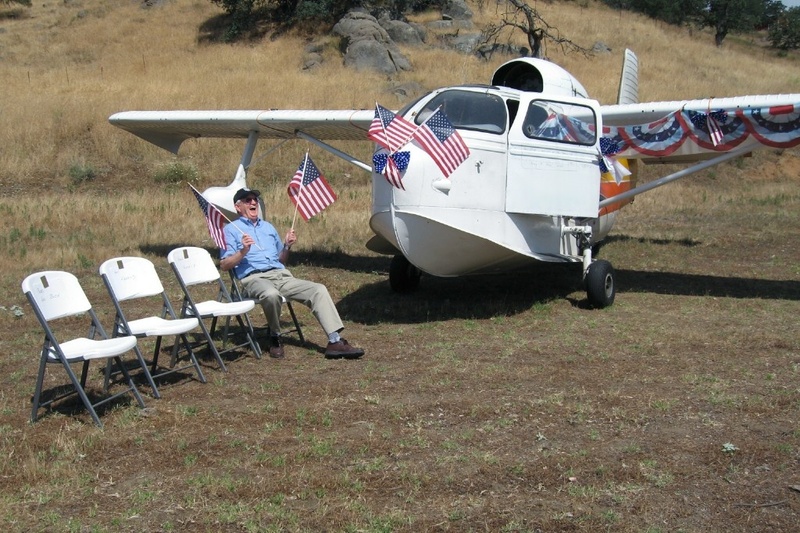 After his arrival in California, a wild-fire burned through the ranch, destroying his home, hanger and airplanes. 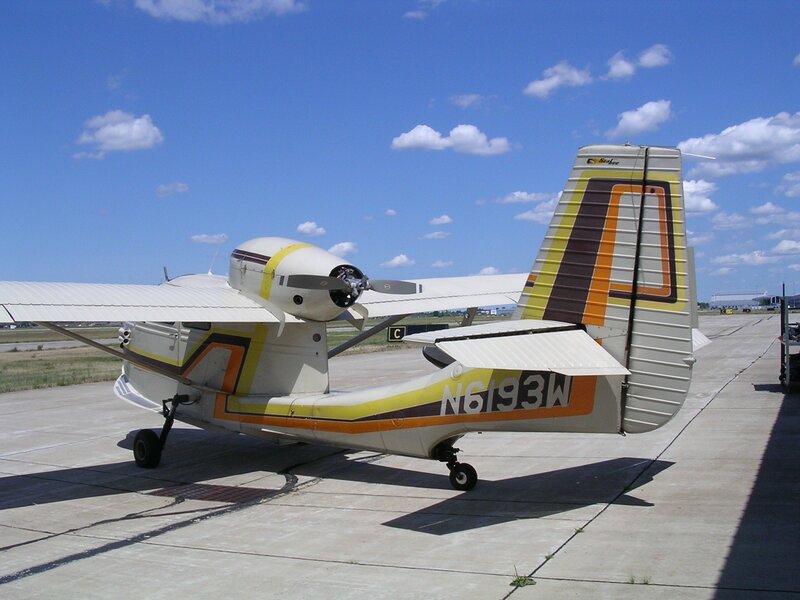 The only aircraft to survive the fire was the Seabee, however all logbooks were lost in the fire. Based on the times we have tried to reconstruct from the previous sale, it has 2,070 TT, and approx. 200 SMOH. 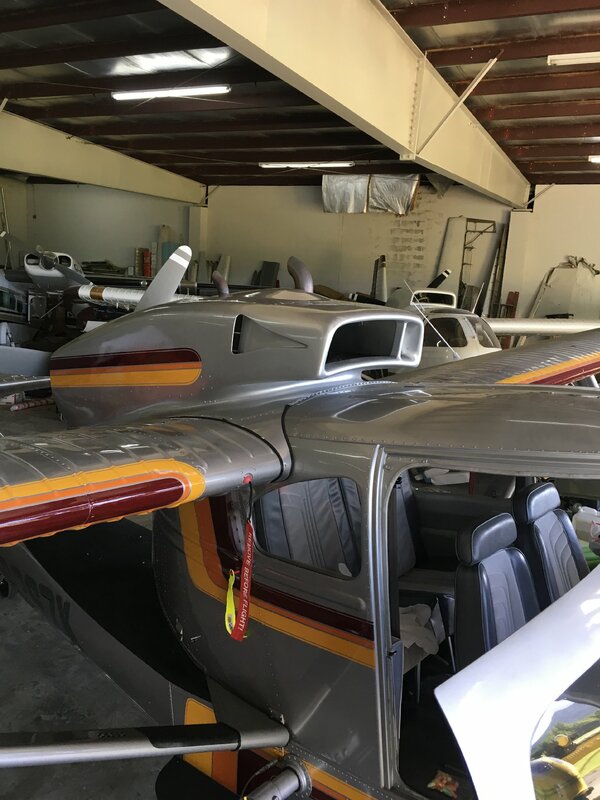 The prop condition was documented in the story on your website, and it appears that it was overhauled when he bought the airplane. Mr. Tustison has since passed away, and as a friend of the family, they are directing all inquiries through me. 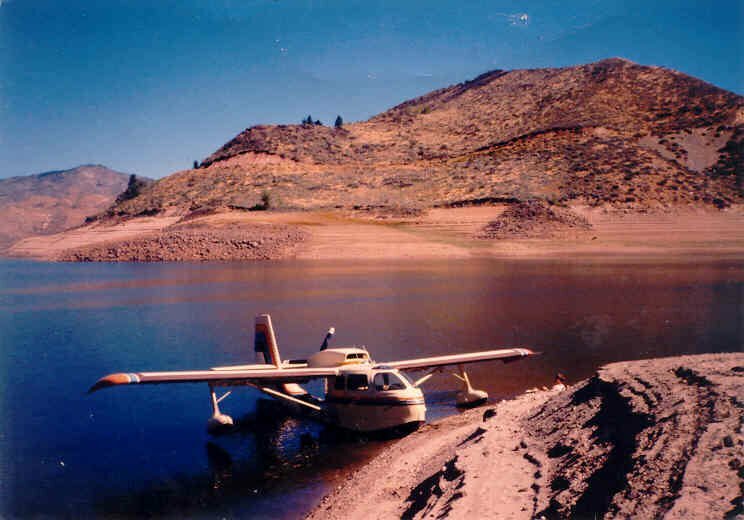 The aircraft must be hauled out by truck, as the ranch runway is too short to fly out of. Price Reduced! : $22,000.00 $18,000.00 USD. 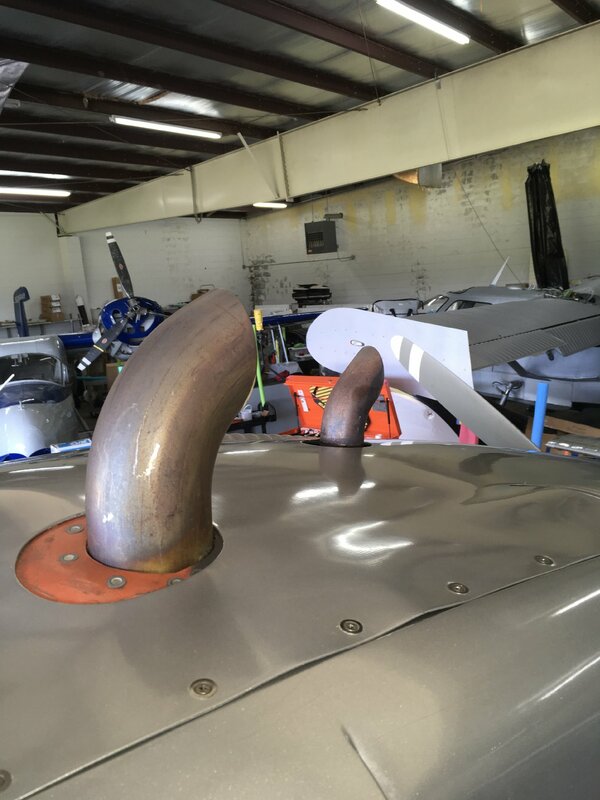 Please contact Steve Oden at (317) 285-8400 or e-mail Steve.Oden@andrettiautosport.com. Brian Robinson Corvette Engine conversion, with approx 80 hrs since new. 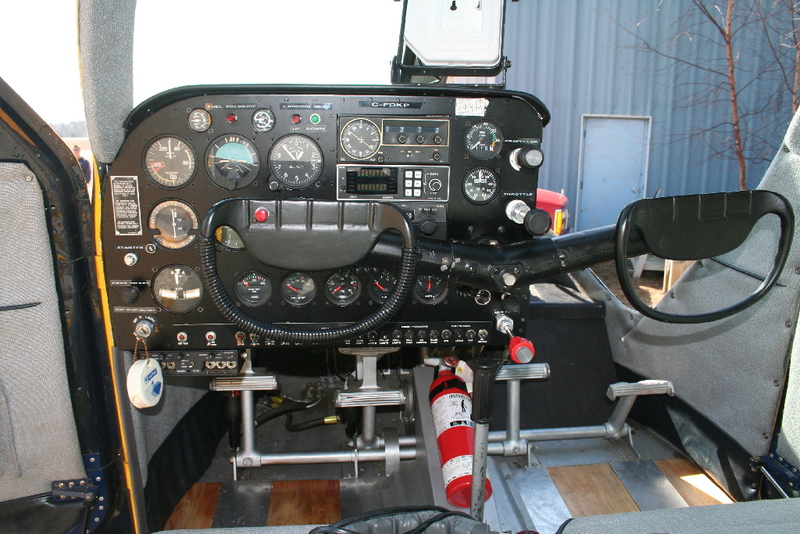 Fully computer controlled Fuel & Ignition Features. 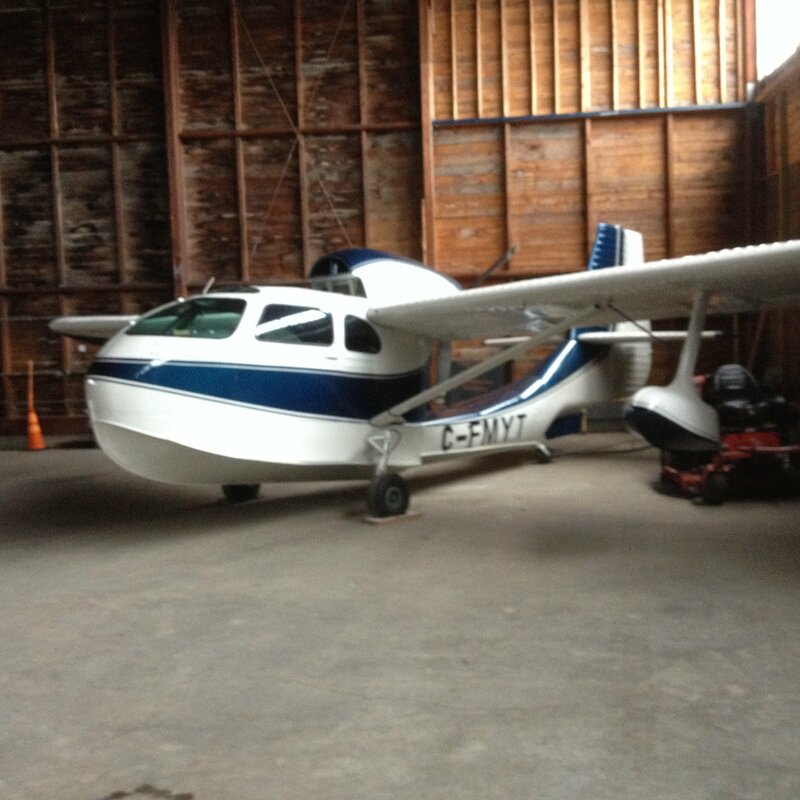 Aircraft Hangar’d at Boundary Bay Airport near Vancouver B.C. 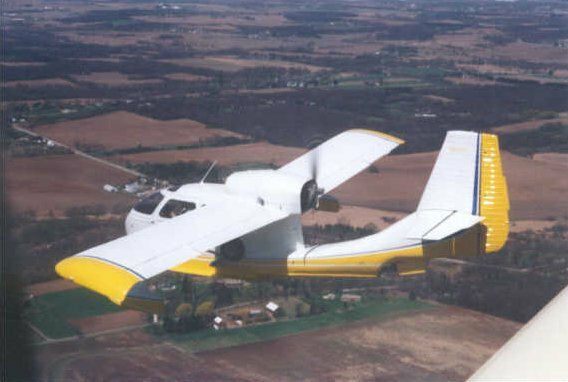 ”Don't miss this rare” V-BEE “,it is a great aircraft. 1200 lb useable load. 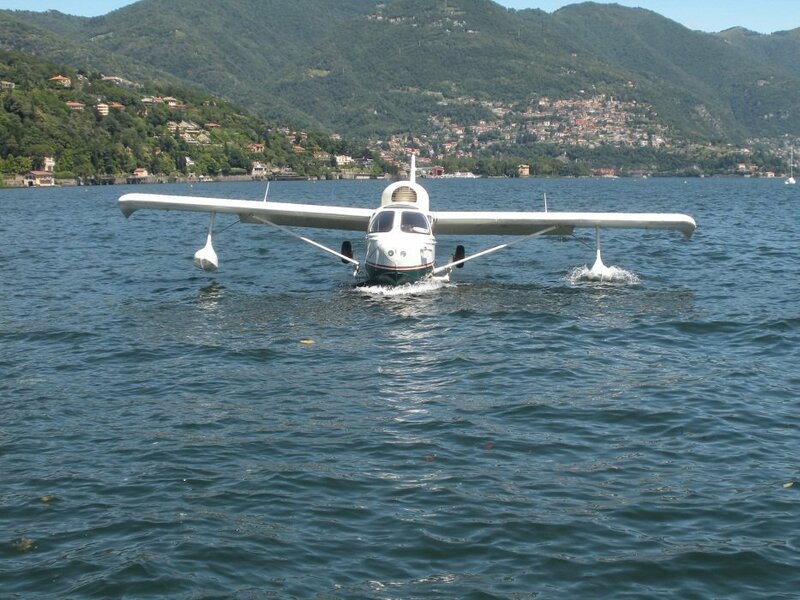 Less than 10 U S G premium AUTO fuel or 100 LL per hour, No oil added between oil/filter chgs, GREAT performer, At Sea level,with aircraft at max gross T/O weight 3350 lbs., rate of climb, over 600 F.P.M. 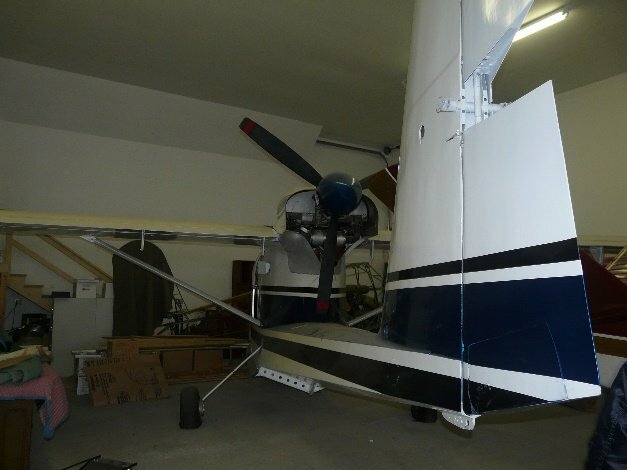 fully reverse-able Prop With Brand new Hartzell METAL blades, prop thru shop, New bearings & hardware Wide spray rails, w/propeller "No-Spray shield" at hull step, works great. 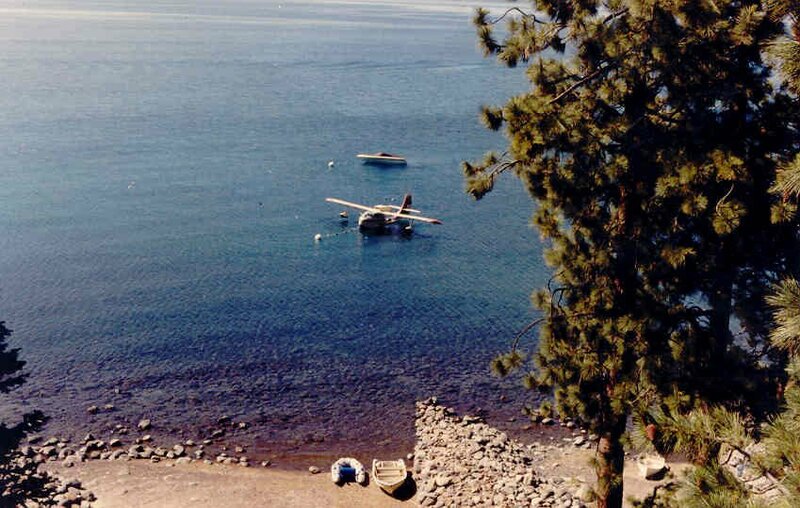 Spectacular T/O performance, off lake @ 2,000 ft Alt. even off calm water, at full gross weight, 19 sec's. 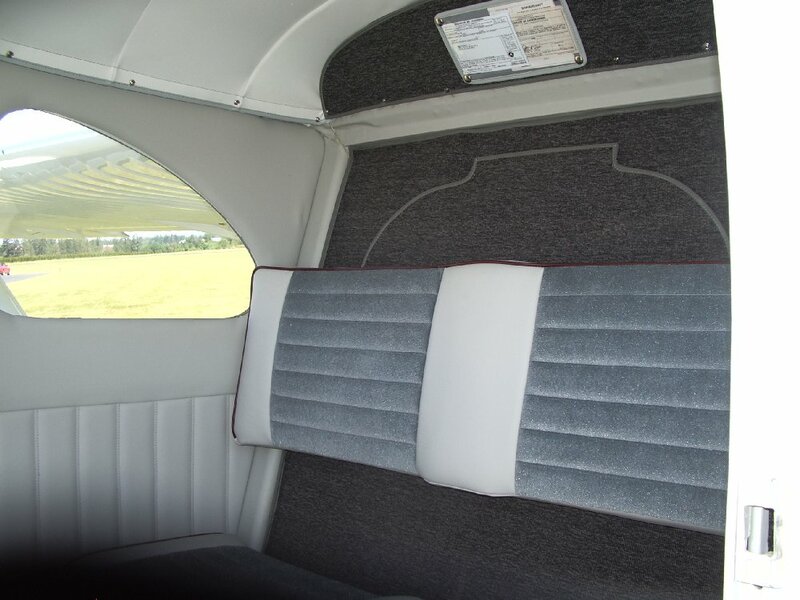 All new windows, all new stainless control cables, bow door w/auto hold open feature. 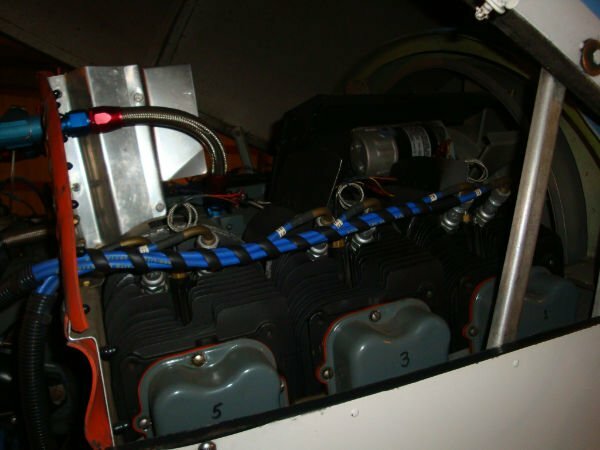 Aircraft totally re-wired, standby alternator, split-able dual battery system. 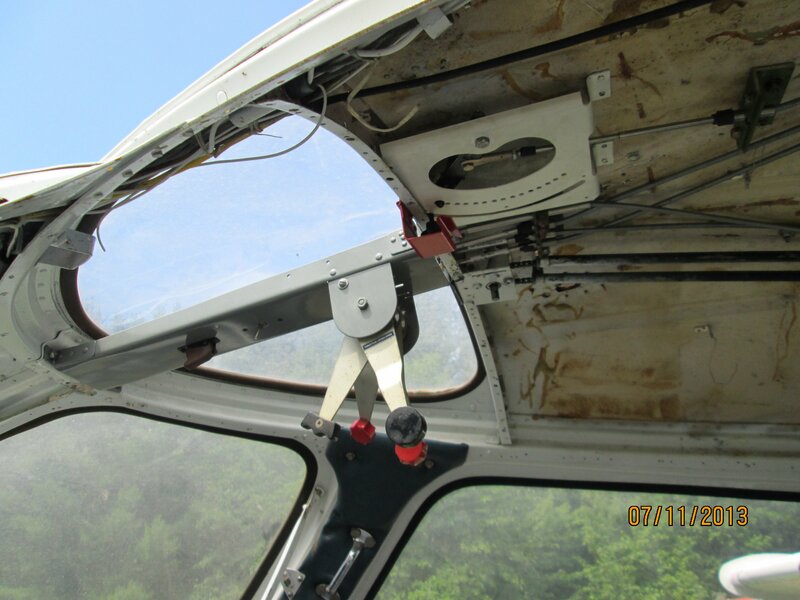 Cabin heater & defog system, free fall undercarriage with positive downlock feature. 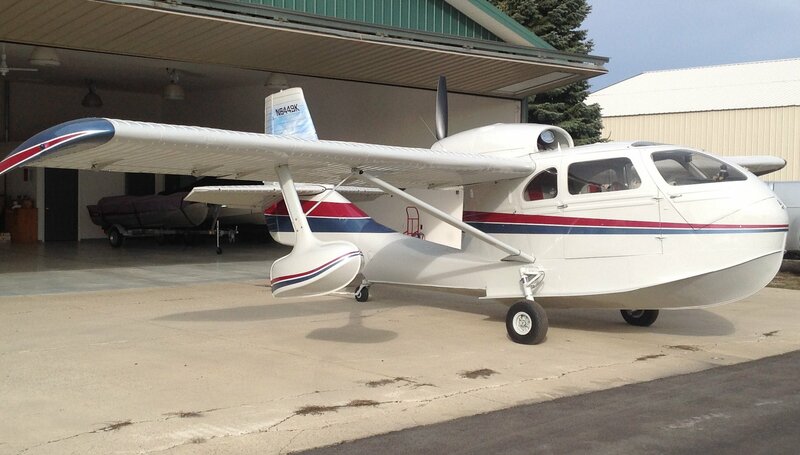 Black stainless disc brakes, good tires and positive tail wheel lock, new 75 gal fuel bladder. 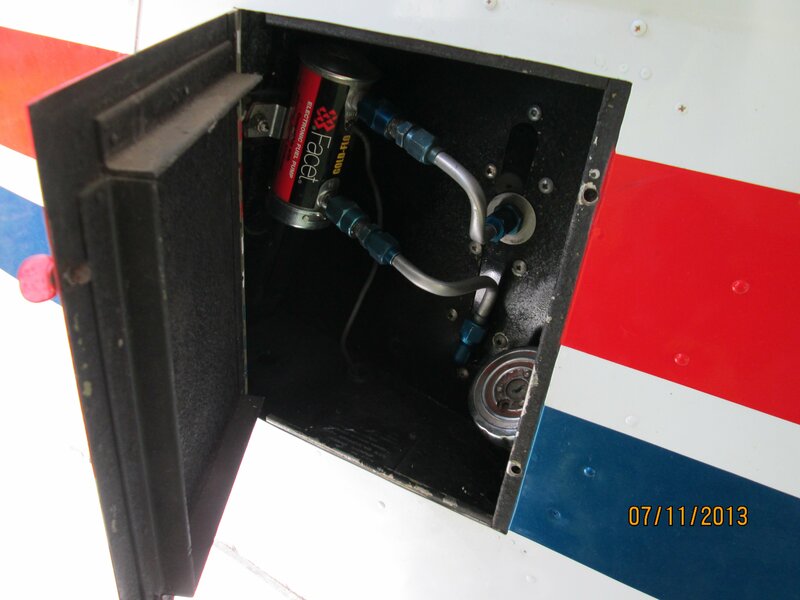 Capacitance type fuel tank guage system, Removable 15 gal long range aux fuel tank. New paint & new upholstery & carpet 3+ years ago, Always Hangared. 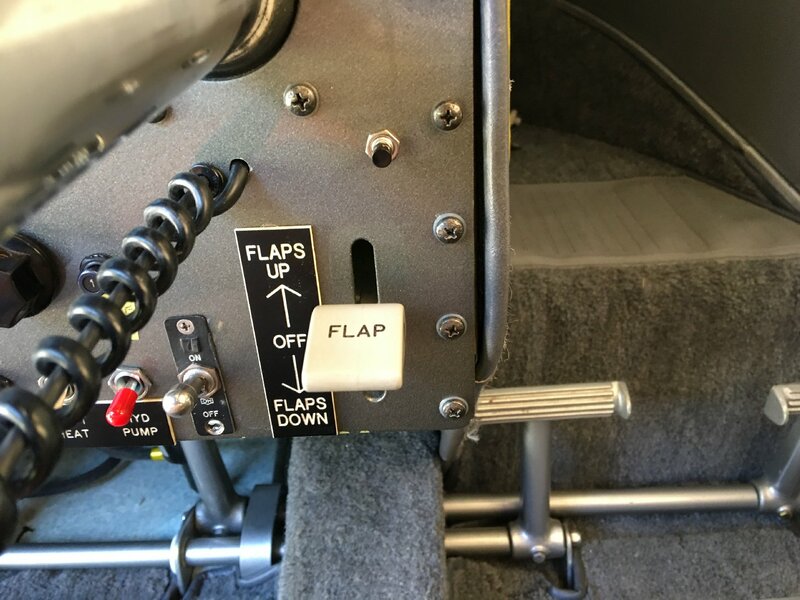 Short wings, splate tips, flasher beacon. All new Inst. 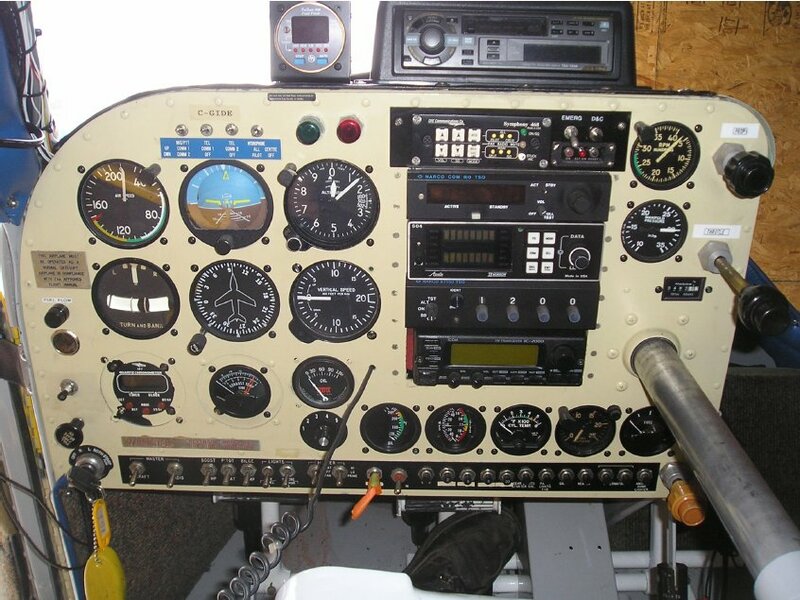 panel with COM, transponder, stdby nav/com, Garmin 100 GPS, vertical compass, Vac. 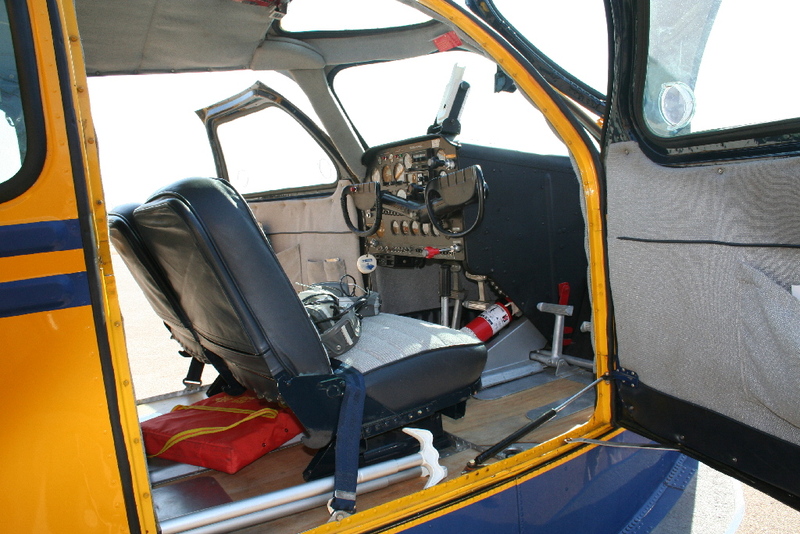 gyro horizon, Super landing light in nose, some spares, and many more extras too numerous to mention. Log books up to date, Annual inspection just completed 2011. Asking price $115,000.00 Price reduced! $99,000 OBO. Comes with all the spare parts. 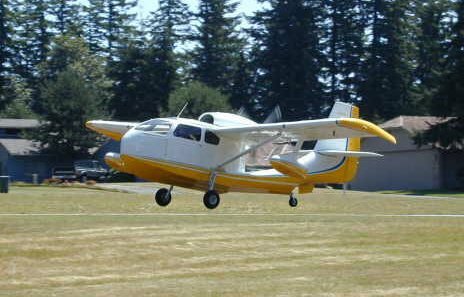 RC-3 Seabee for sale. 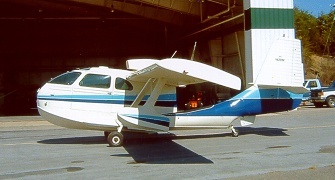 Franklin 6A8-215-B9F. 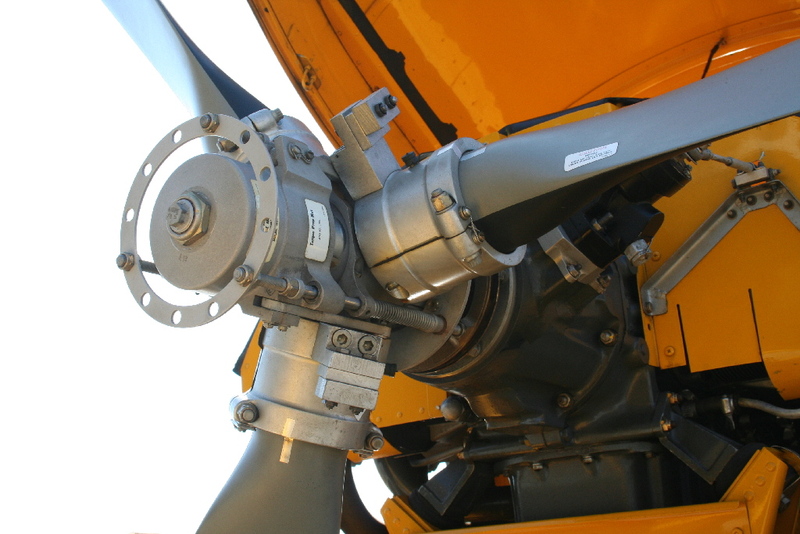 Hartzell HC-D2V20-3 propeller. ACK A30 Encoder, P.S. 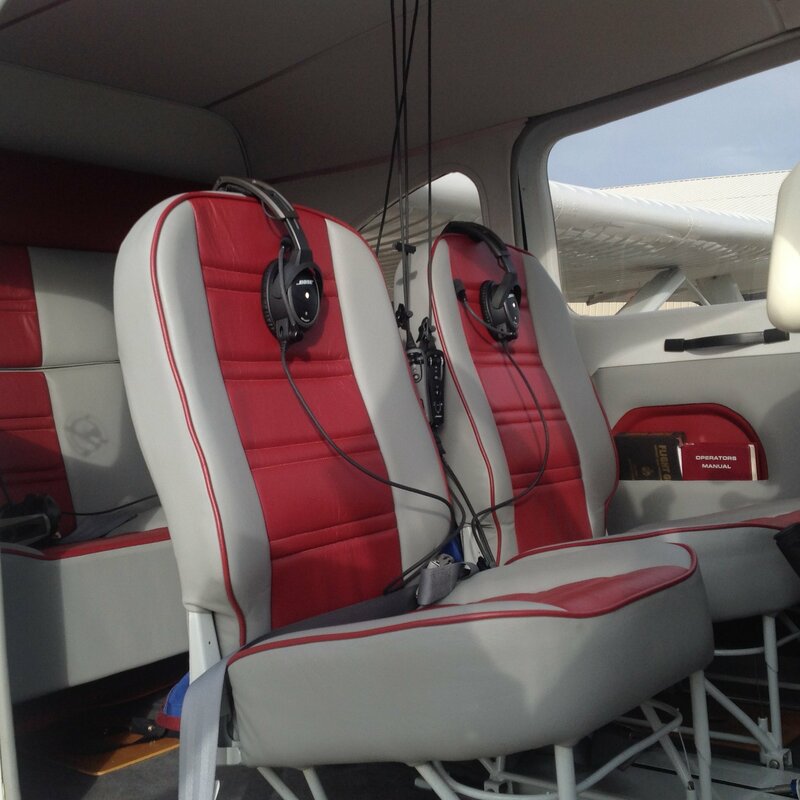 Engineering PM 501 Intercom, Insight Graphic Engine Monitor GEM-602, Taxi and Landing Lights in wing. Asking $90,000.00 Reduced to $80,000 or best offer! 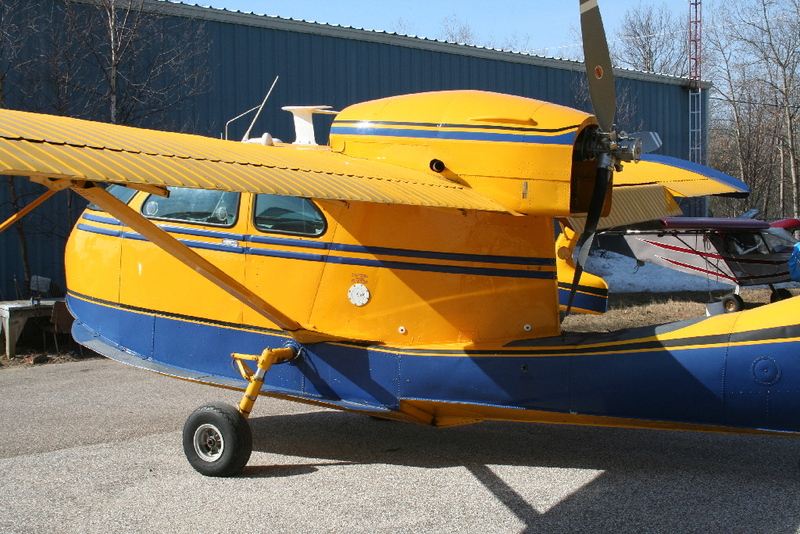 1947 Republic Seabee #371, 1078 TT, 390SMOH on Franklin engine, steerable tailwheel, wingtip extensions, new fuel bladder, Great shape, records since new, fresh January Annual. Priced to sell fast! 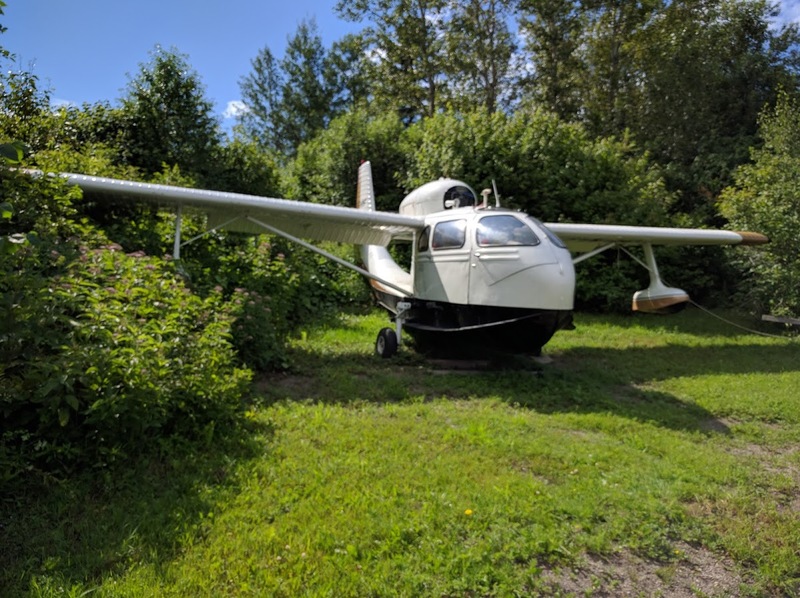 Asking $45,000.00 USD. Telex TC200 intercom 4 place. Beautifully restored (1991), excellent value, lost medical, reluctant to sell. 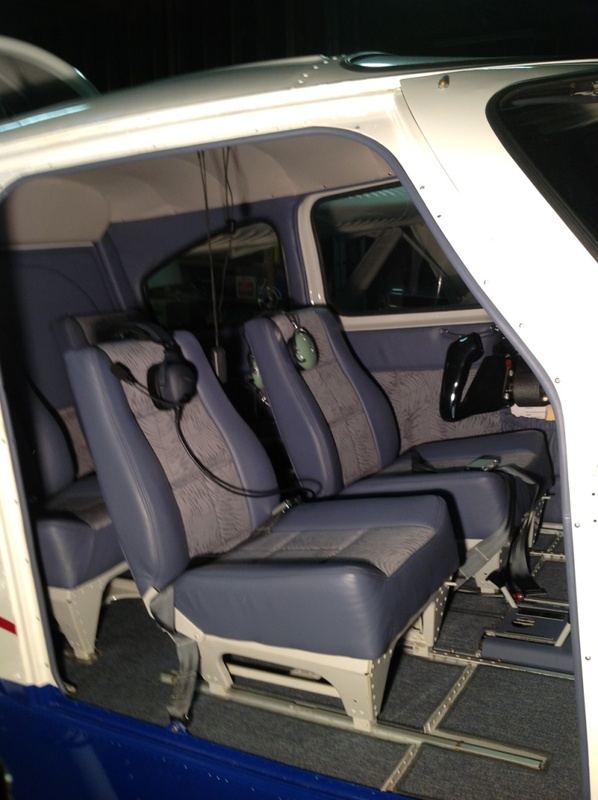 Total Time Airframe: 1200 hours. 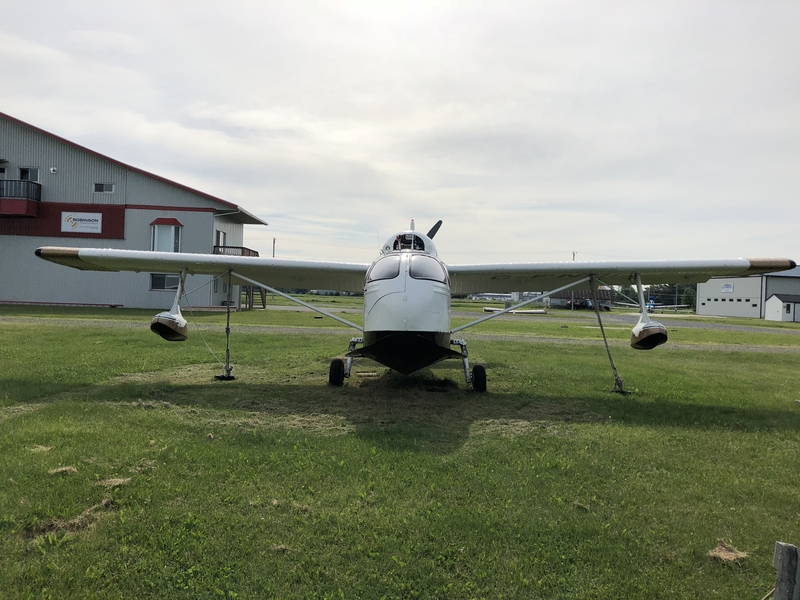 Cleveland Brakes, fresh overhaul on main strut and tail wheel, new hydraulic lines, new control cables, wing extensions with Kenmore drooping STOL wingtips. Annual done April 2010. Empty weight: 2184, Gross: 3150. All 337's for alterations, STC's complete. Logs missing from 1958-1975...have all the rest. Currently located in Warrenton, Virginia, USA. Trades will be considered. 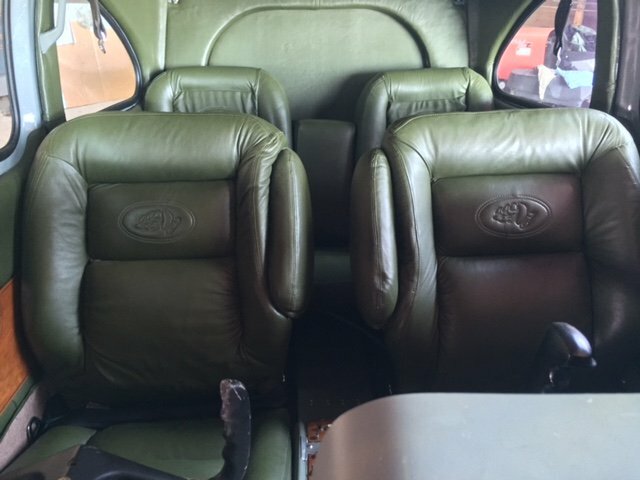 Price: $75,000 Reduced!! $59,000 USD.